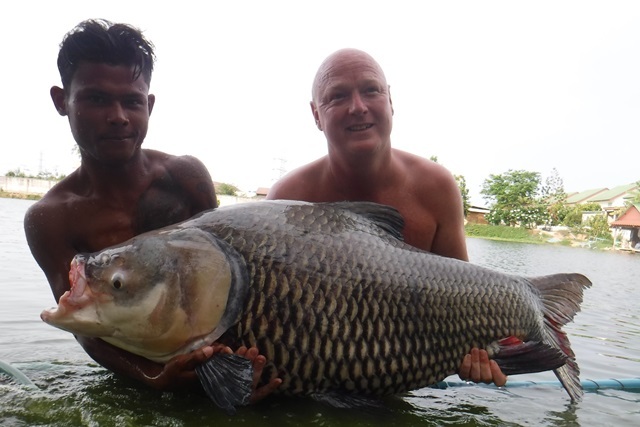 What a session for Paul Duhig had, cumulating in the successful capture of a true leviathan in the shape of a 465lb Arapaima that automatically qualified him for a Palm Tree Lagoon 400lb Arapaima BIG Fish Club t-shirt. 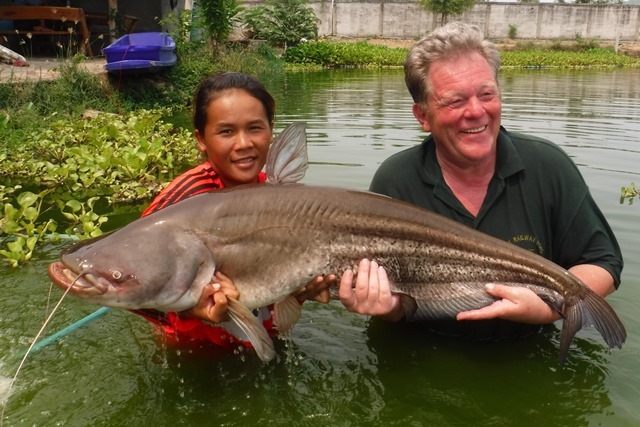 But he didn't stop there, catching a number of other big fish such as Siamese caro to 130lb and Mekong catfish to 170lb. 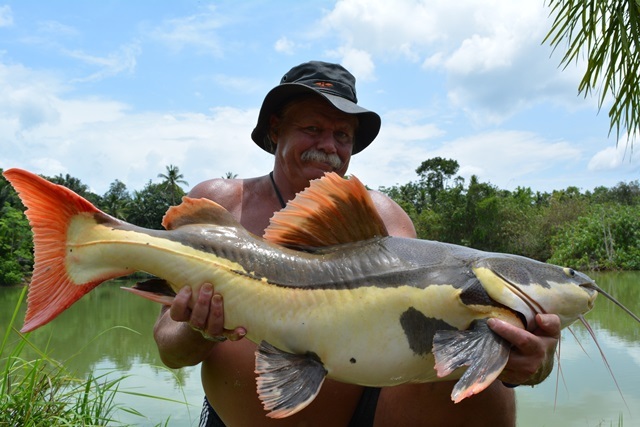 In addition to these monsters he also caught striped catfish as well as both Amazon and Thai redtailed catfish. 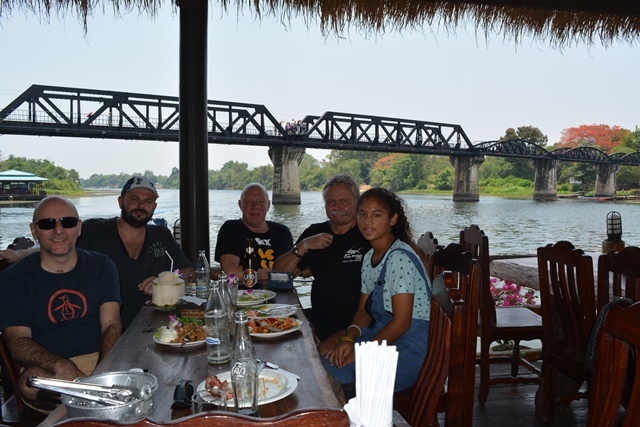 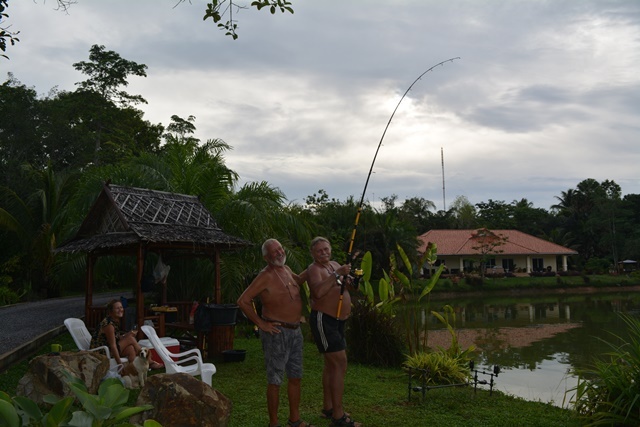 Well after the disappointment of the Khao Laem Dam trip the previous week, Tim almost cancelled his trip up there wiht Benny. 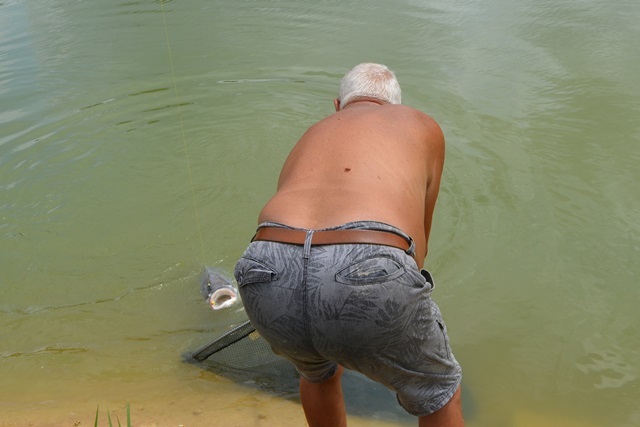 Luckily he didn't as what a difference a week can make, helped along by a couple of showers that had cooled the water off. 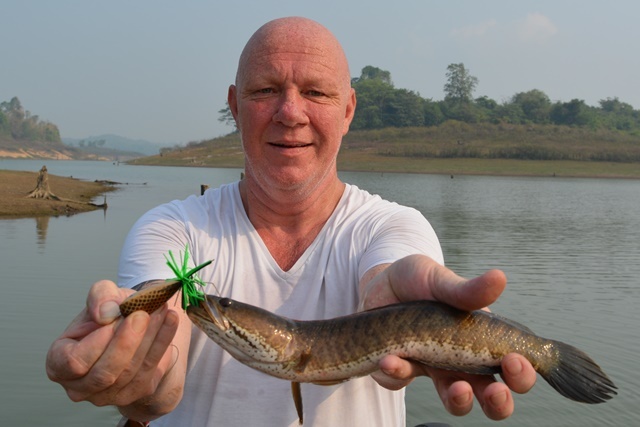 Tim caught nine giant snakehead weighing between 4 and 6.5kg and lost another two at the net, as well as catching three yellow catfish. 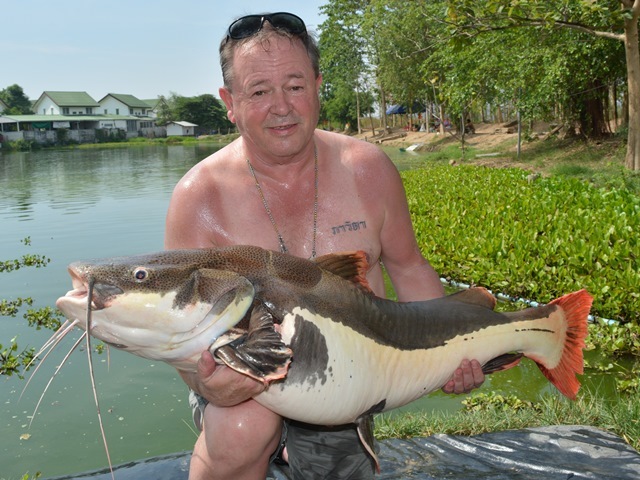 A wonderful session was also had by Eric Robert who caught Siamese carp to 100lb+, ripsaw catfish, leopard catfish, a rare vulture catfish, an awesome rohu, a huge alligator gar and to top the session off a 2.5 hour marathon battle with a 330lb Mekong catfish that earned him a place in the Palm Tree Lagoon 300lb Catfish Club. 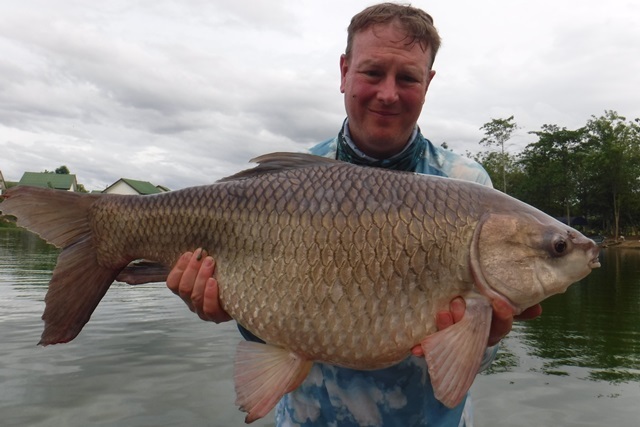 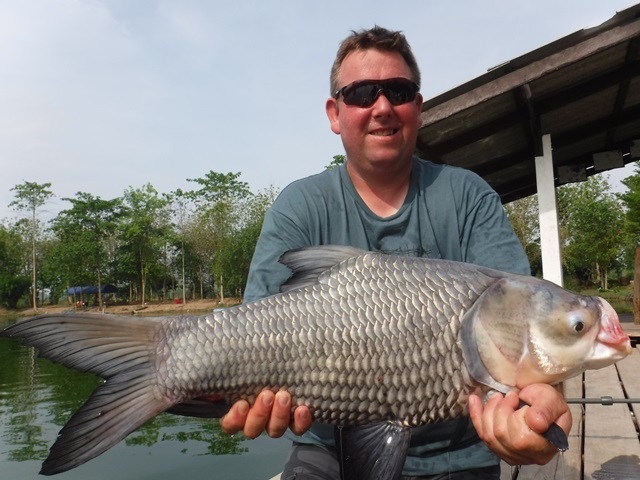 Tim was back and caught a number of good sized Siamese carp on Urban Baits 2 x 12mm Nutcraker popups as well as an albino pacu, and a Mekong catfish. 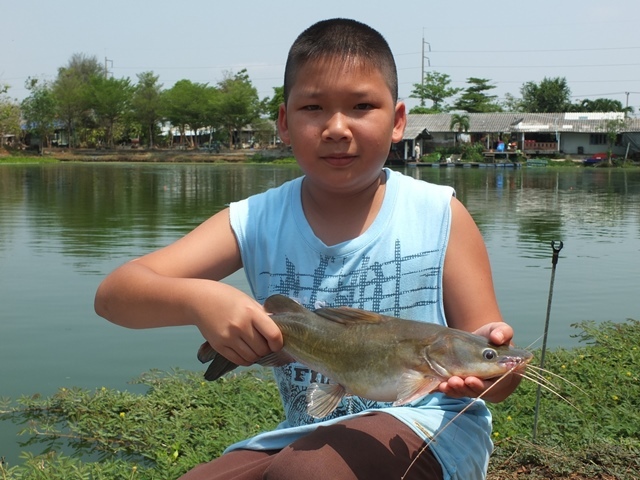 The worms were also doing well accounting for a superb Juliens golden price carp, vulture catfish, crystal eyed catfish. 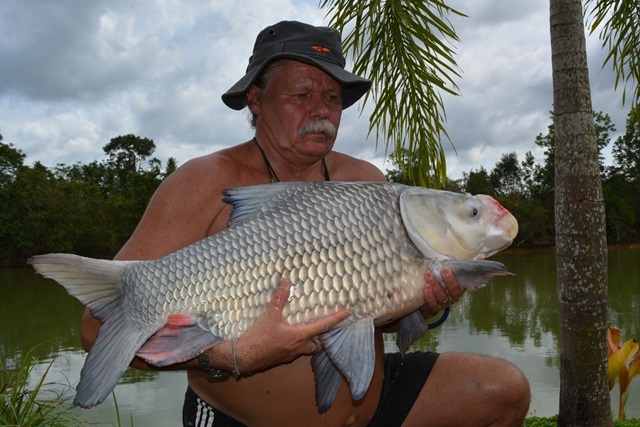 In addition, fishing small pieces of Canadian bacon steak under a waggler caught a huge number of Amazon redtails the biggest one going 93lb. 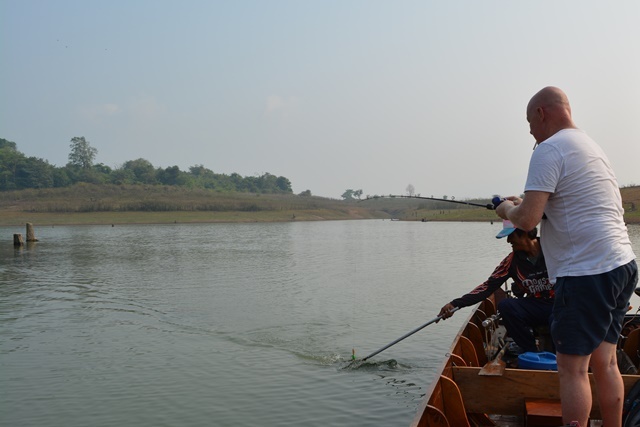 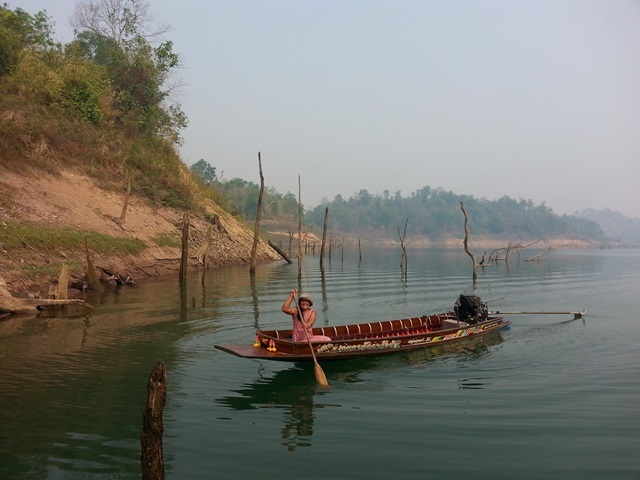 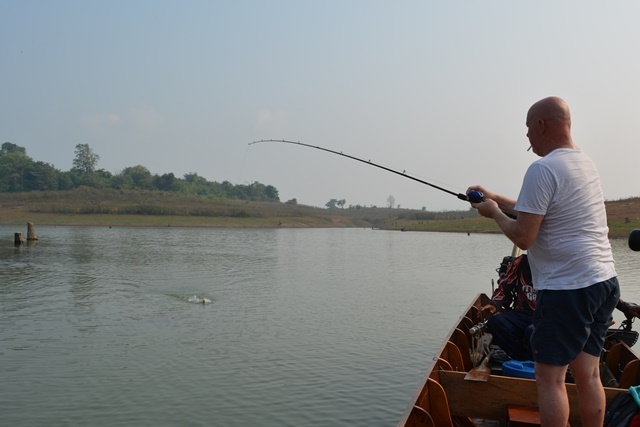 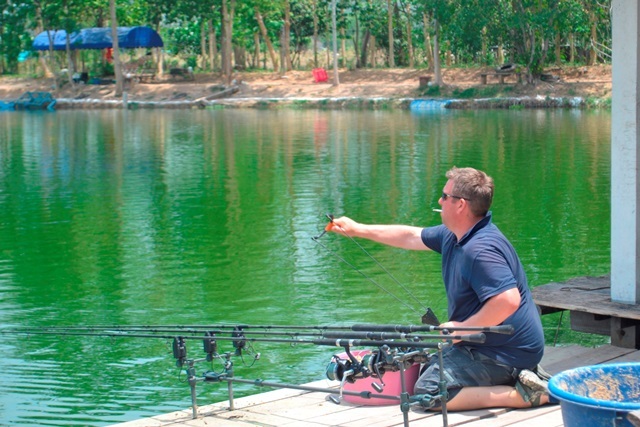 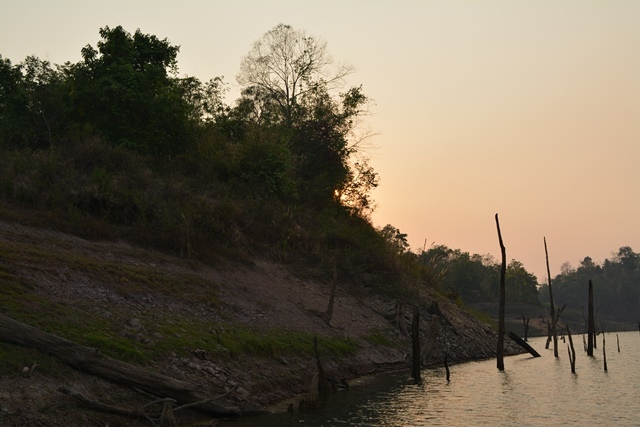 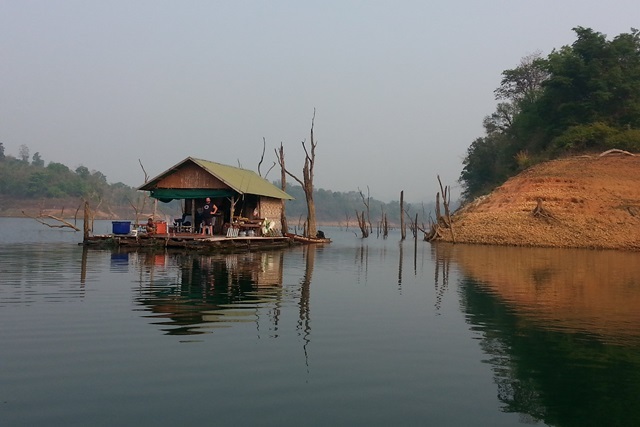 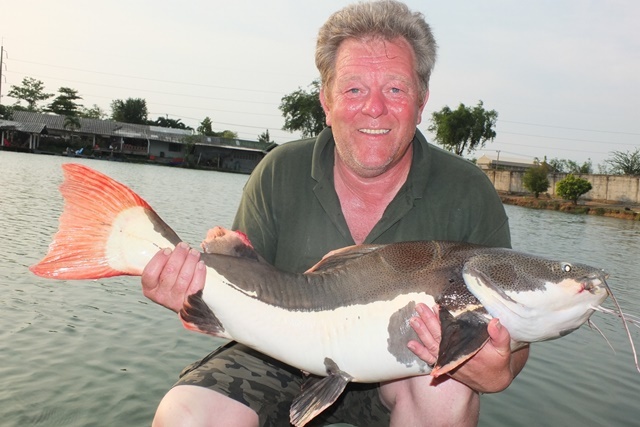 Tim accompanied Benny for a session down at the legendary John Wilson's private lake 'Bung Sawan' down at Chum Phon. 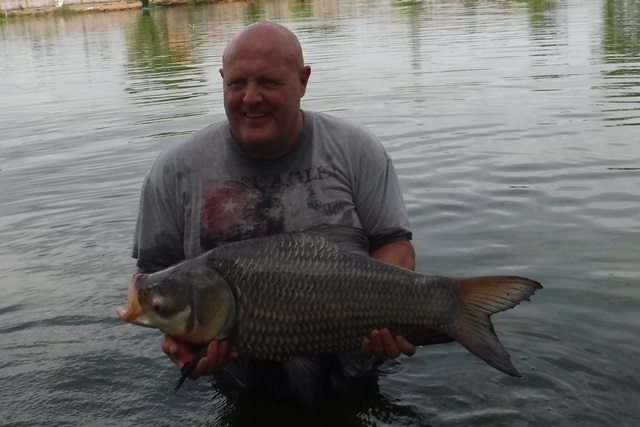 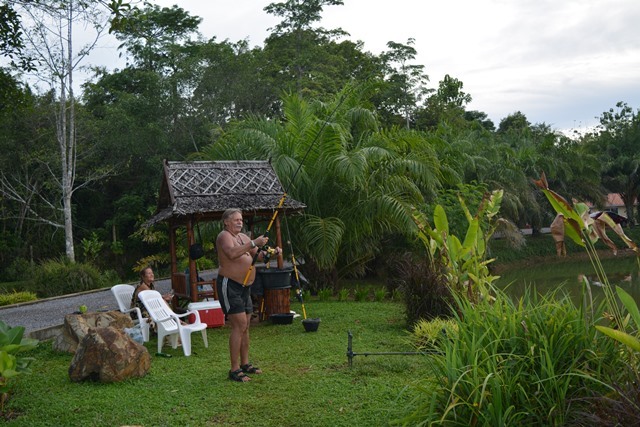 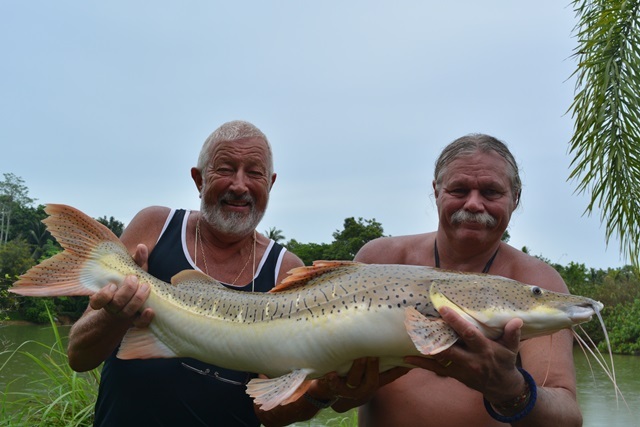 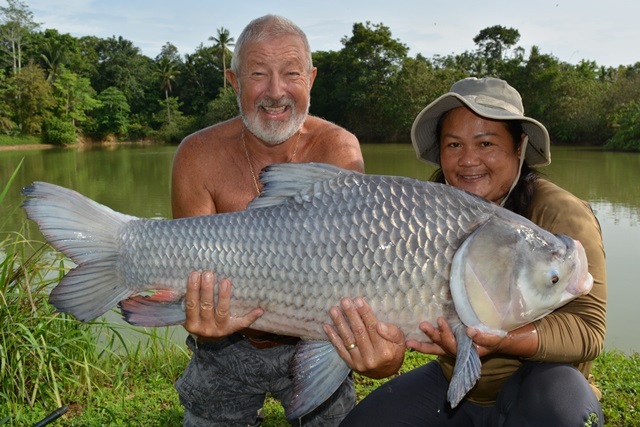 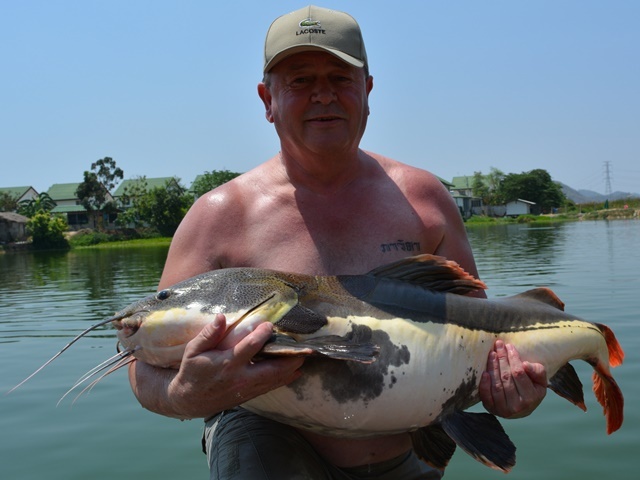 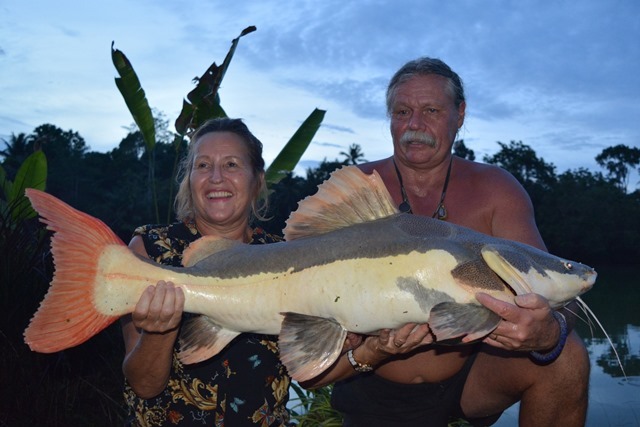 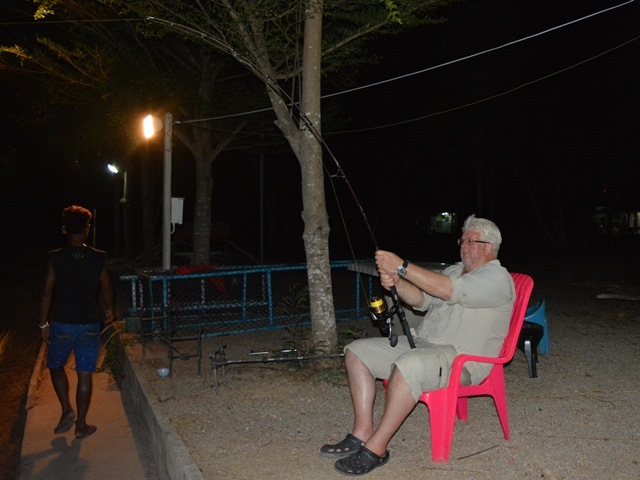 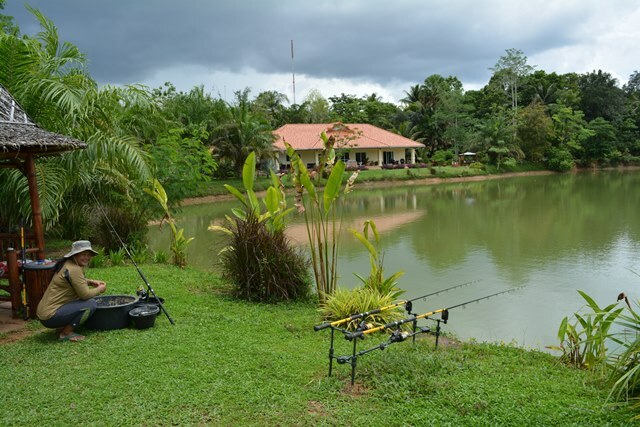 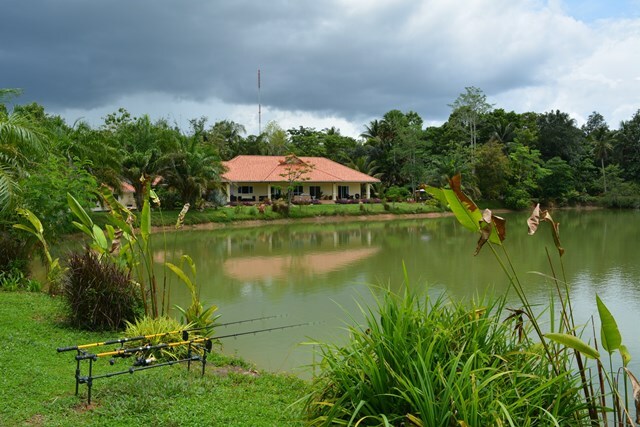 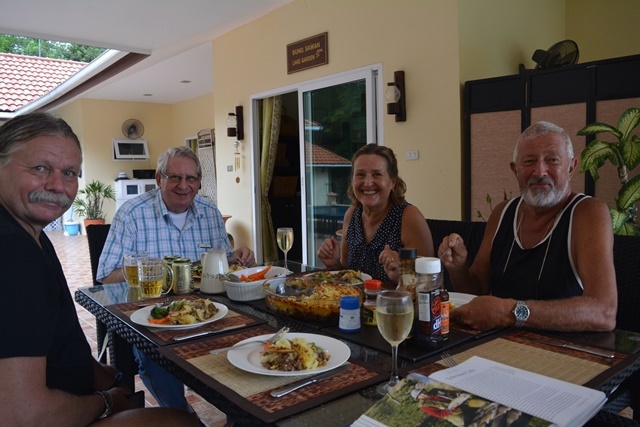 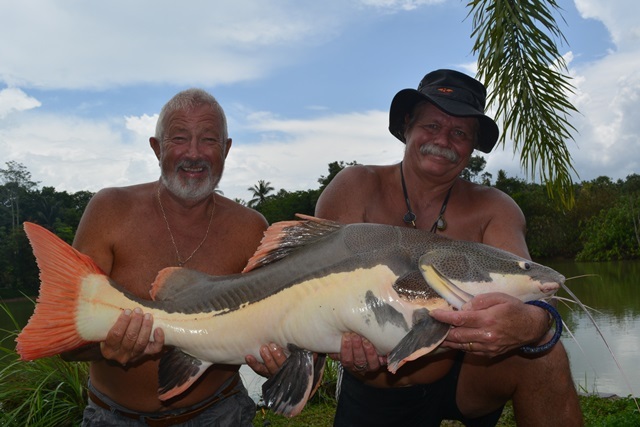 They had a great session with equally as good hospitality shown by John and his wife Jo as they went on to catch a huge number of fish that included Siamese carp, tilpapia, alligator gar, java barb, Amazon redtail and leopard catfish. 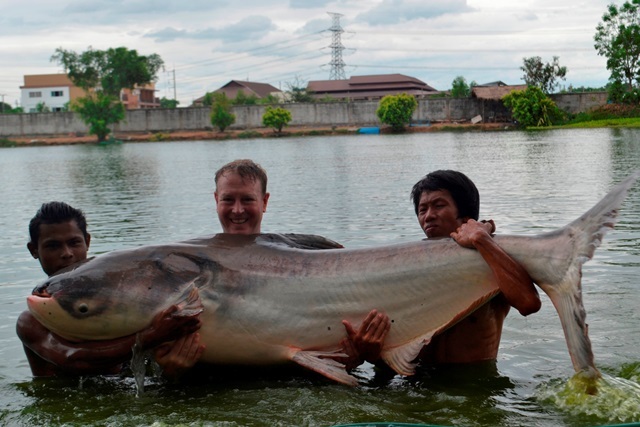 Try all they might they still did not manage to catch a Mekong or a striped catfish ...well there is always next time. 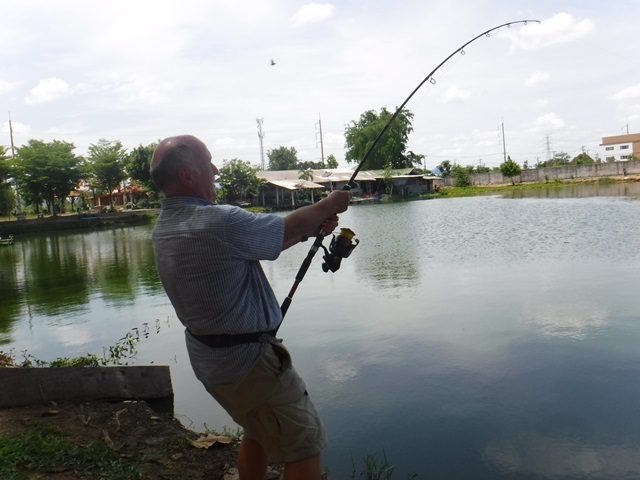 Tap of Bangkok Fishing Guide Service forth visit was also his customer Colin's second of the month. 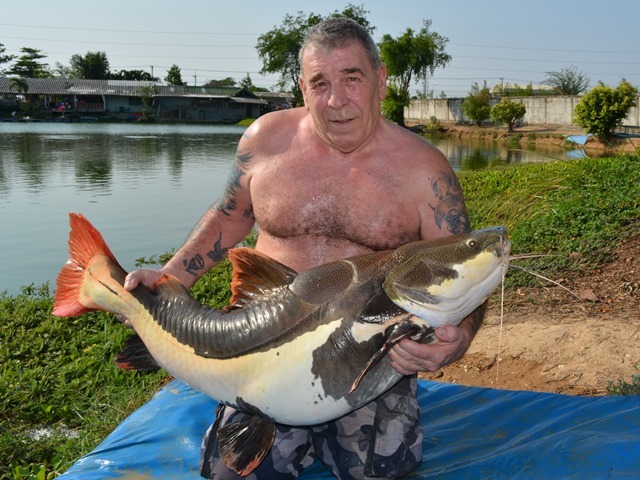 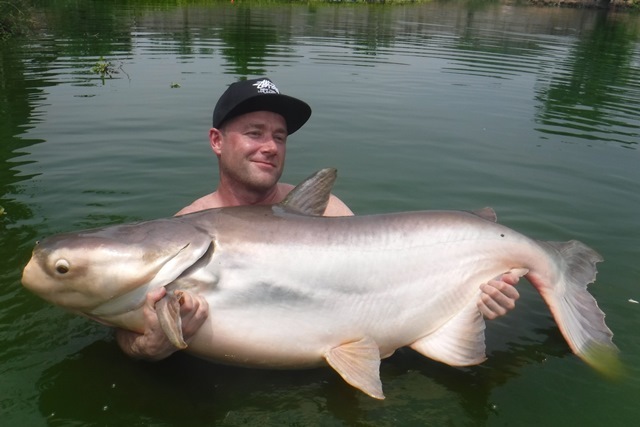 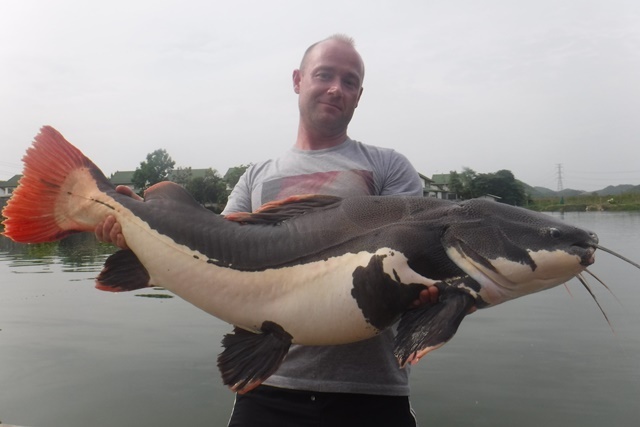 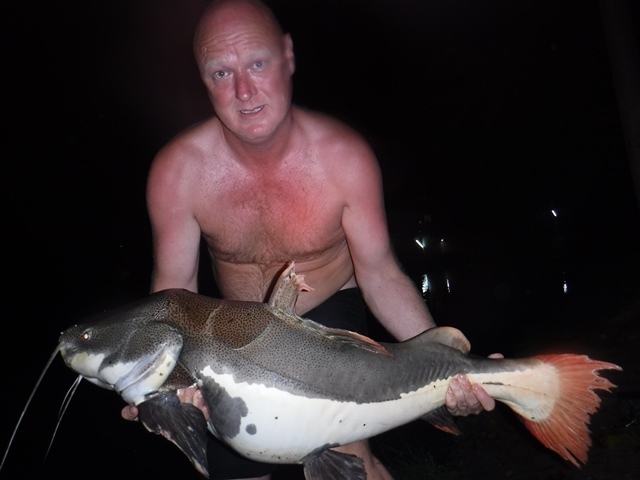 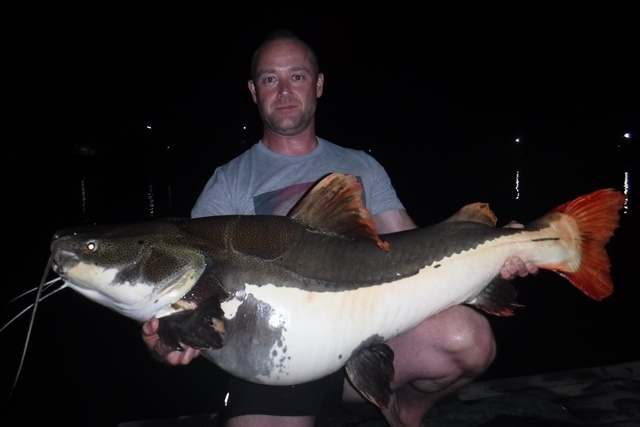 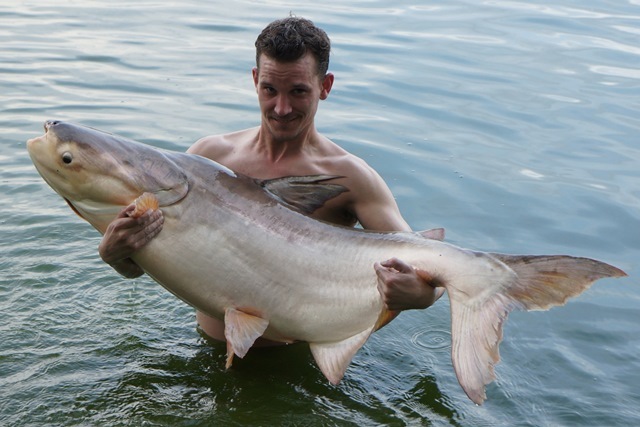 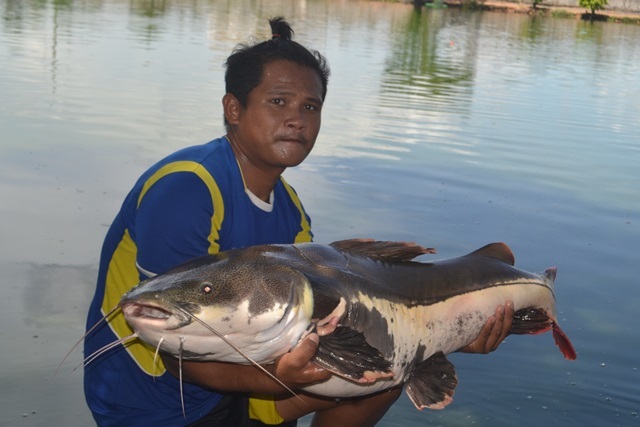 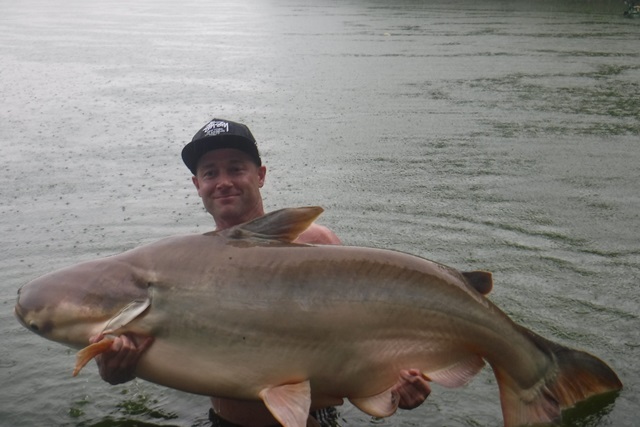 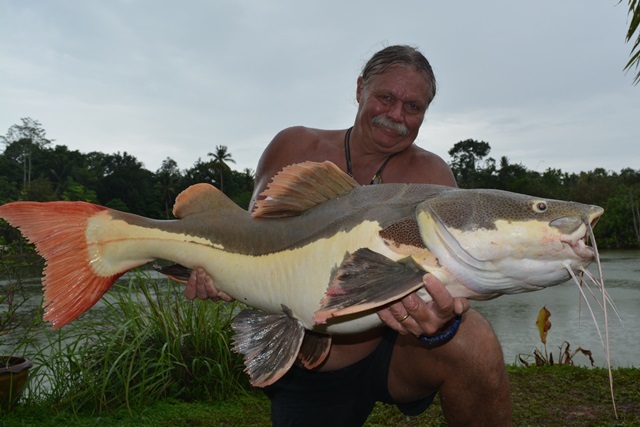 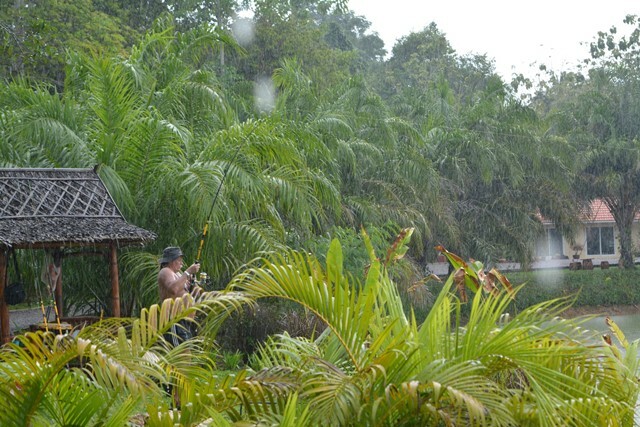 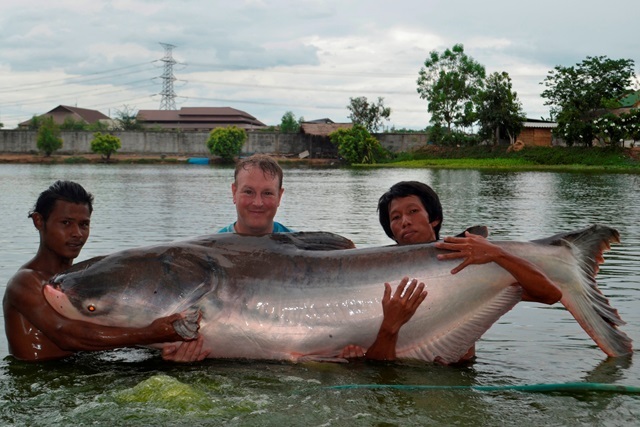 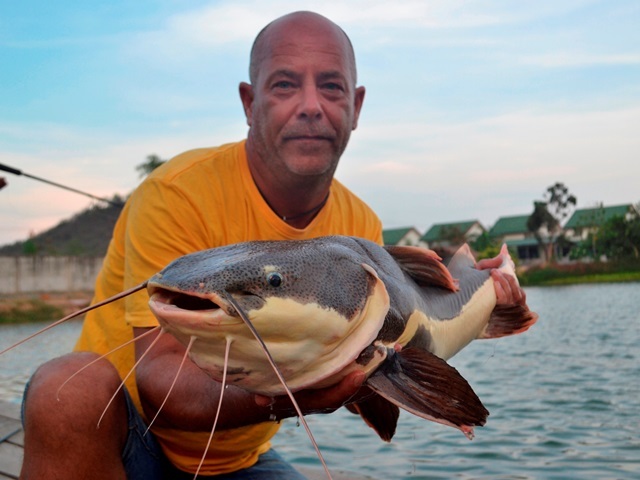 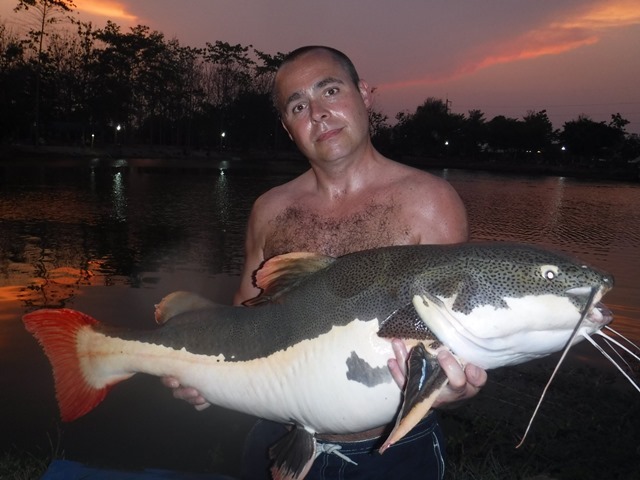 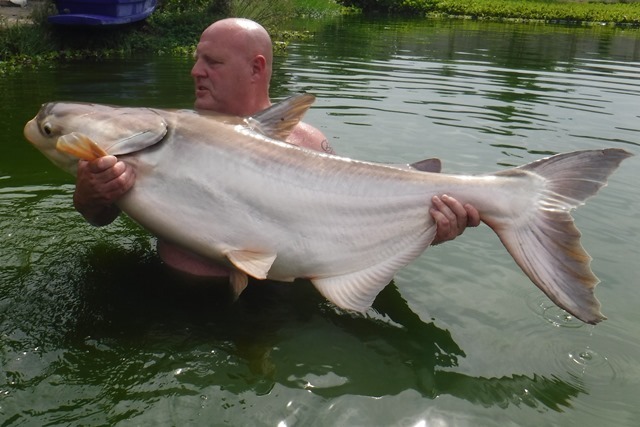 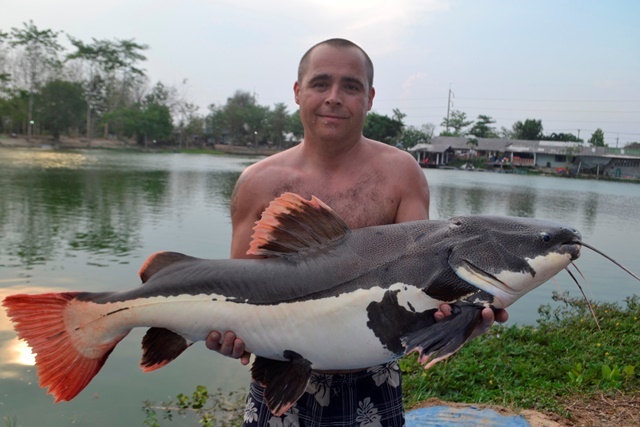 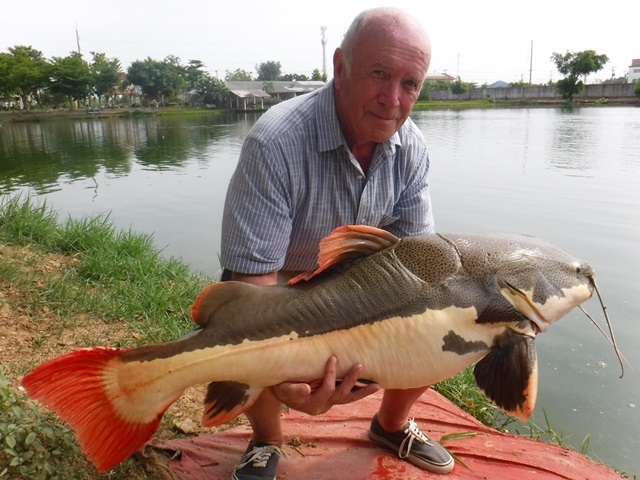 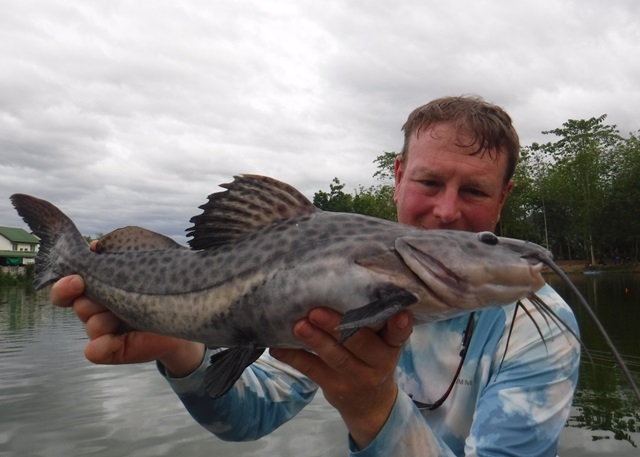 After catching a couple of Amazon redtails he was then in for the battle of his life as he strained for almost three hours to land a 330lb Mekong catfish and in the process join the ever expanding Palm Tree Lagoon 300lb Catfish Club. 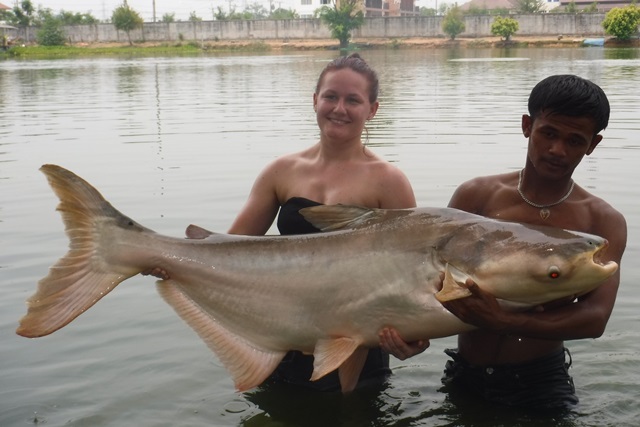 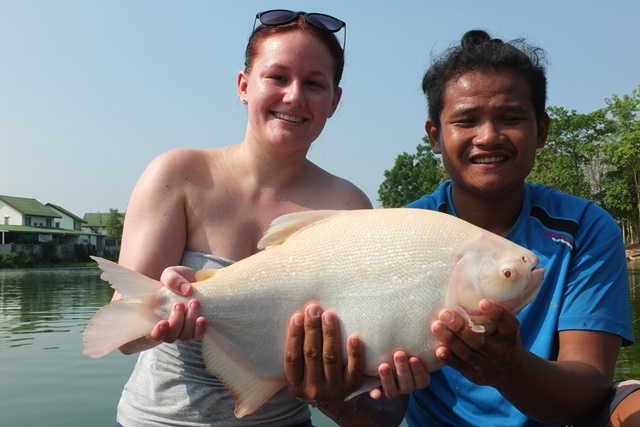 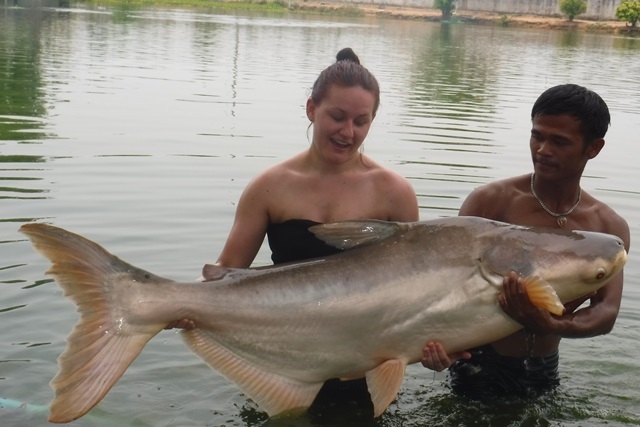 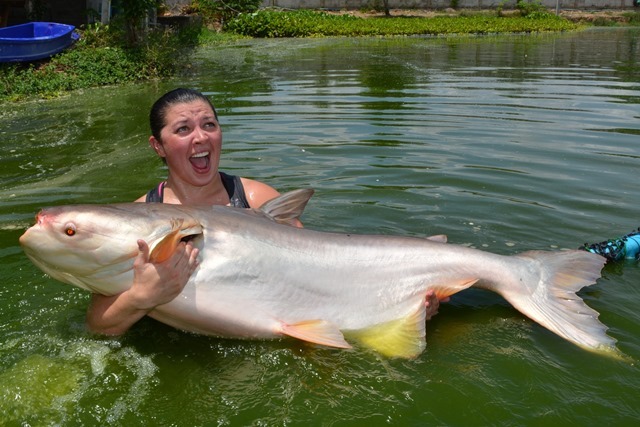 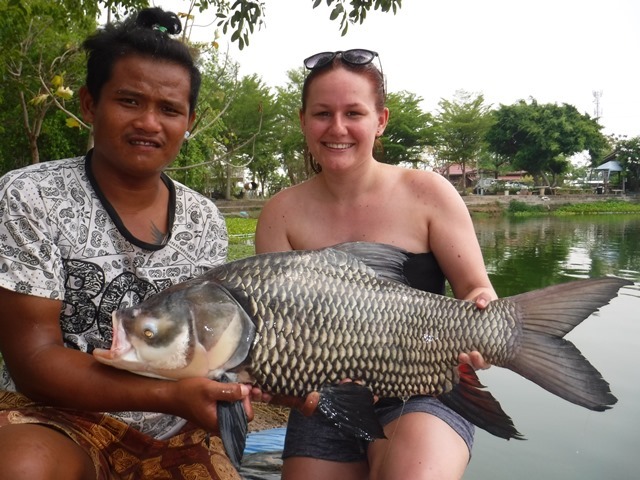 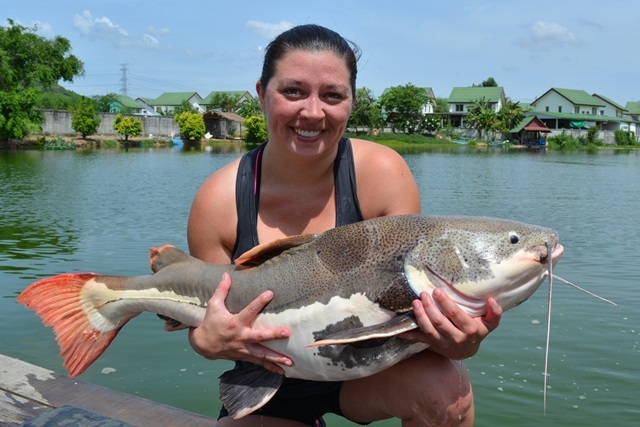 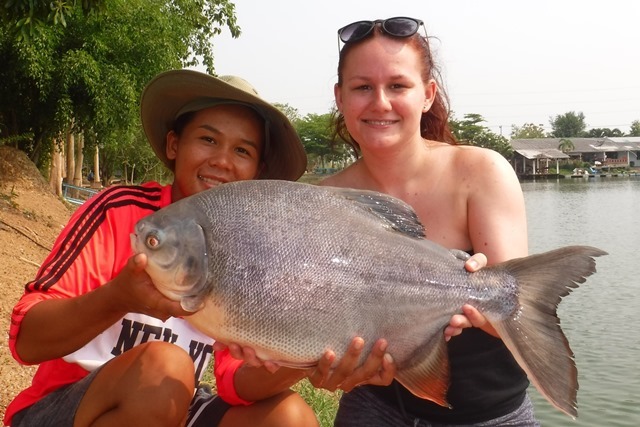 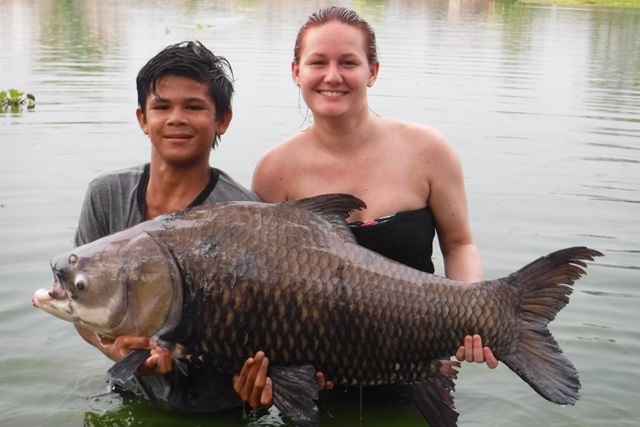 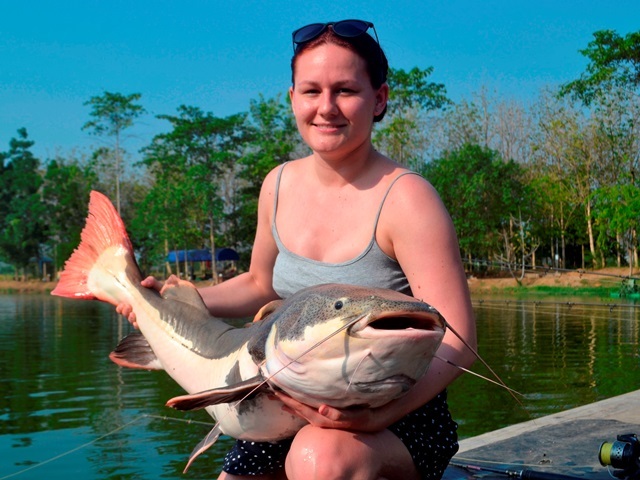 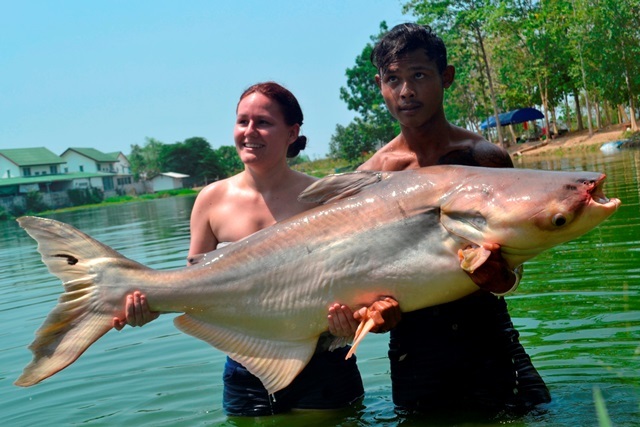 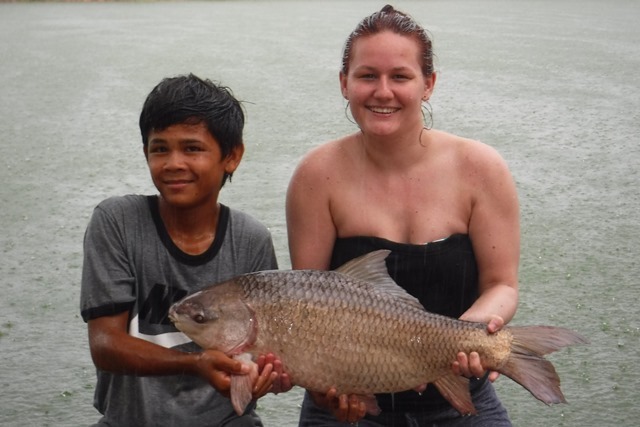 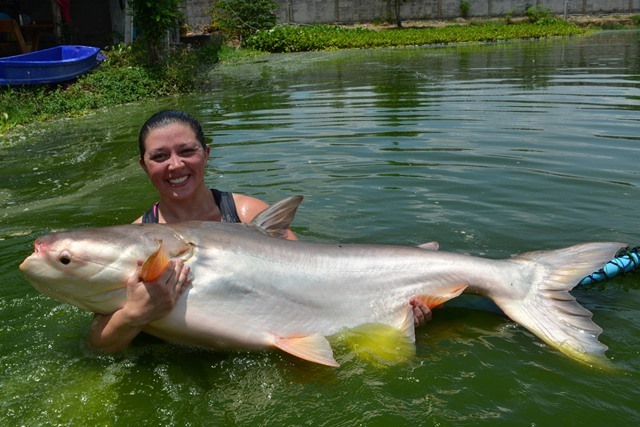 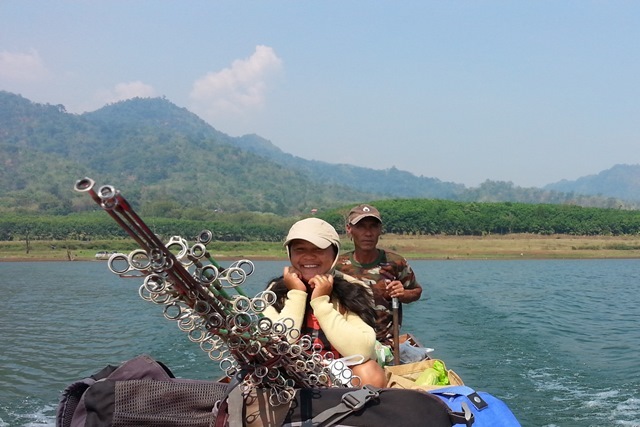 Tap of Bangkok Fishing Guide Service fifth and last customers for the month Natalie Kilmon and Revin were all smiles with there catches that included a lake record Chinese black carp, Mekong catfish, big-Y catfish and Amzon redtail. 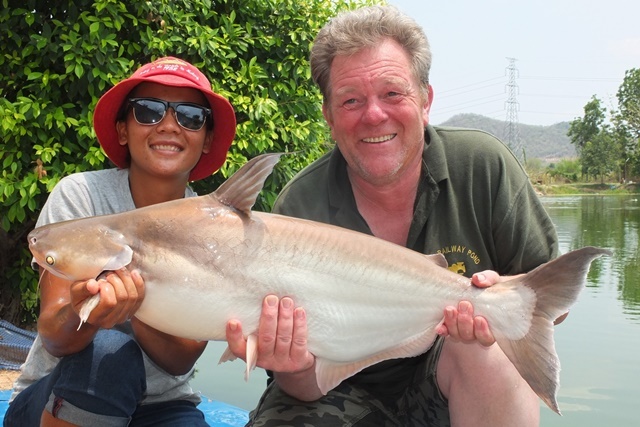 John Wilson's brought long time friend Emily Hart down to Palm Tree for a session during the month. 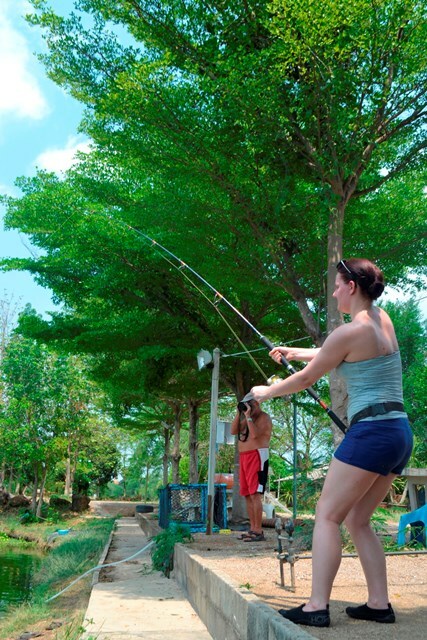 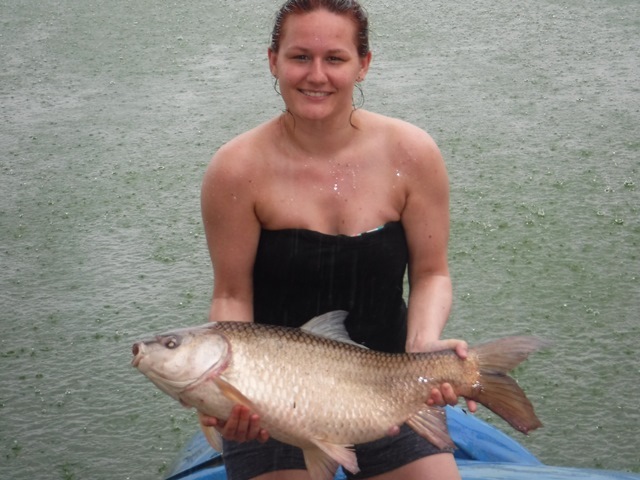 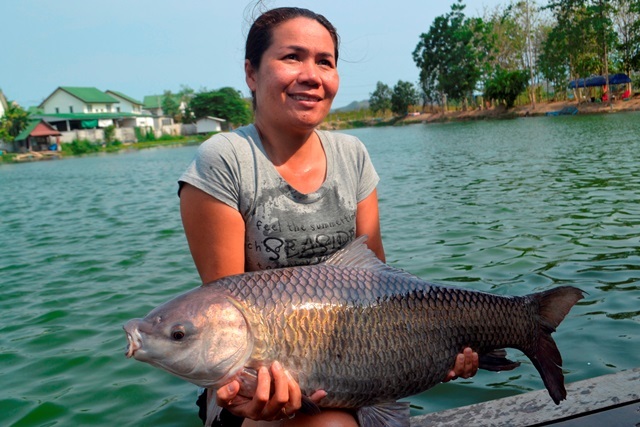 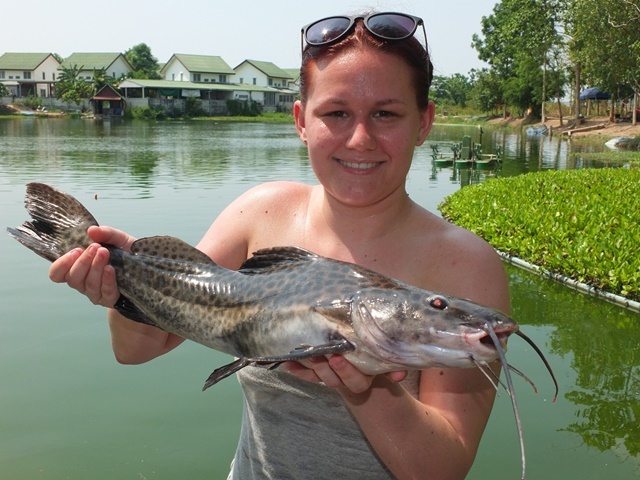 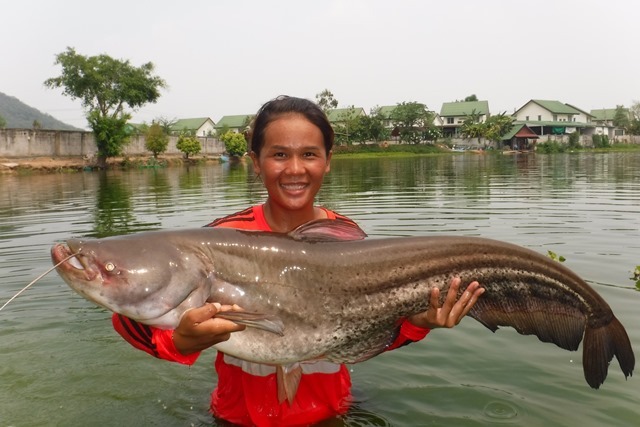 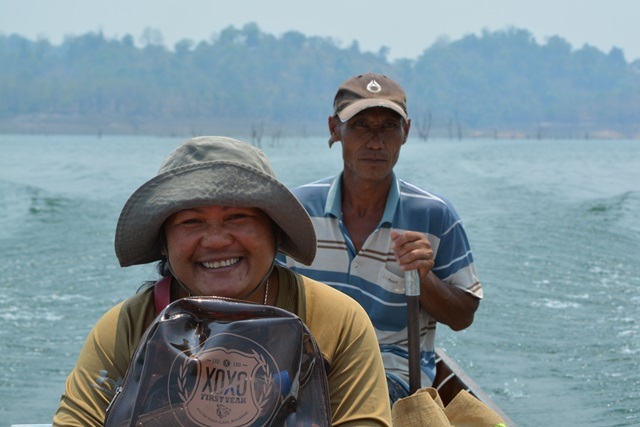 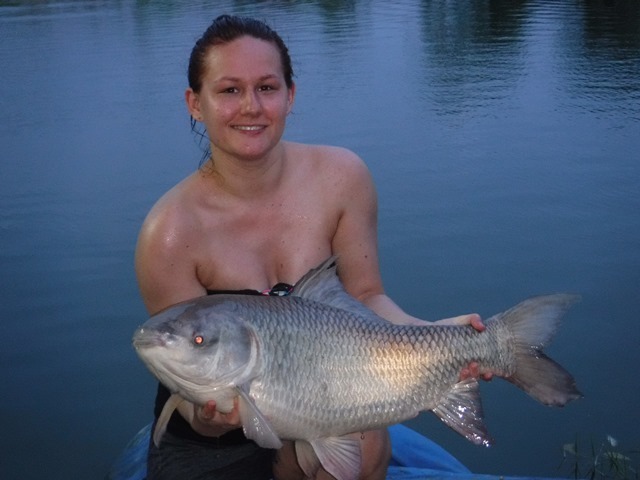 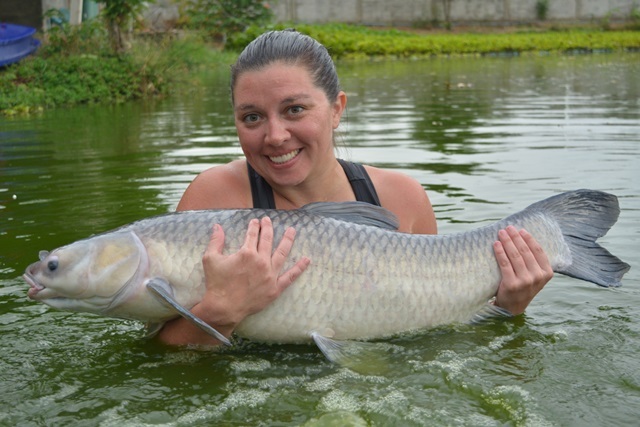 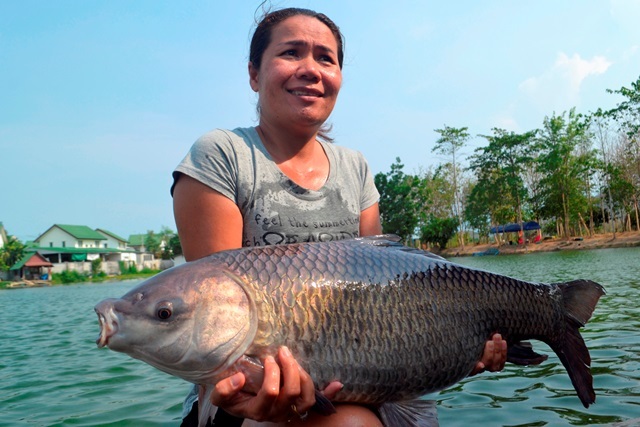 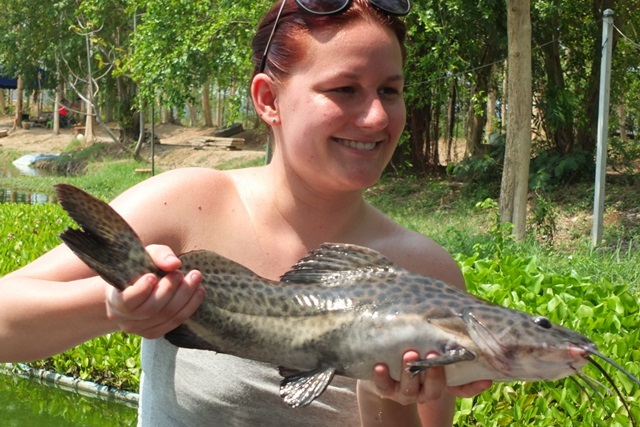 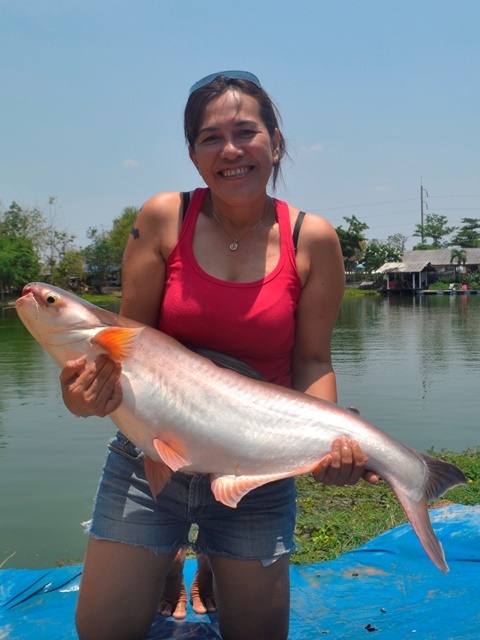 She seemed more than pleased with her catches that included many pb's namely Siamese carp, Mekong catfish and rohu. 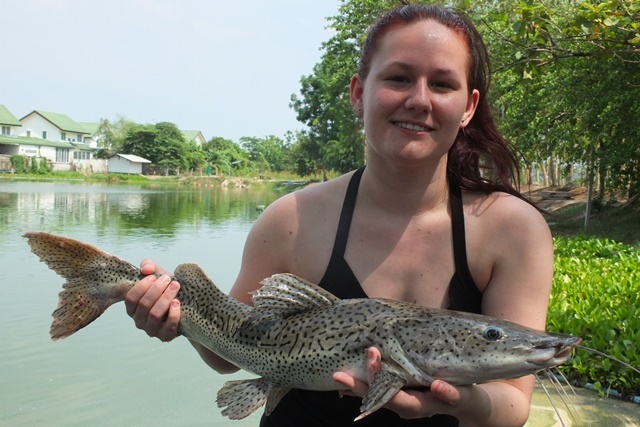 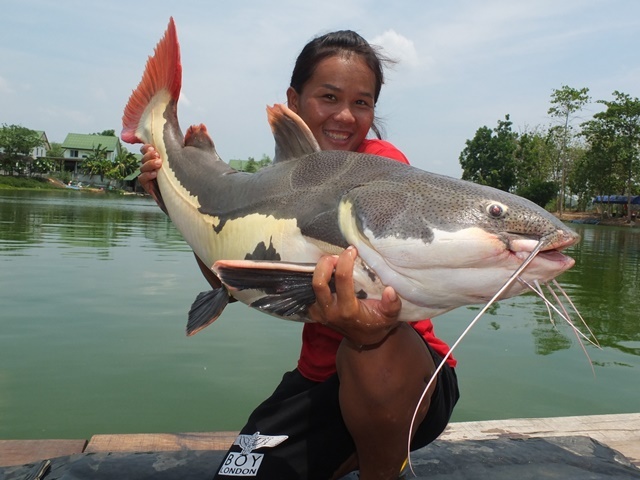 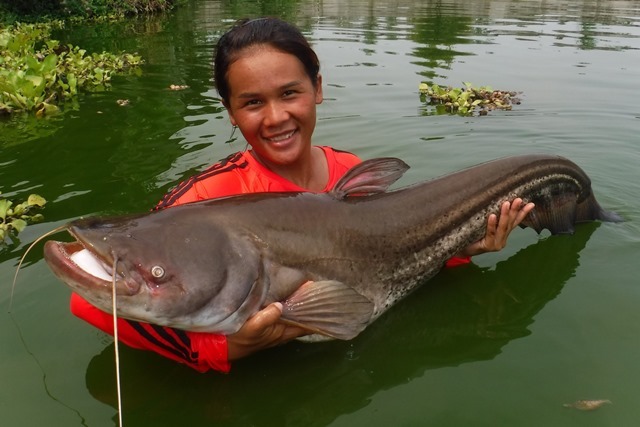 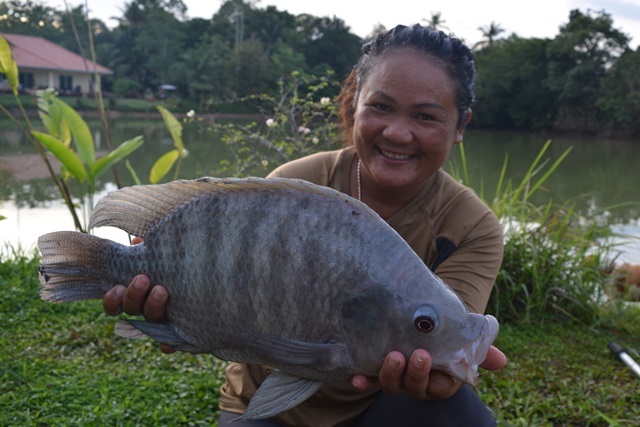 She also caught some new species for her such as an albino pacu and a rare vulture catfish, as well as catching many other species such as leopard catfish, pacu and striped catfish. 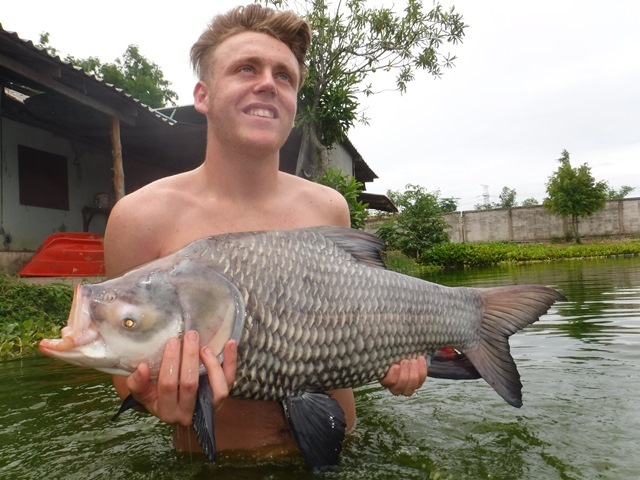 Tan and his son also had an enjoyable session vowing to be back in August. 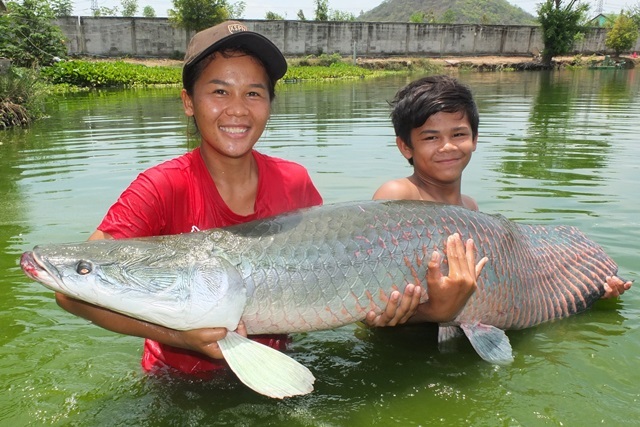 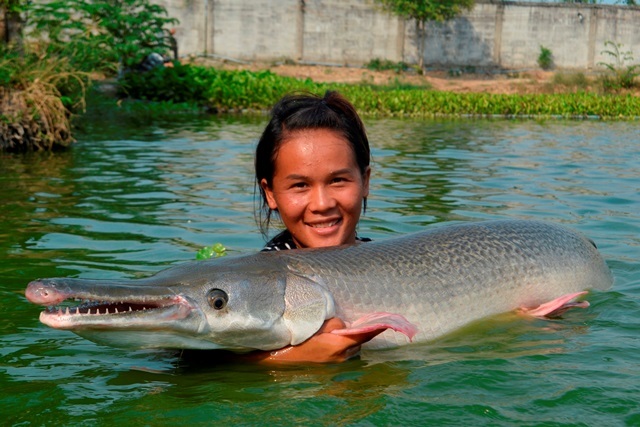 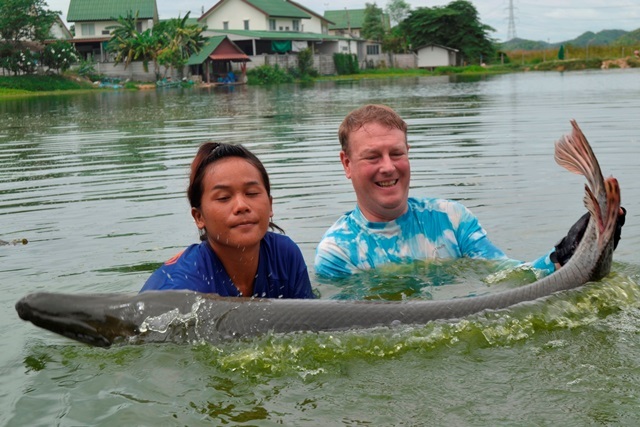 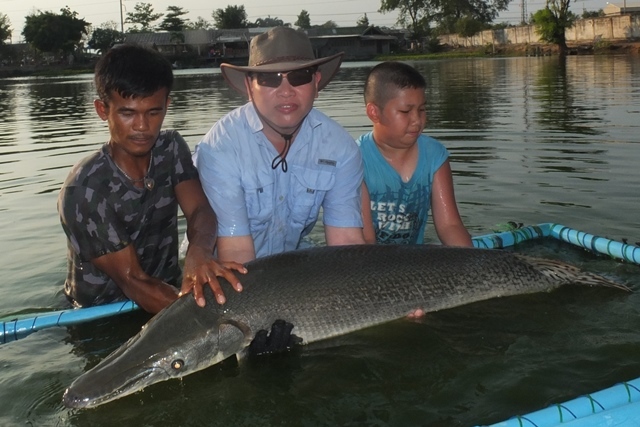 They caught some awesome alligator gar as well as Mekong catfish, chao phraya catfish, yellow catfish and Siamese carp. 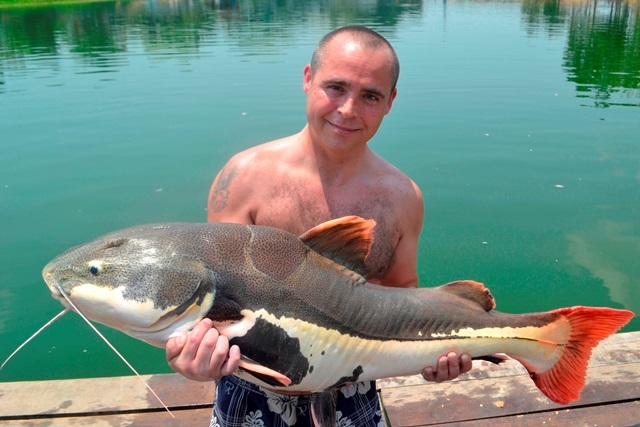 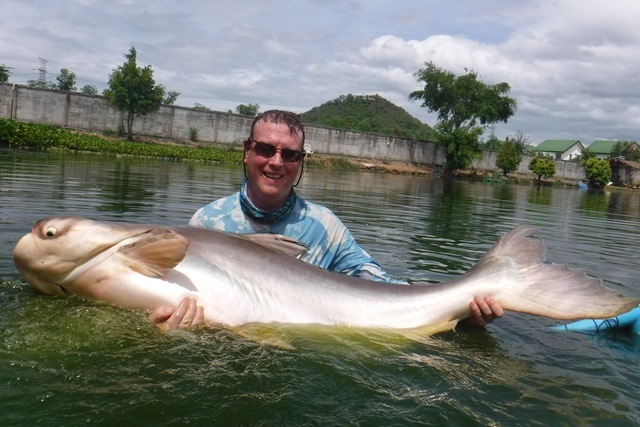 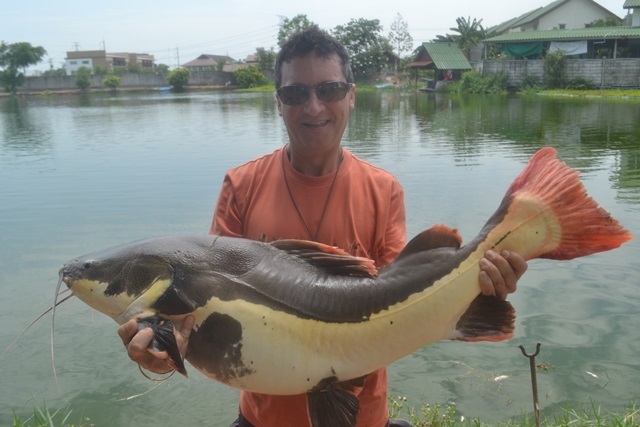 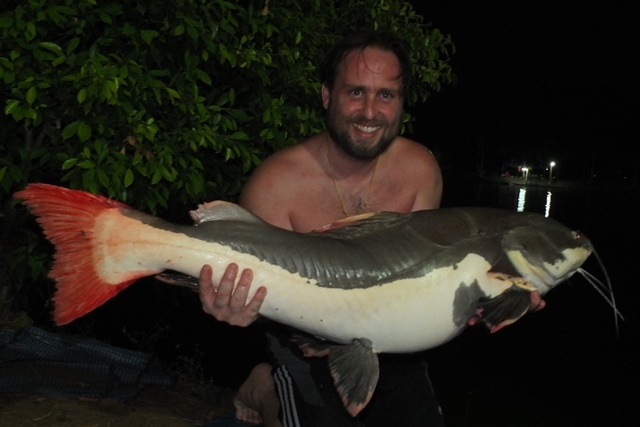 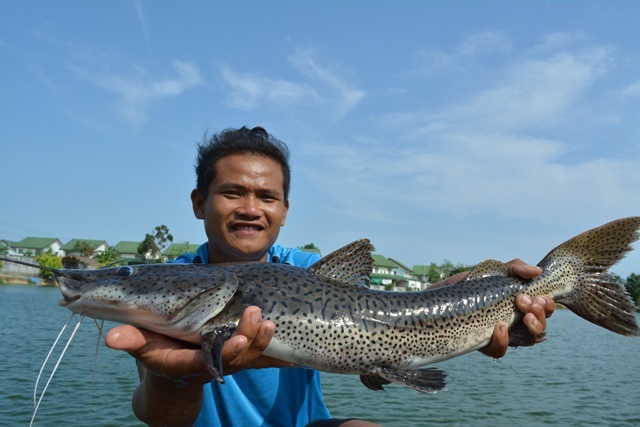 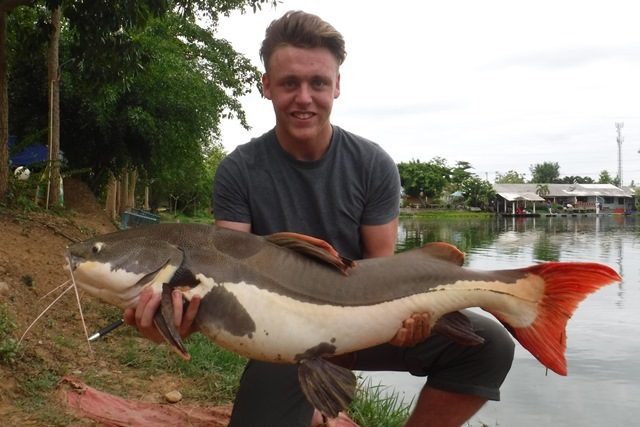 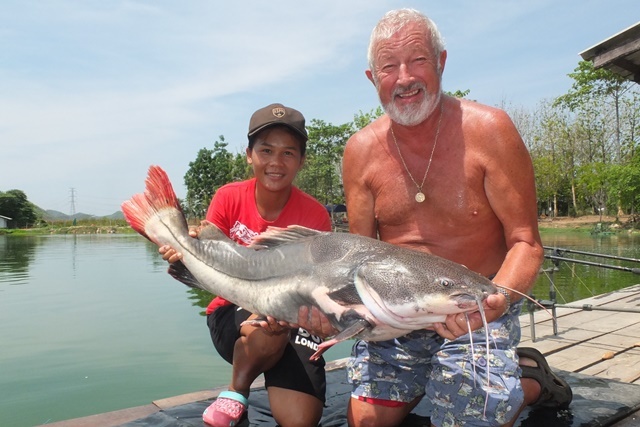 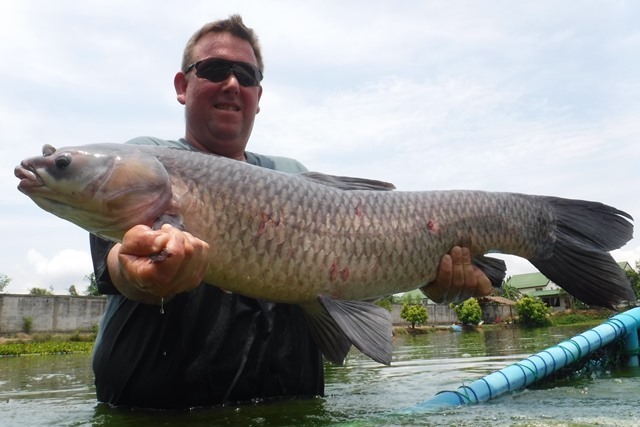 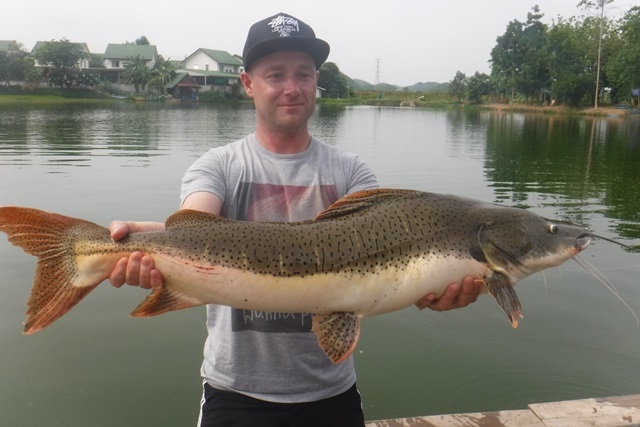 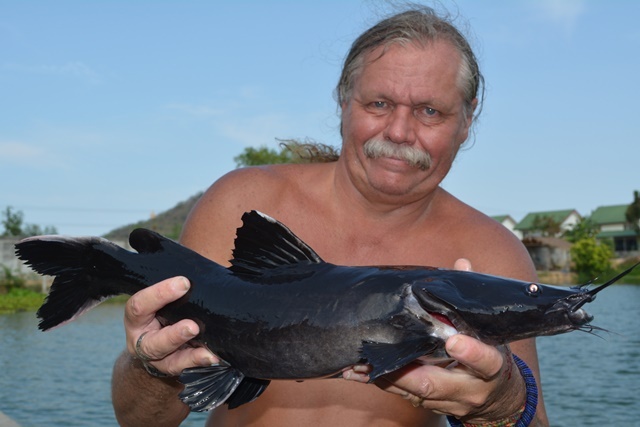 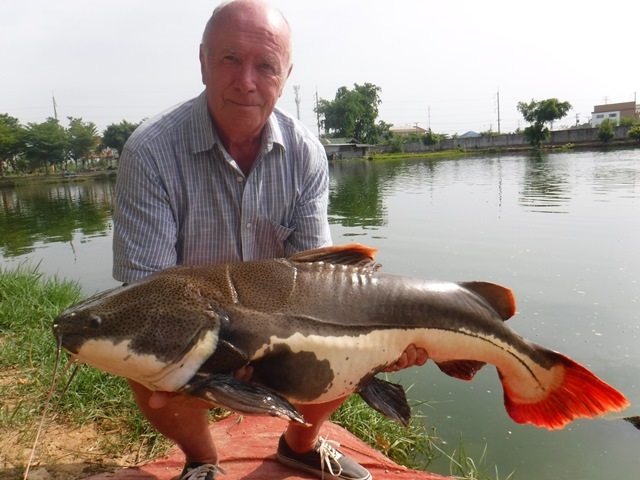 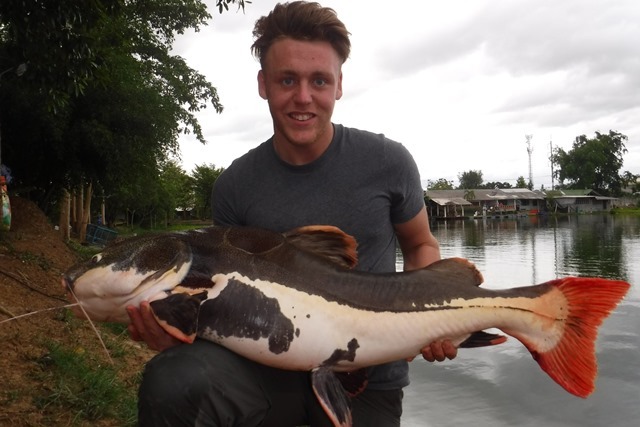 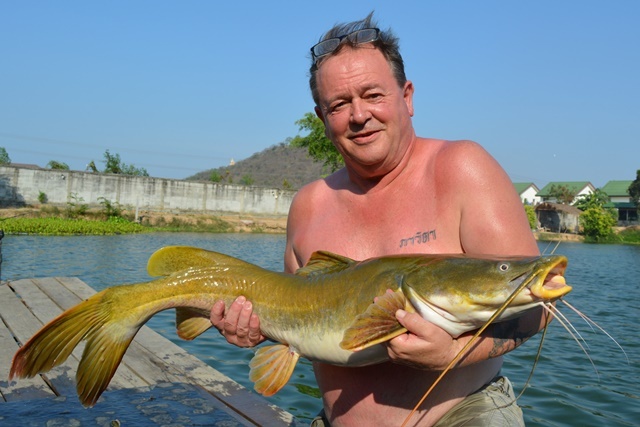 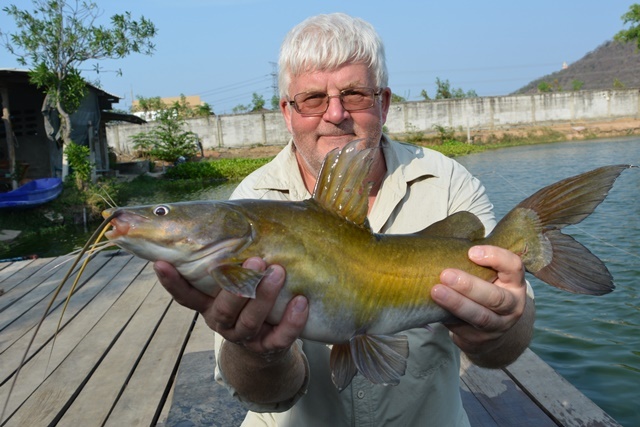 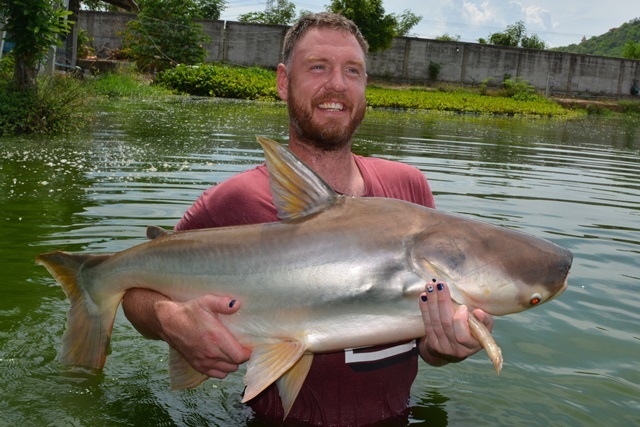 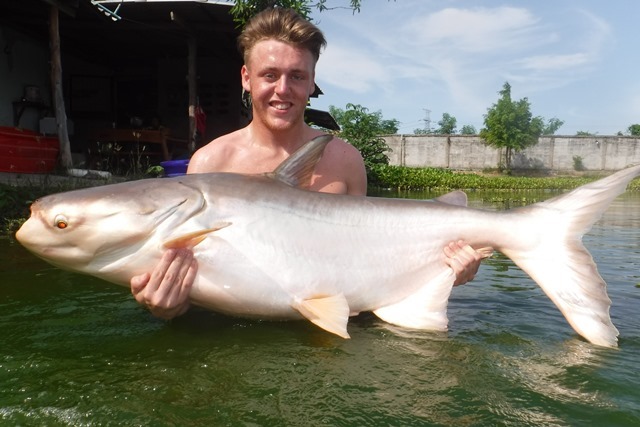 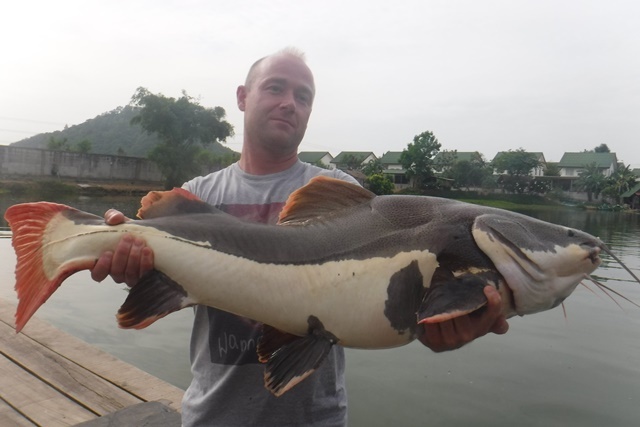 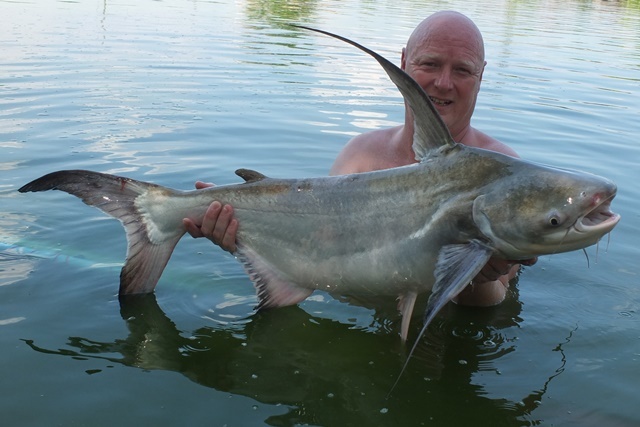 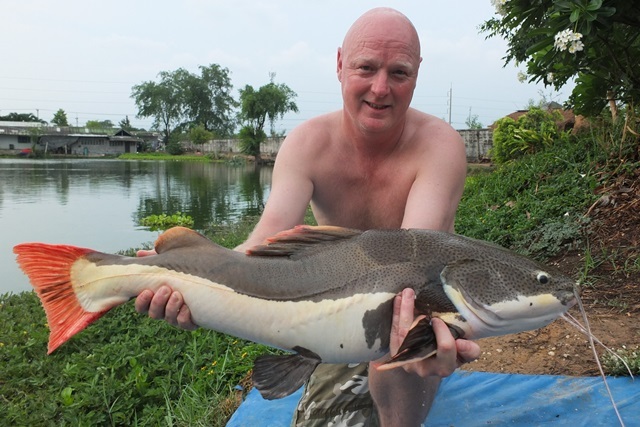 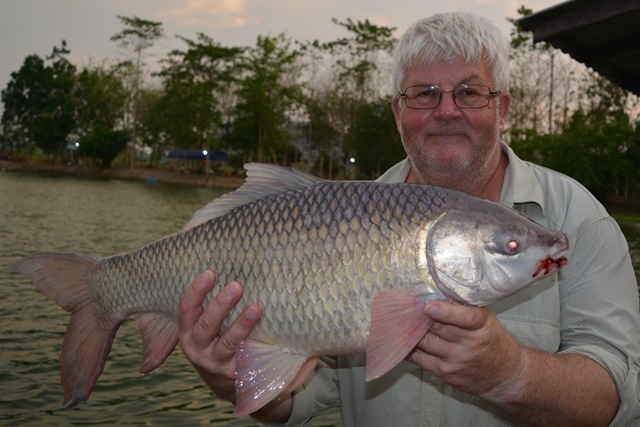 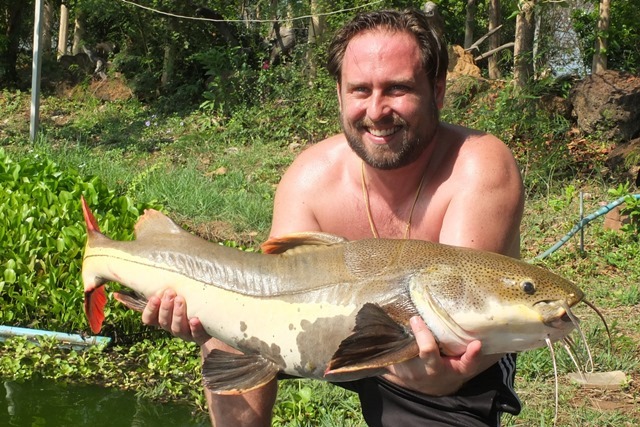 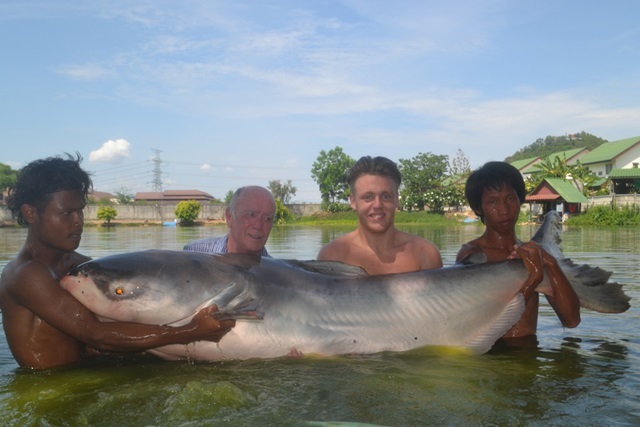 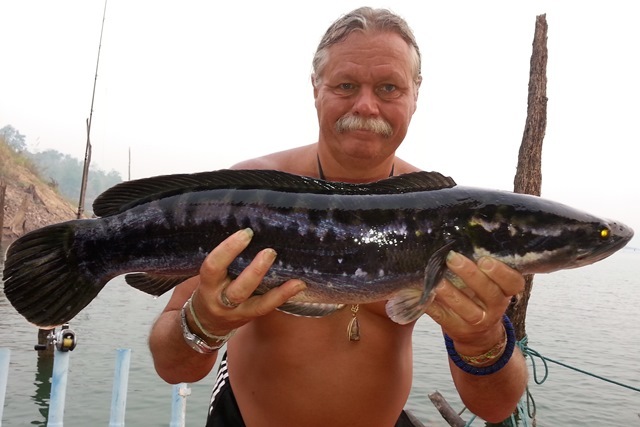 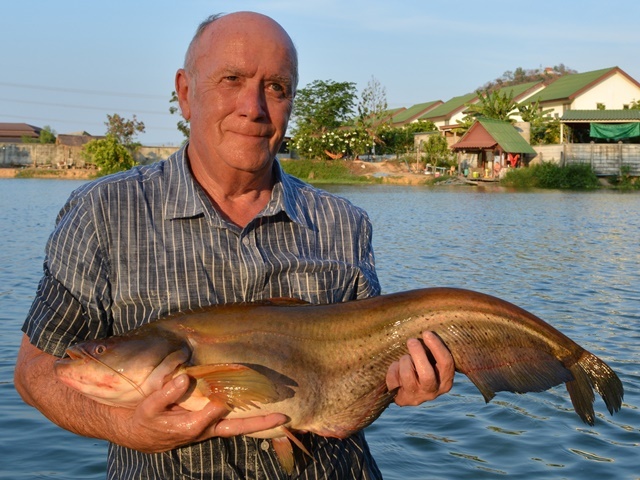 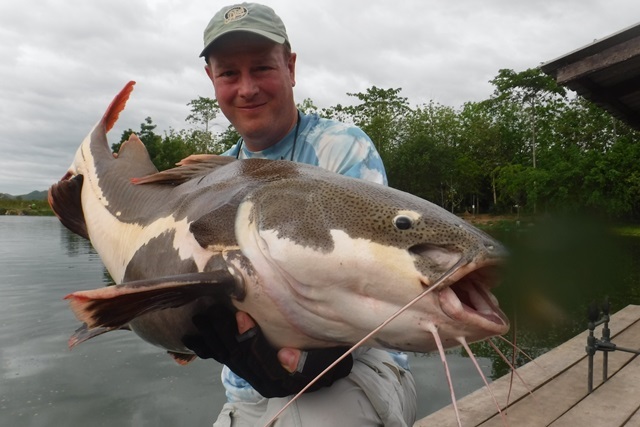 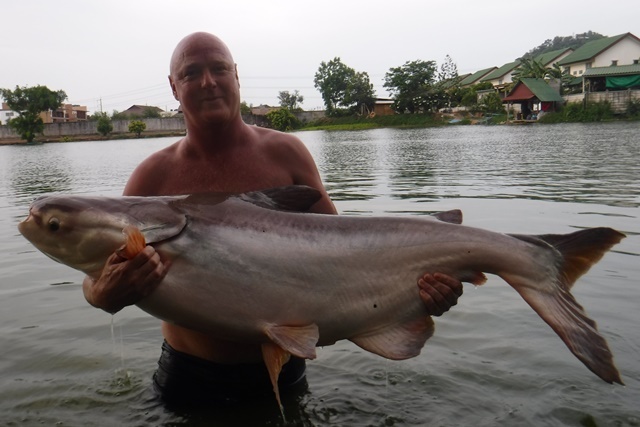 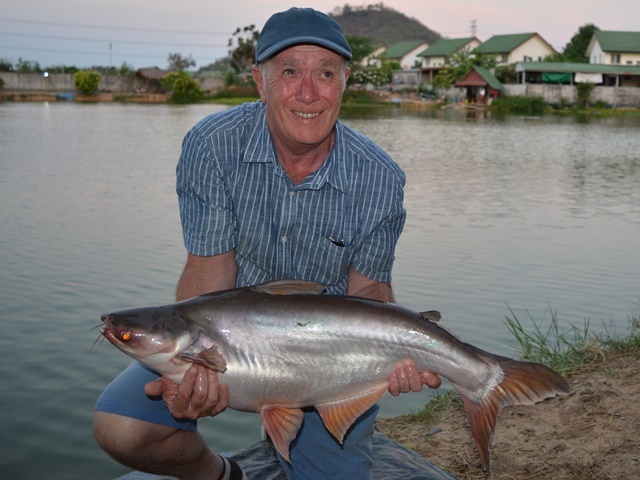 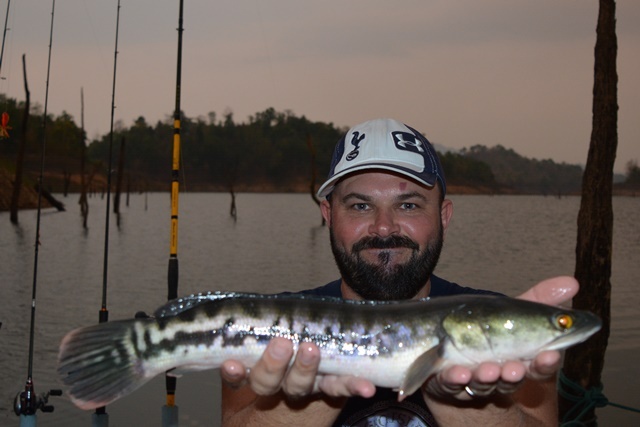 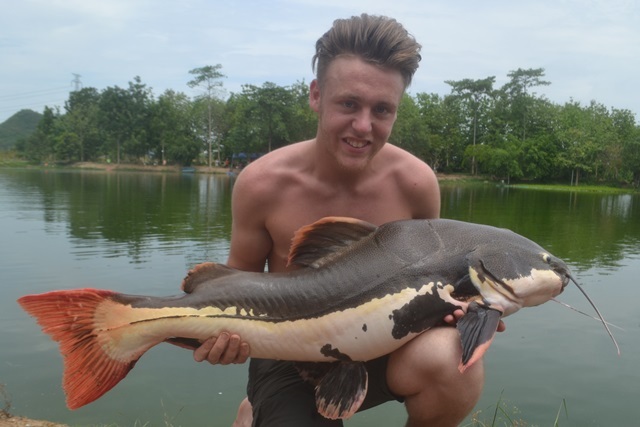 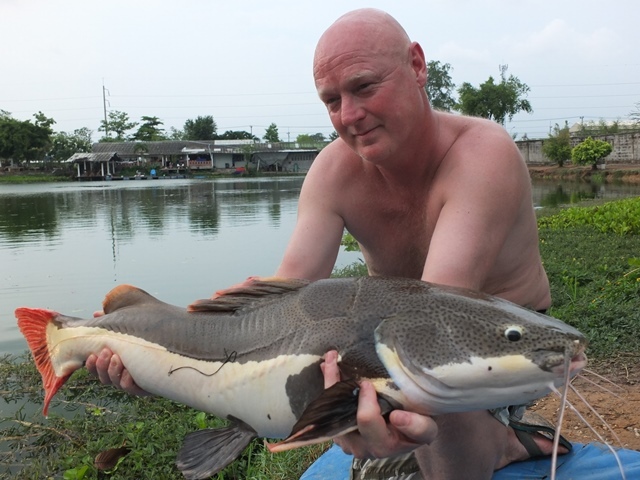 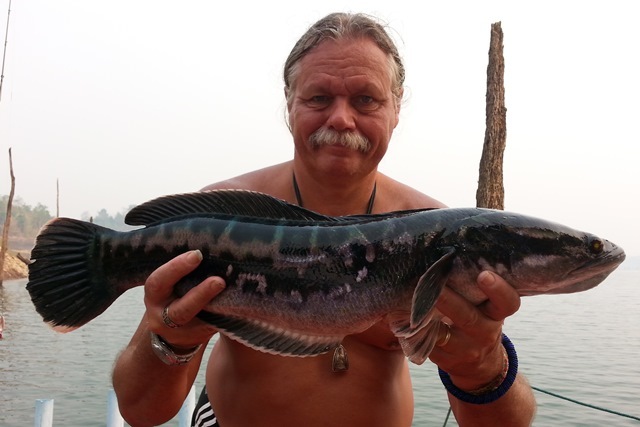 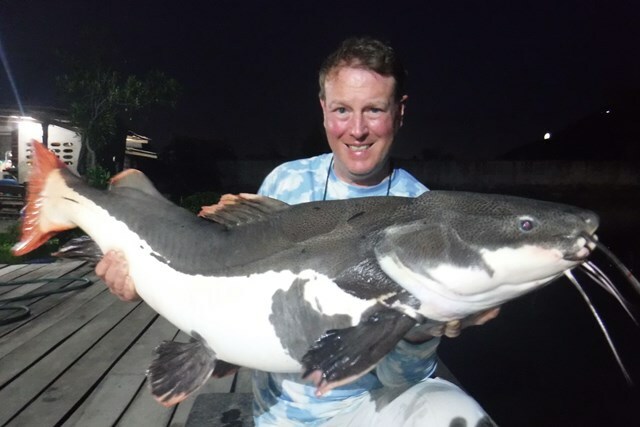 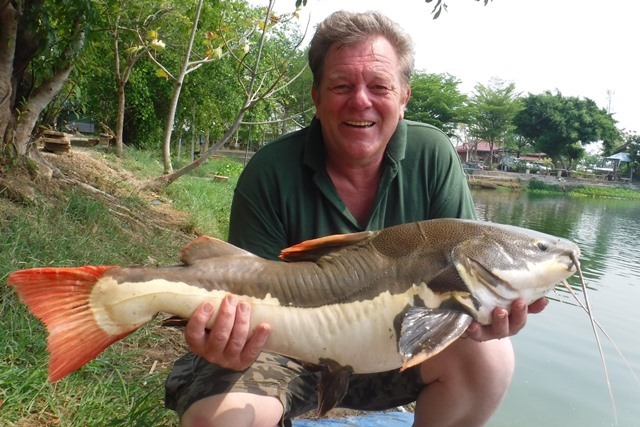 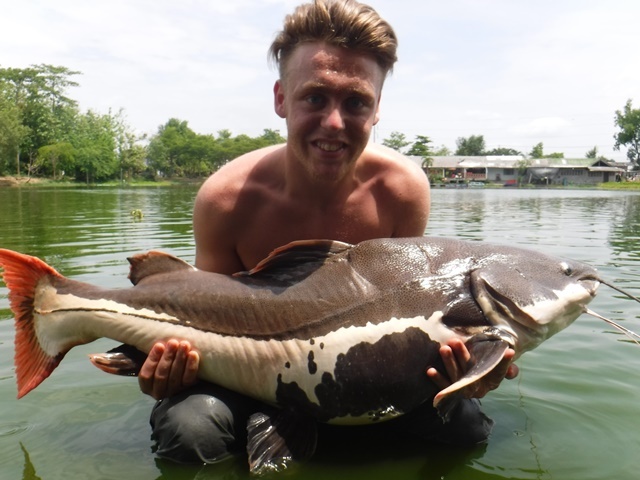 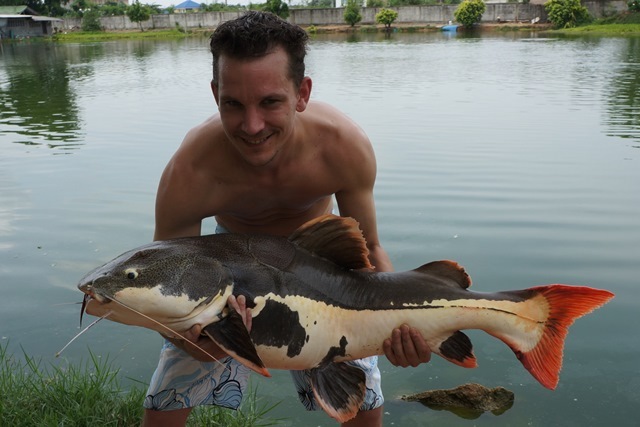 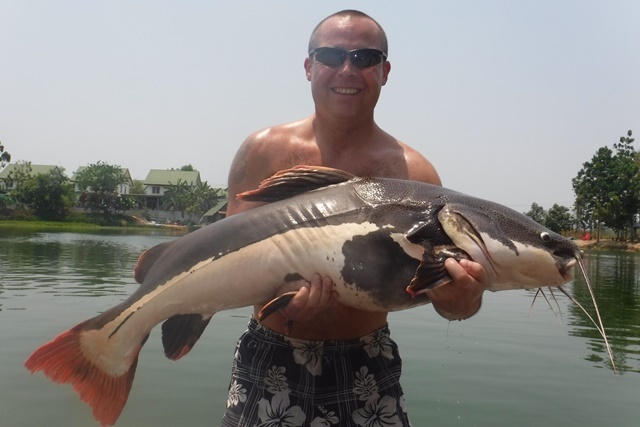 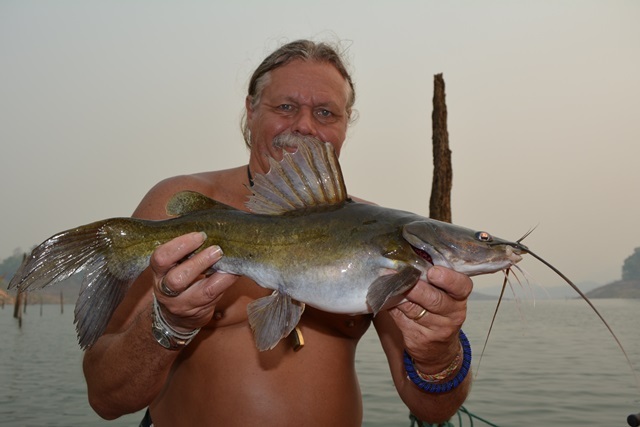 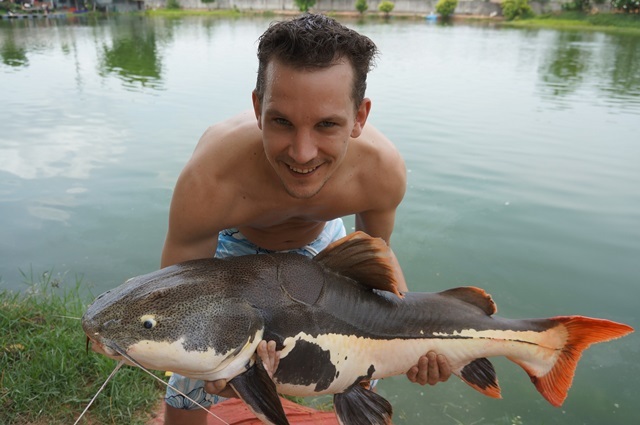 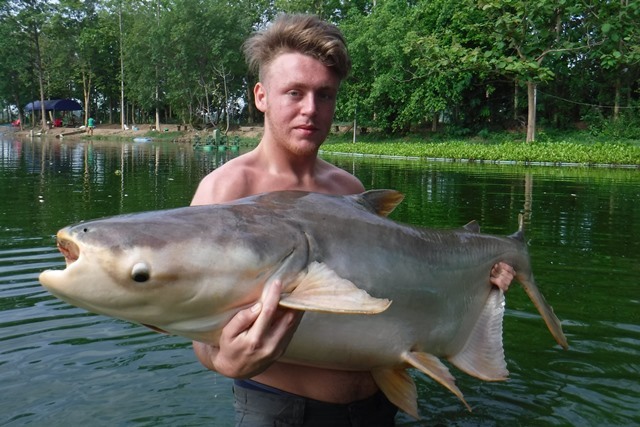 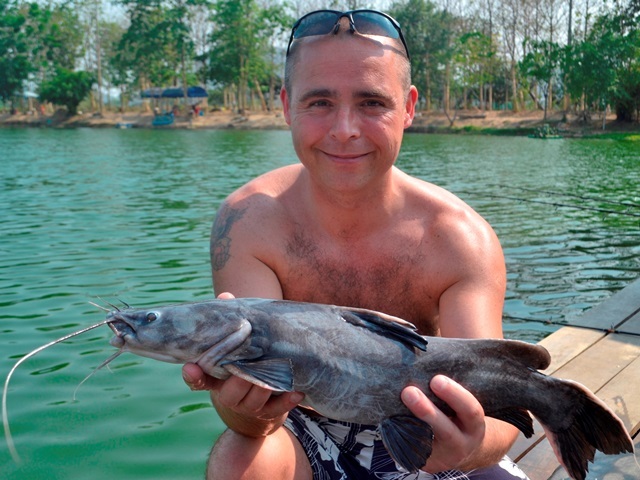 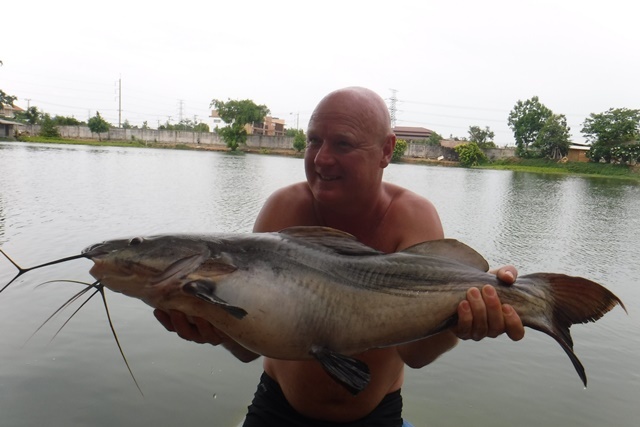 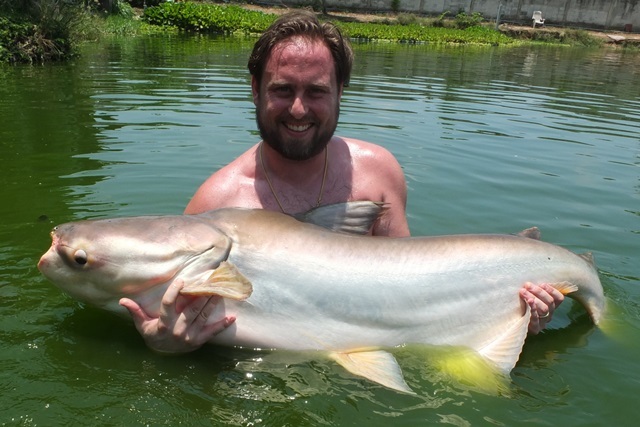 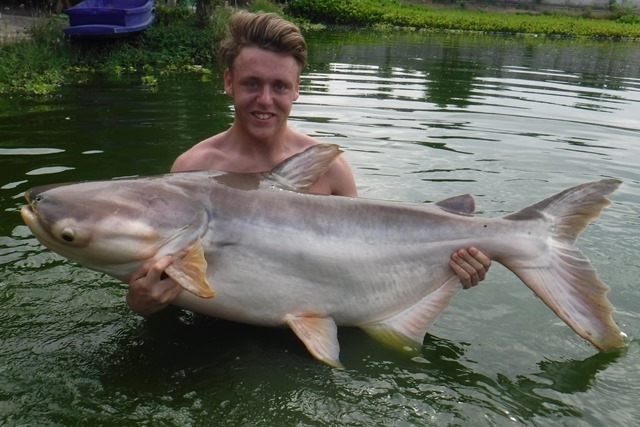 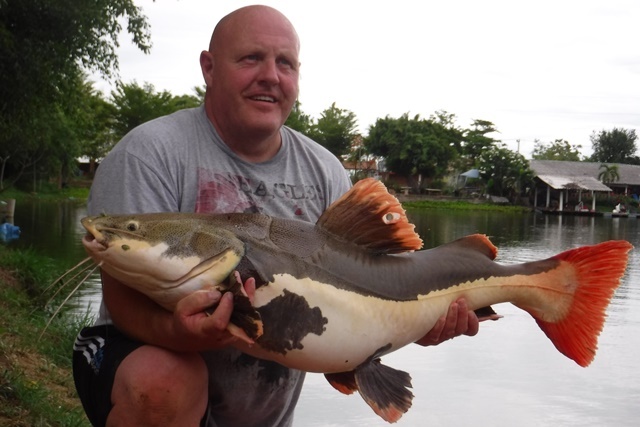 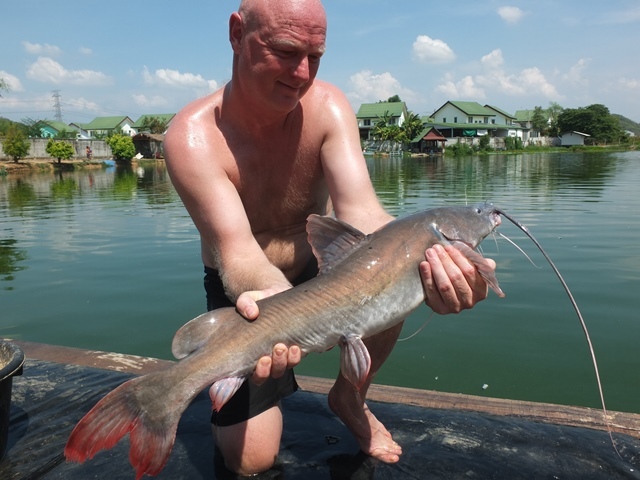 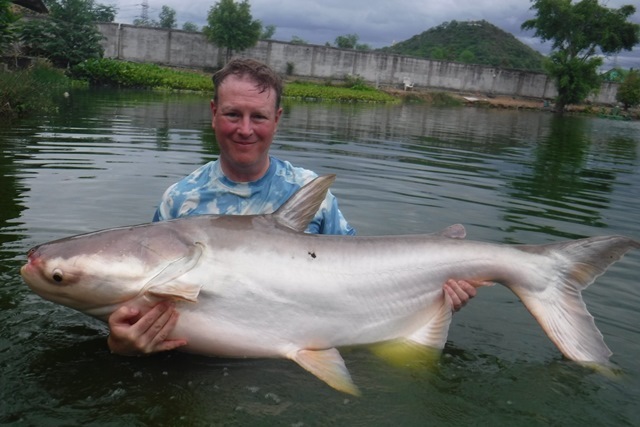 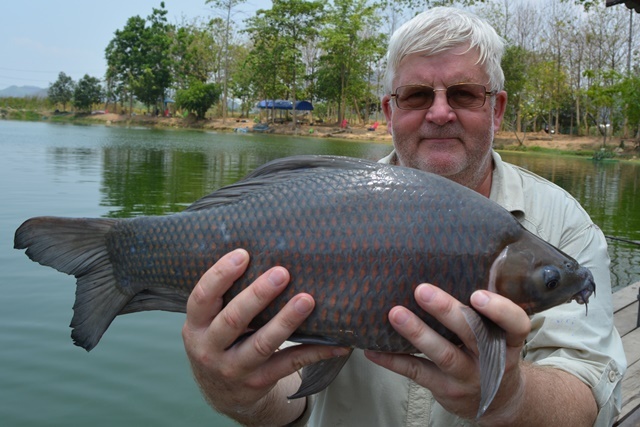 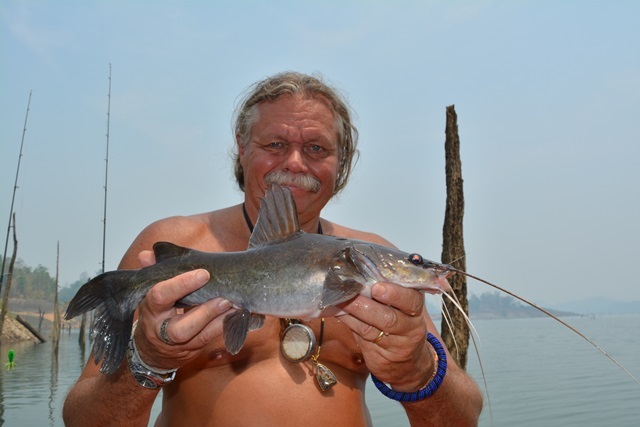 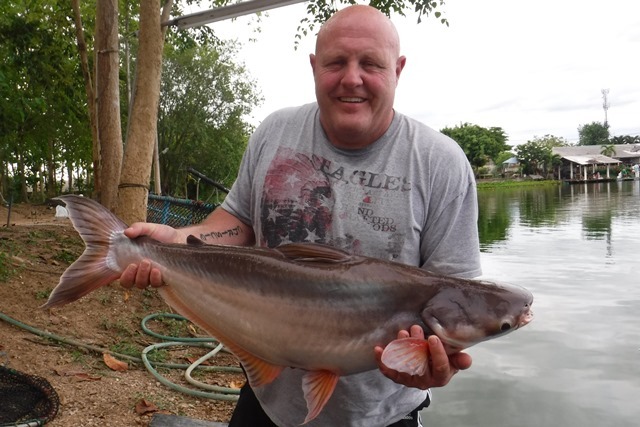 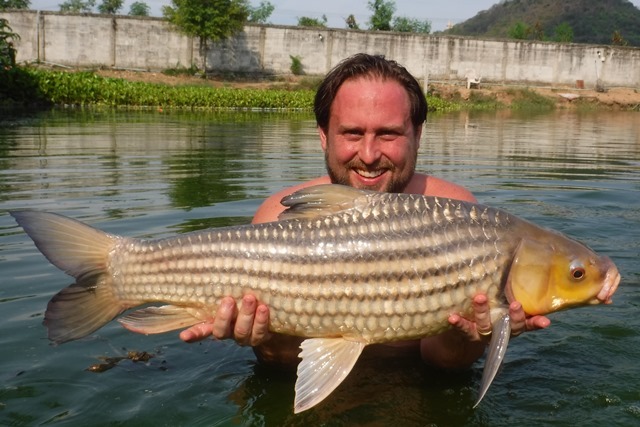 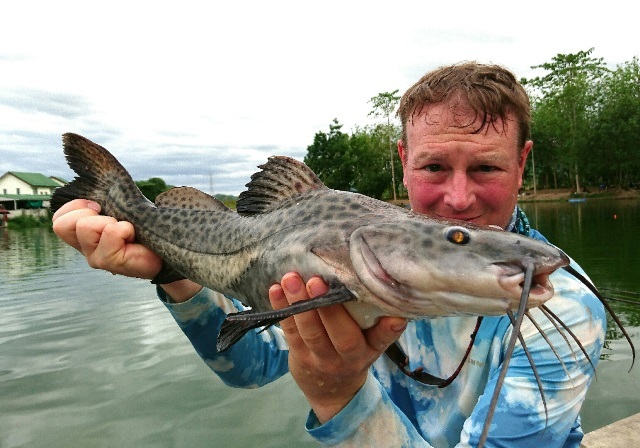 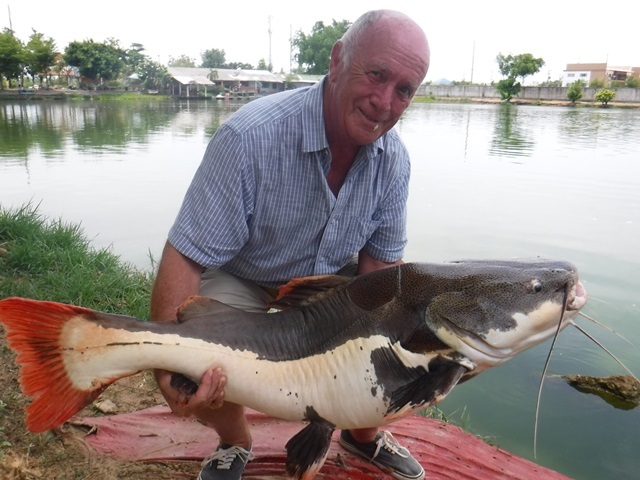 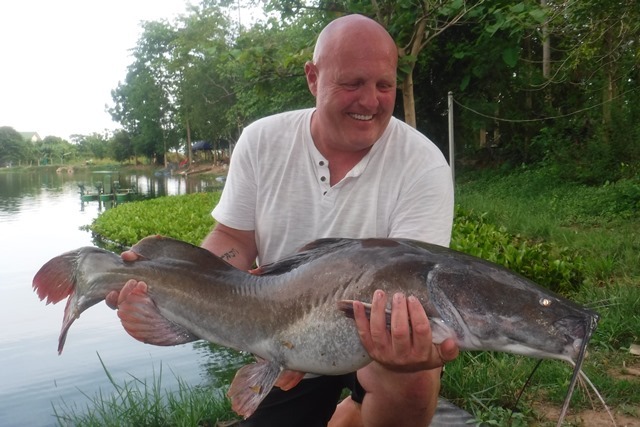 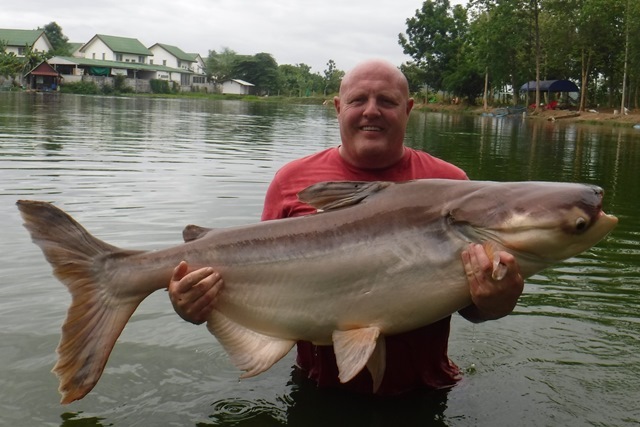 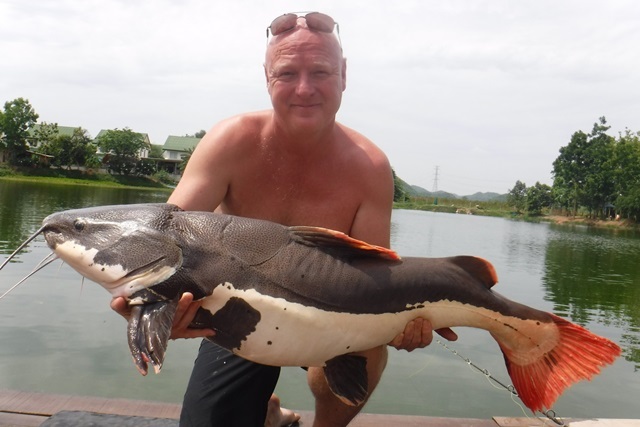 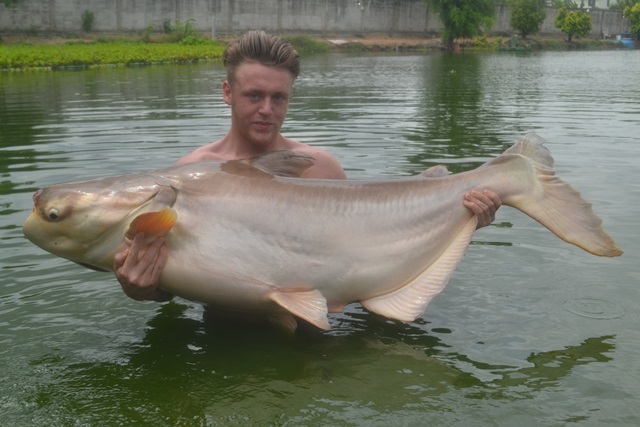 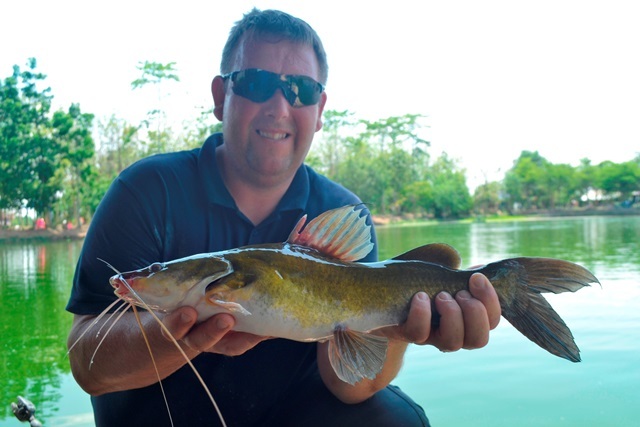 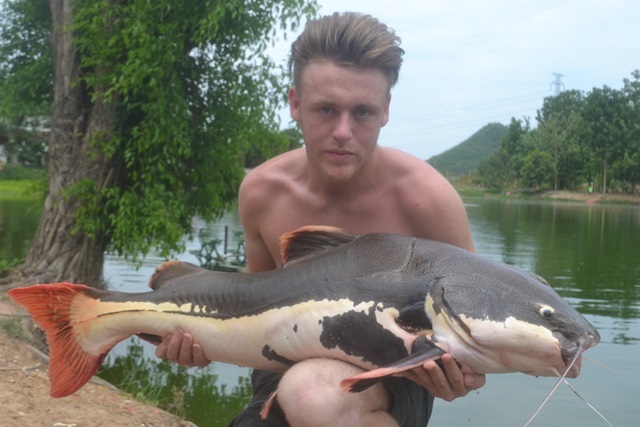 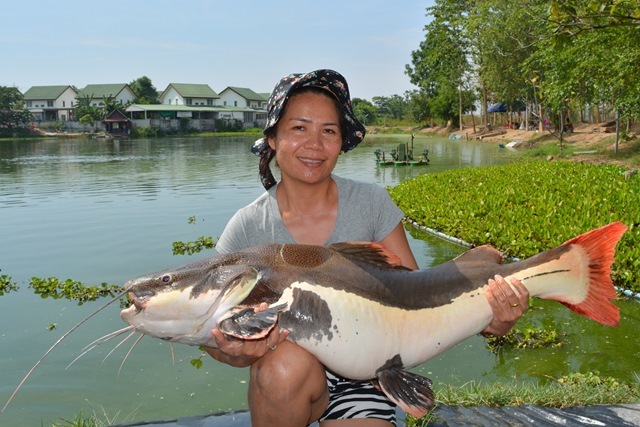 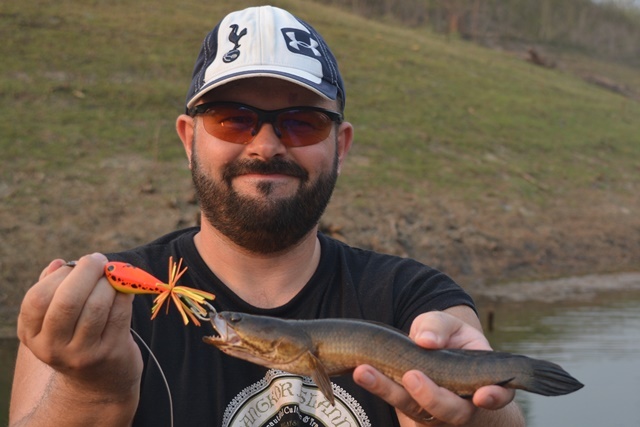 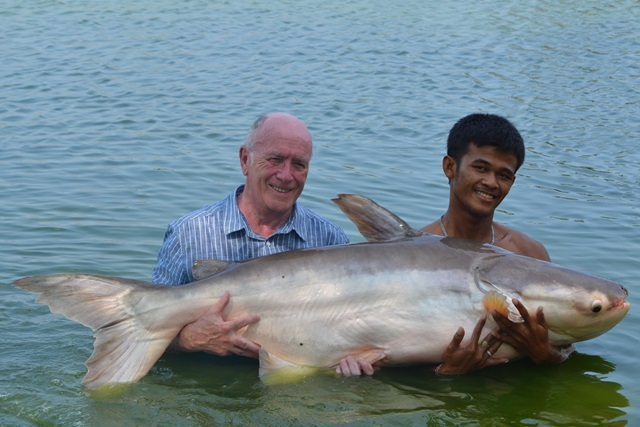 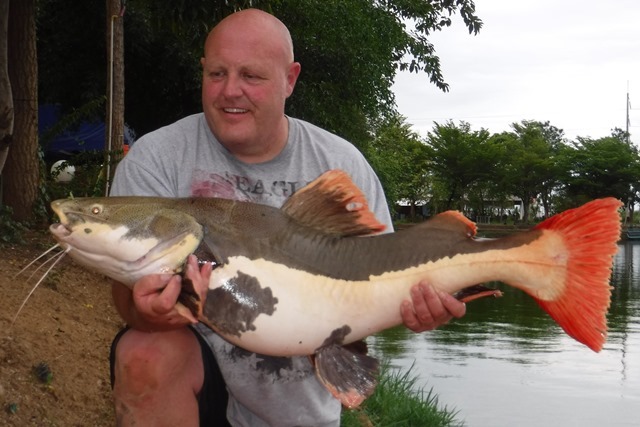 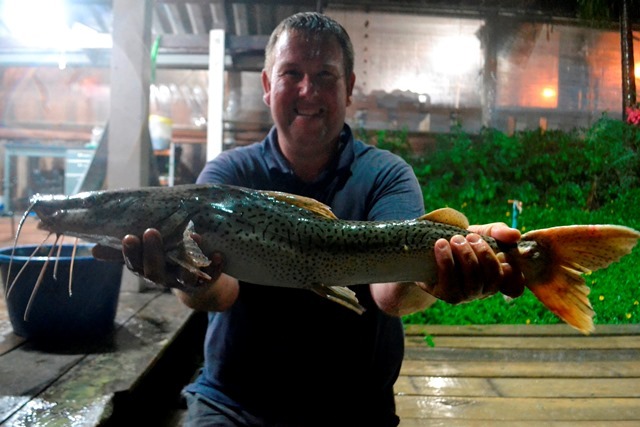 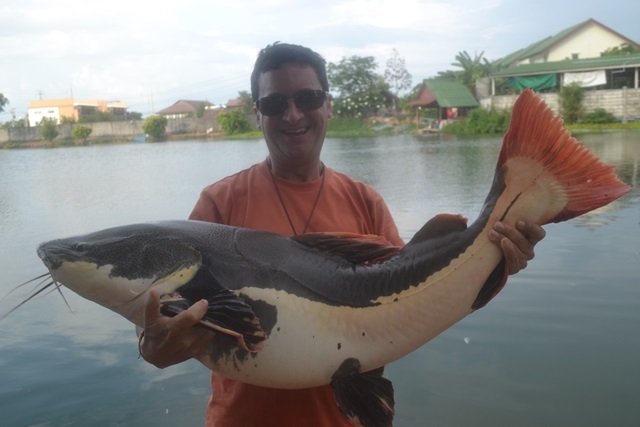 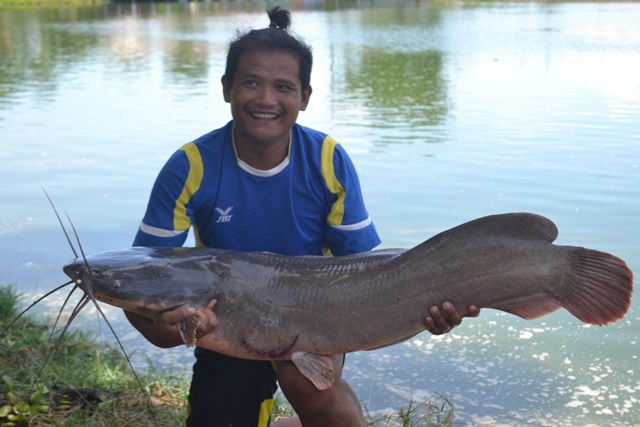 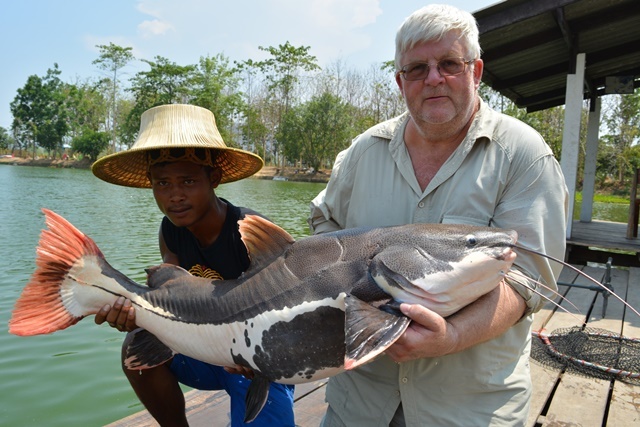 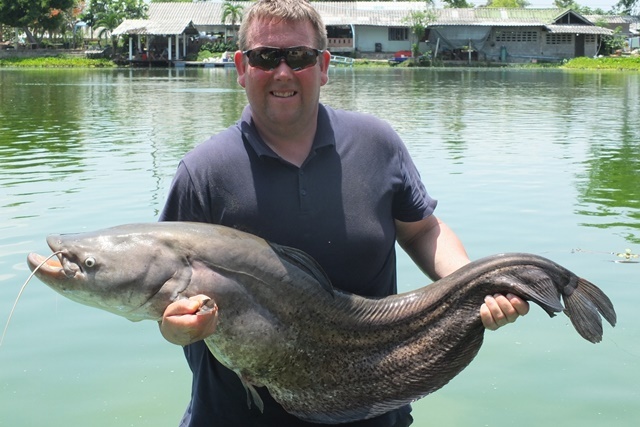 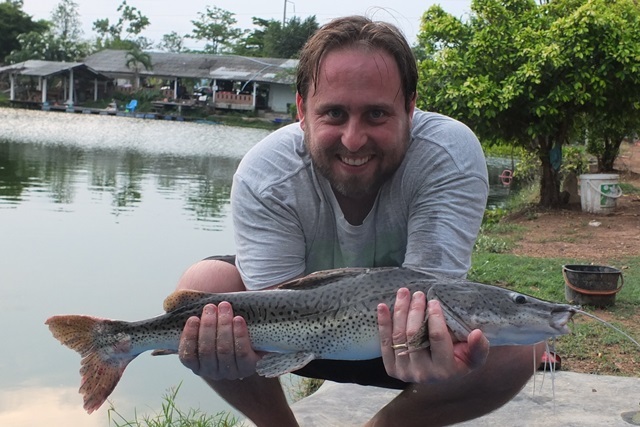 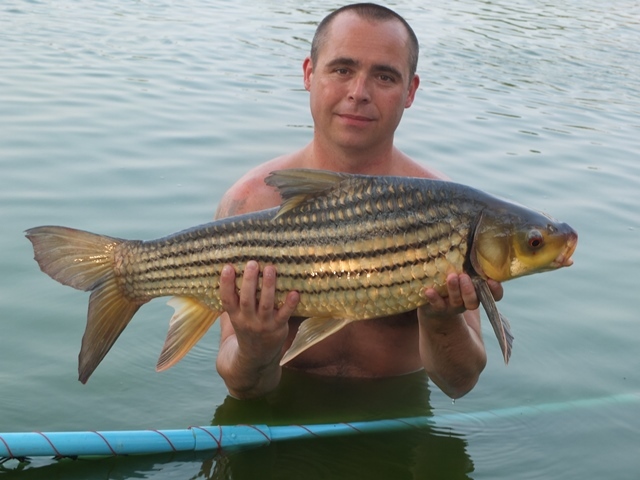 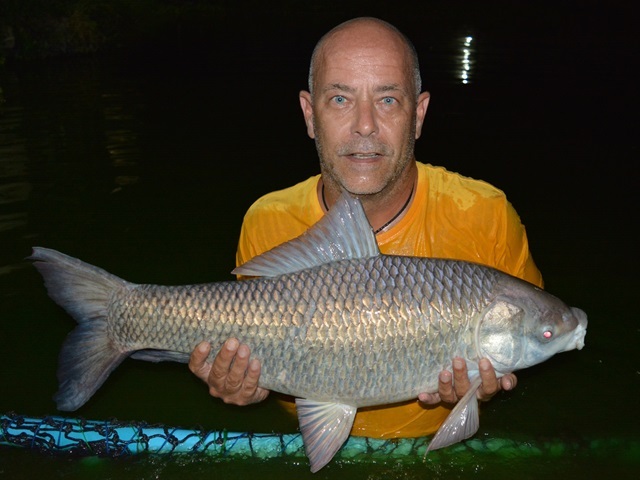 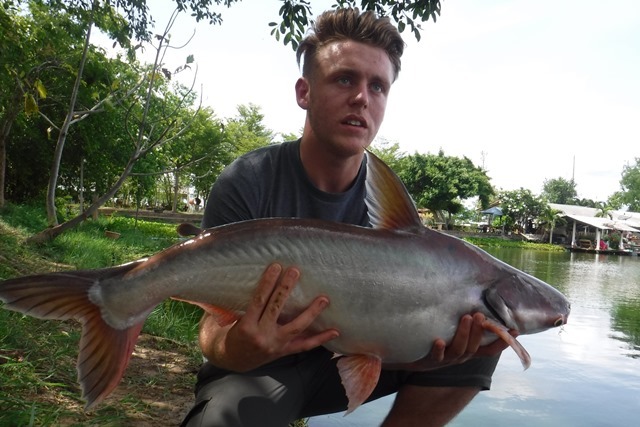 Tap of Bangkok Fishing Guide Service customer Colin from his first visit of the month caught a rare wallago leeri as well as Mekong catfish and catfish shark which was enough for him to return later in the month. 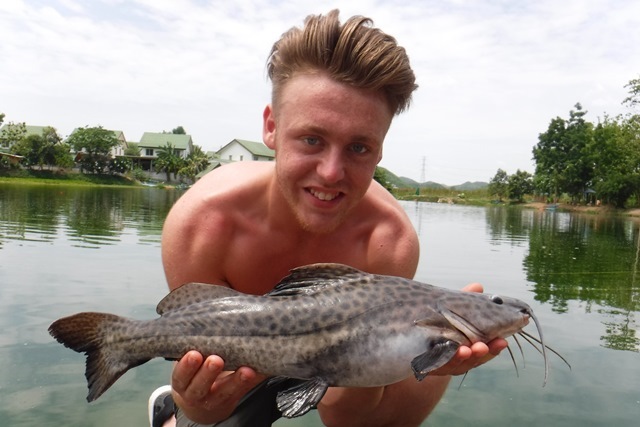 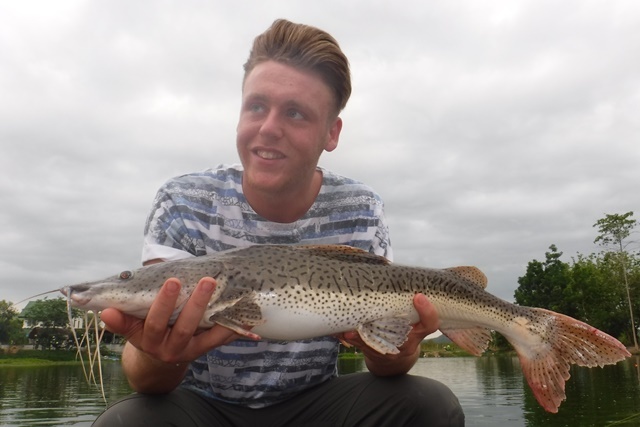 Sam Duhig was another angler that caught a wide variety of species during his session. 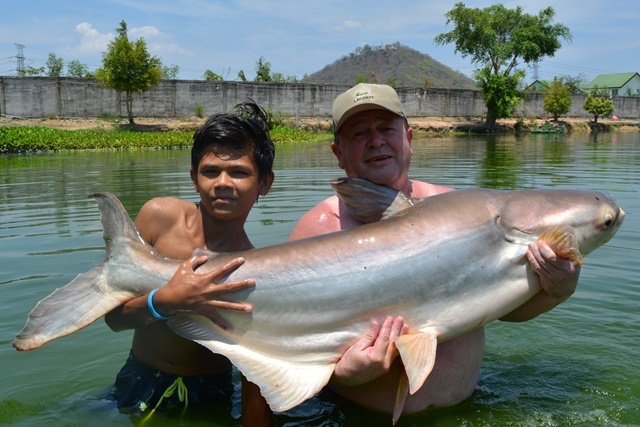 which include both Siamese carp and Mekong catfish to well over the 100lb mark, a stunning alligator gar and a rare vulture catfish. 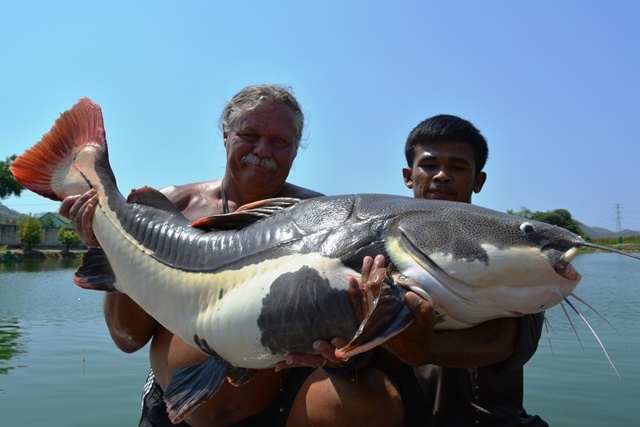 In addition he also landed Amazon redtail, pacu, arapiama, striped catfish, catfish shark, tambaqui and leopard catfish. 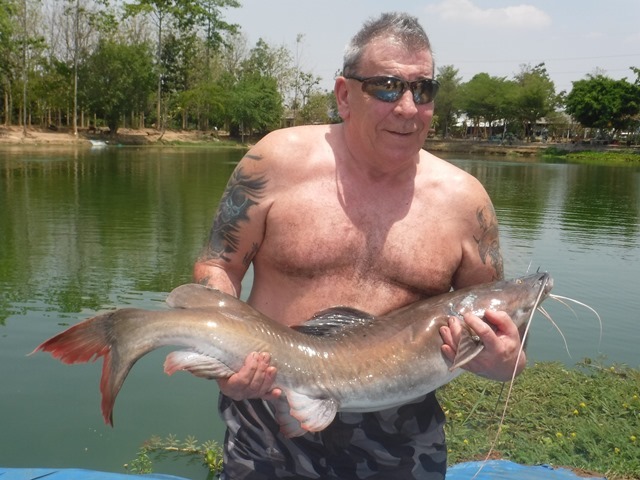 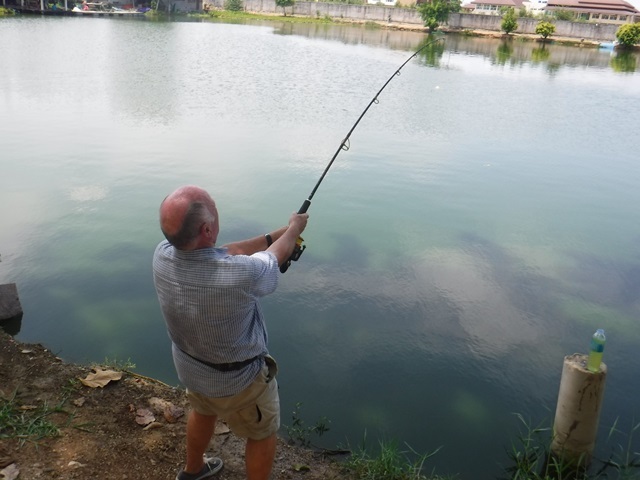 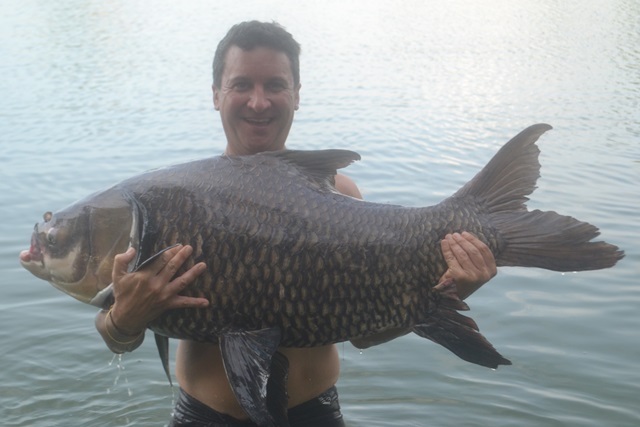 John Wilson's good friend Ste Hart came down specifically to try and catch some 100lb+ Mekong catfish which he had no problem in doing several times over. 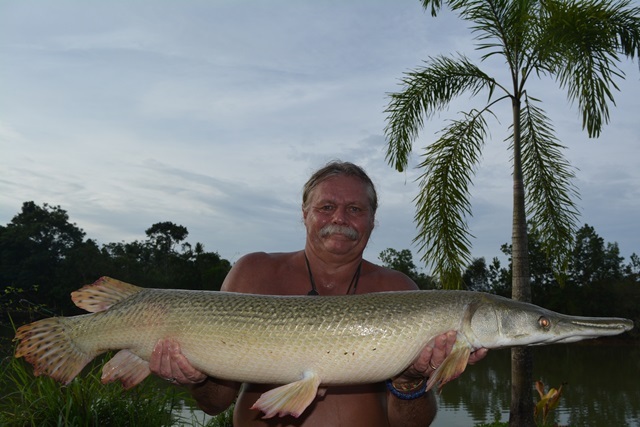 He also caught several new species for him namely wallago leeri, Mollycot and rohu as wells as a number of Amazon redtail. 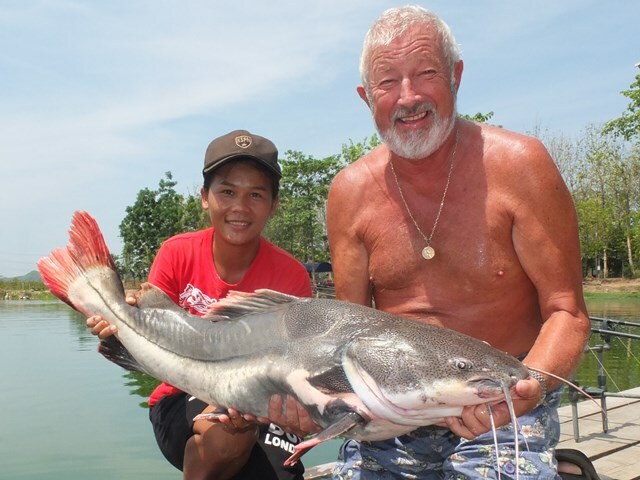 John from Shooters Bar in Pattaya make his inaugural trip up to Palm Tree. 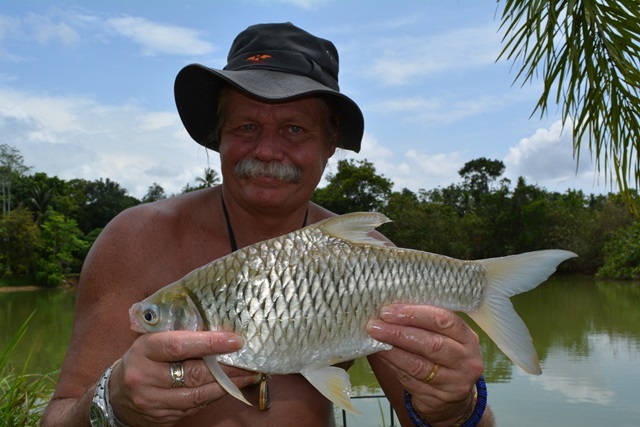 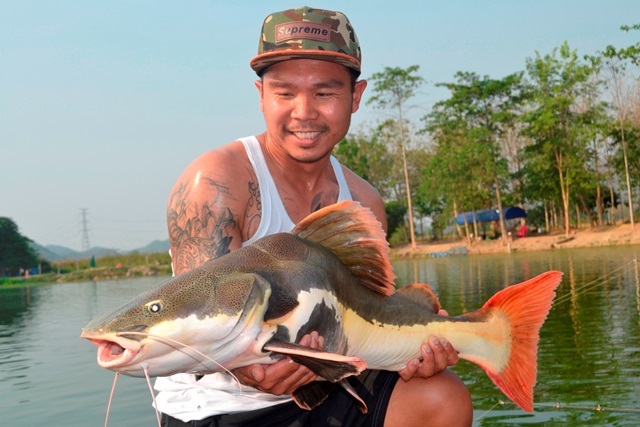 He caught a number of nice catches that included Siamese carp, Mekong catfish, Amazon redtail and rohu. 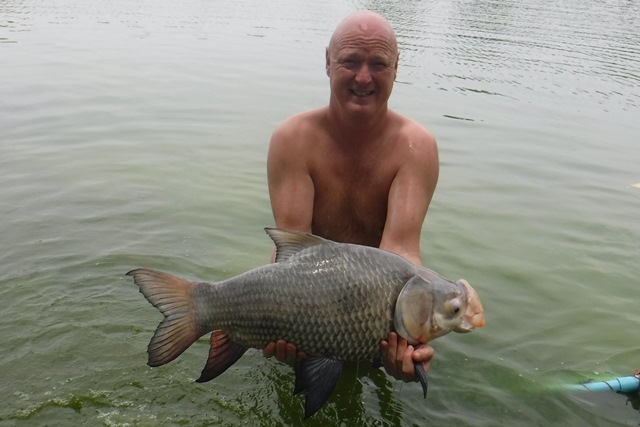 Ian White was another angler making his first visit to Palm Tree and what a successful one it was too. 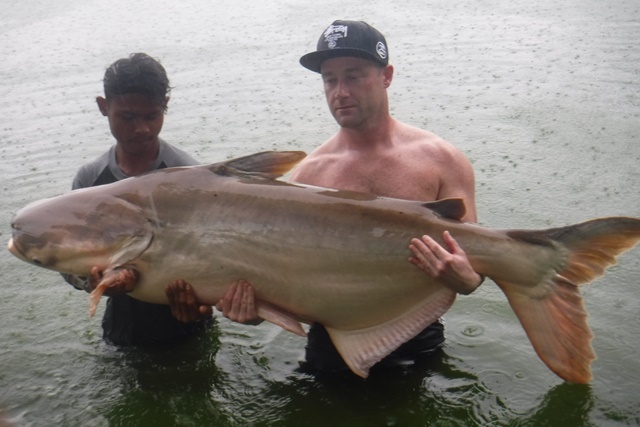 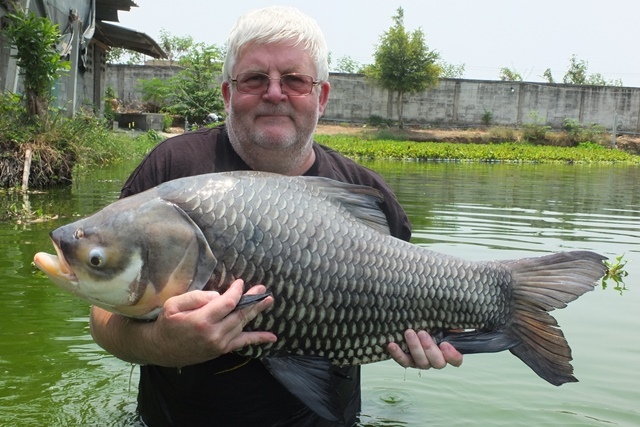 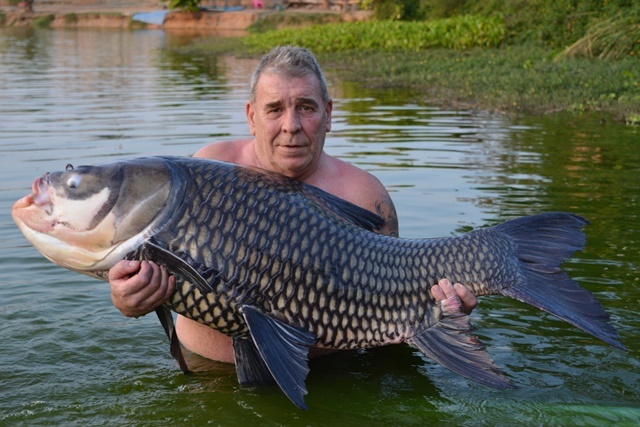 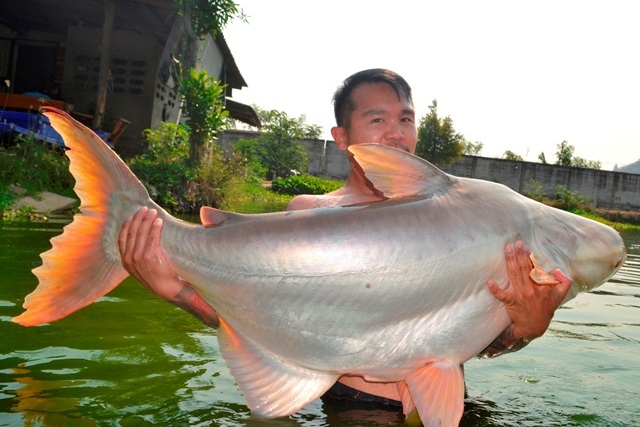 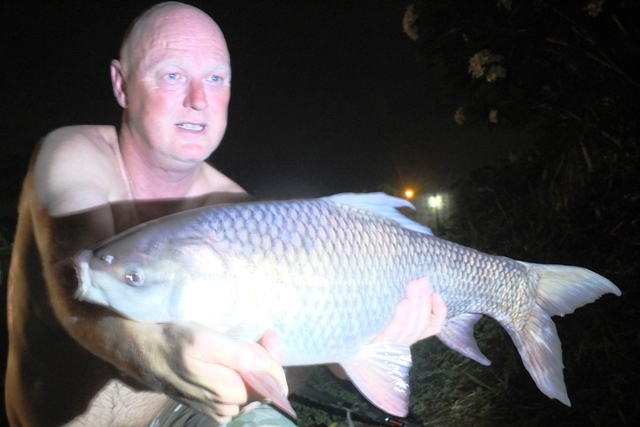 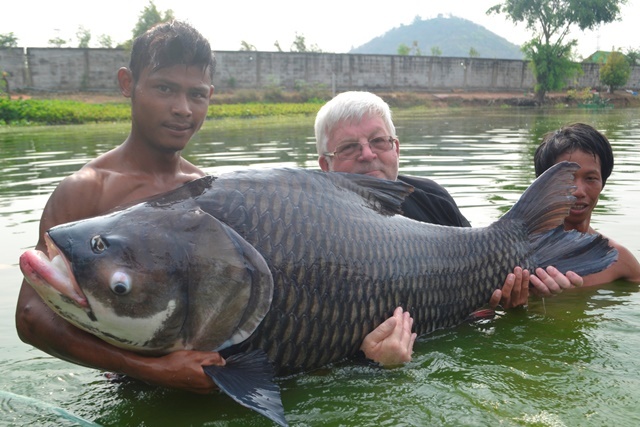 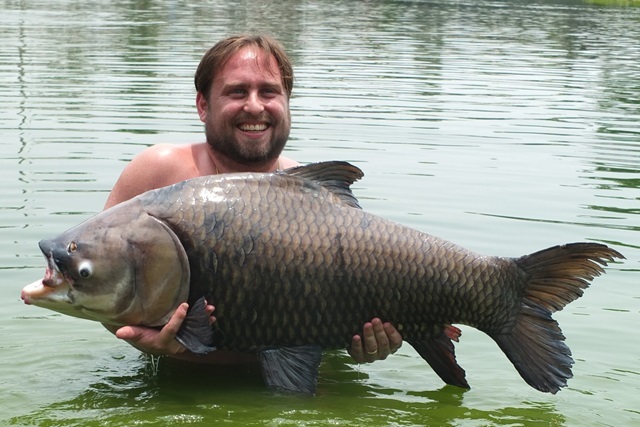 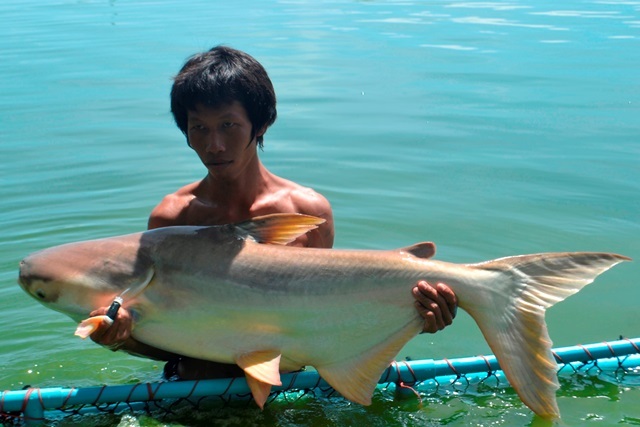 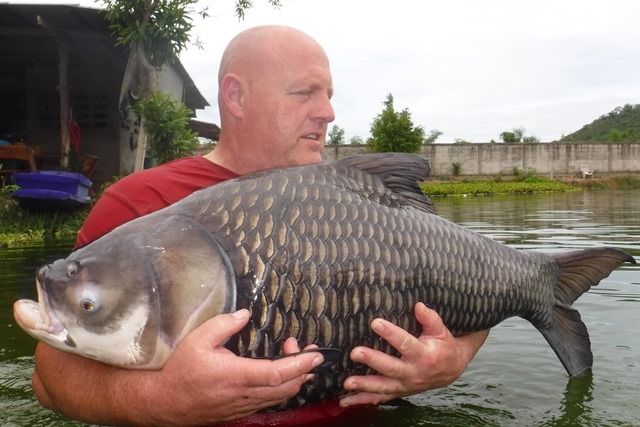 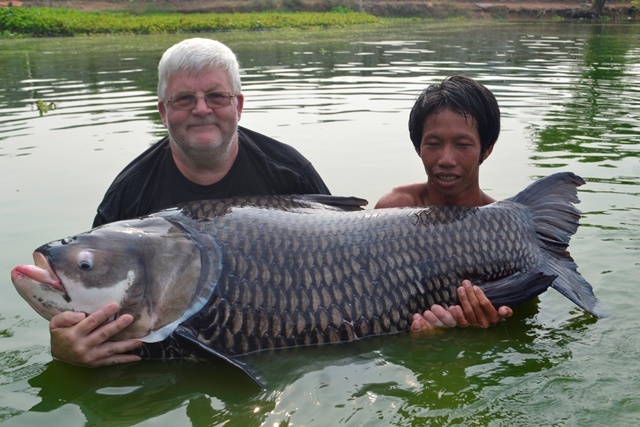 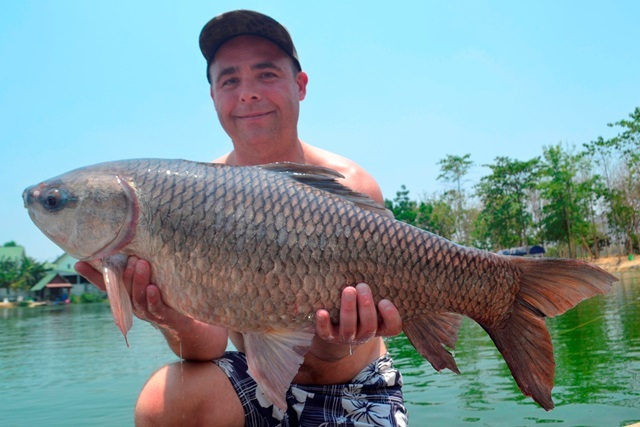 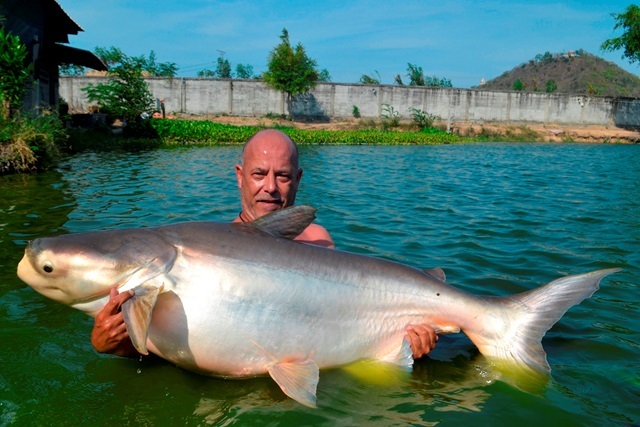 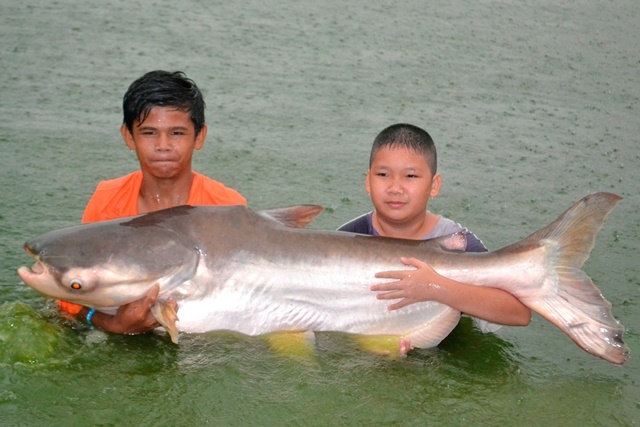 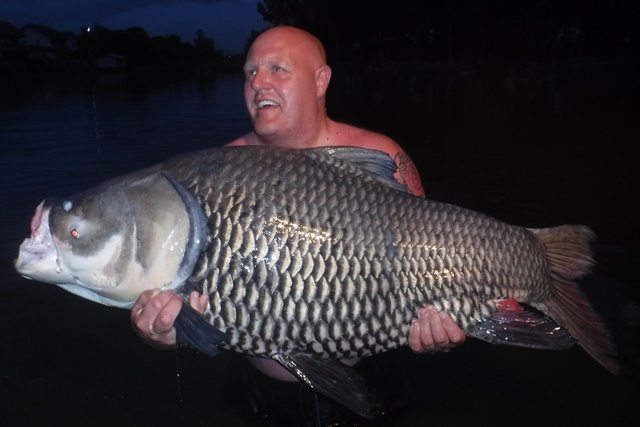 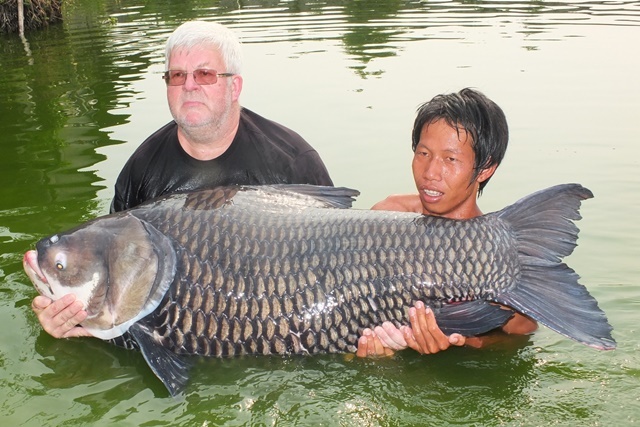 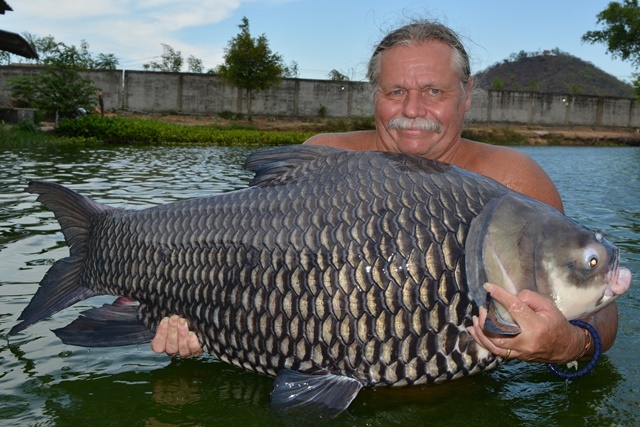 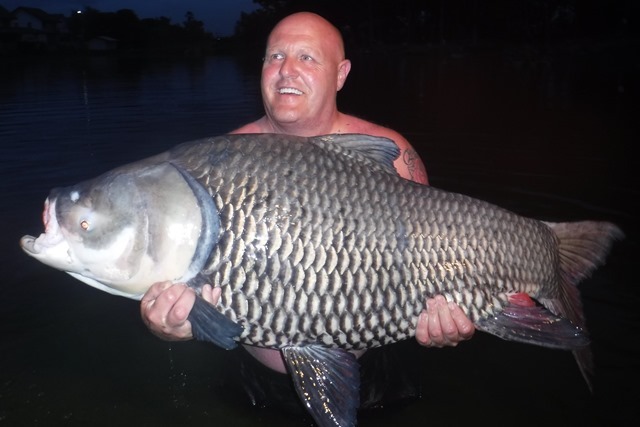 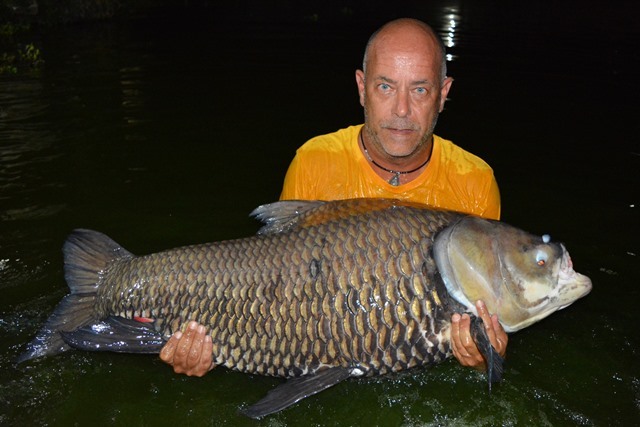 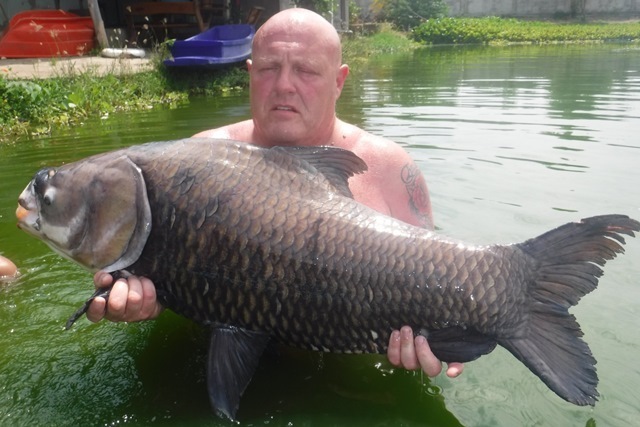 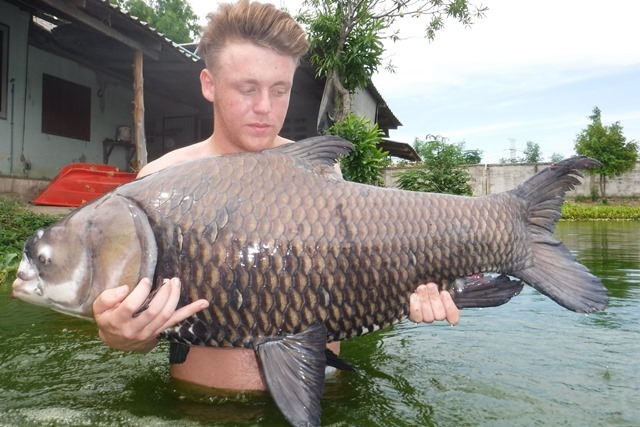 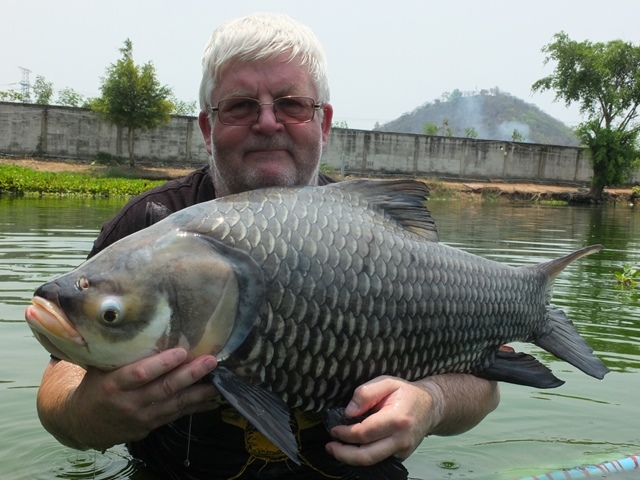 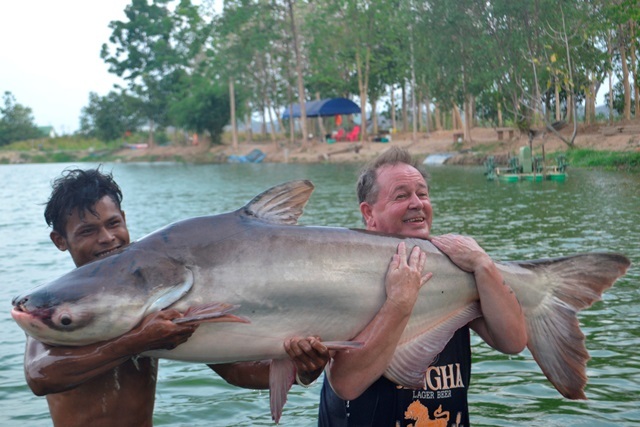 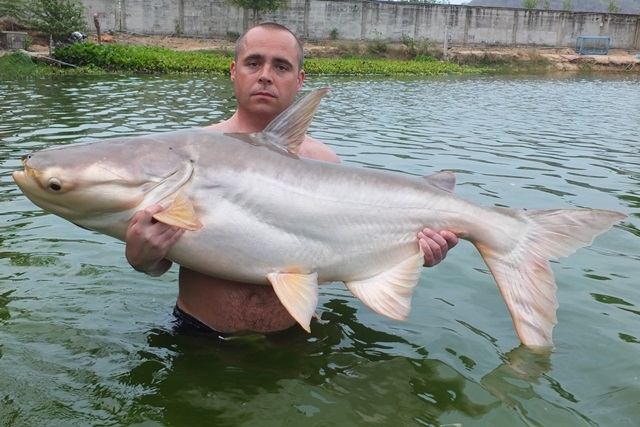 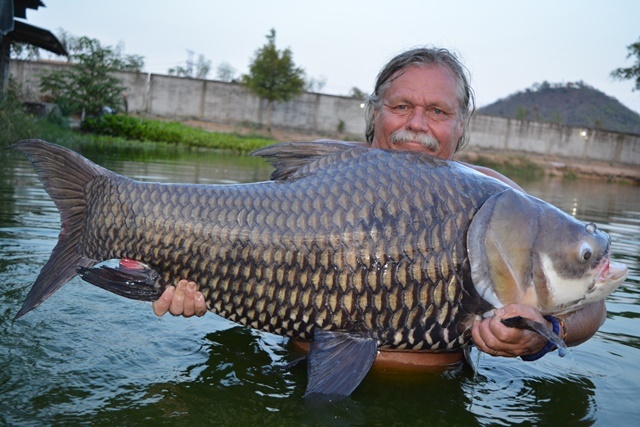 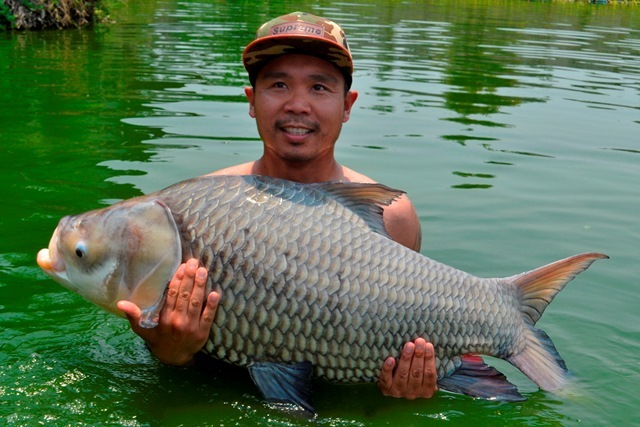 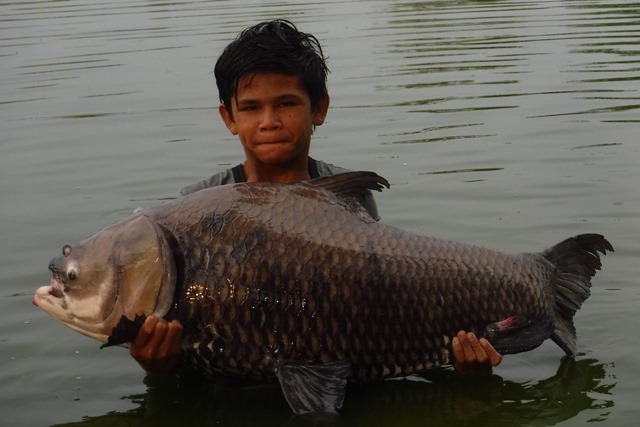 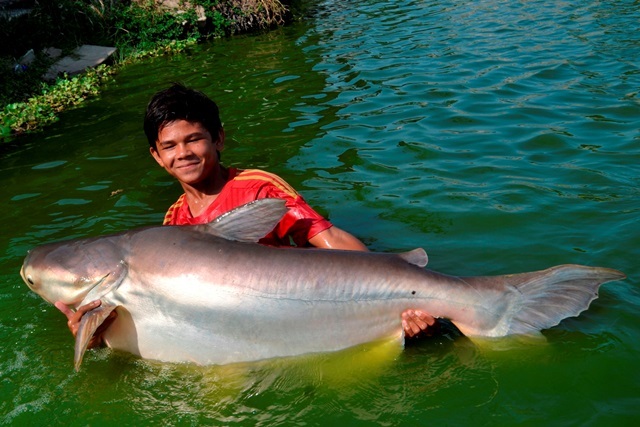 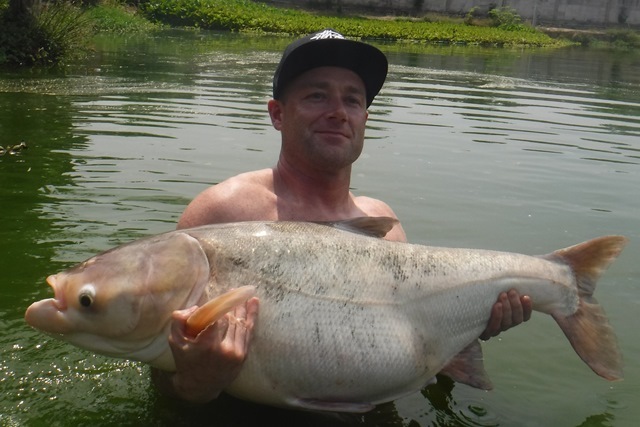 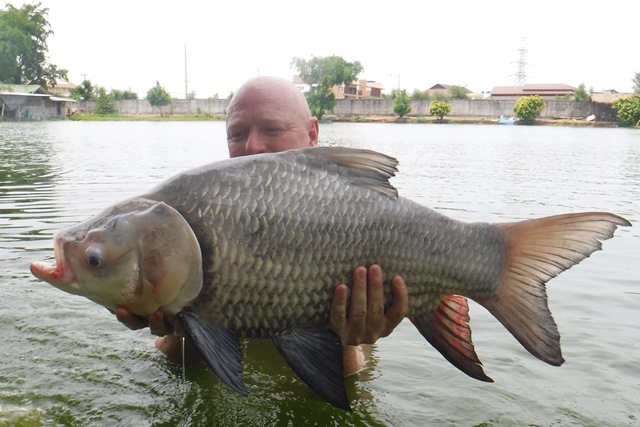 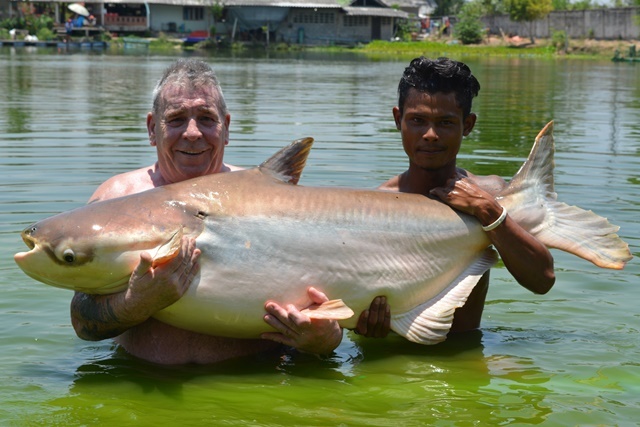 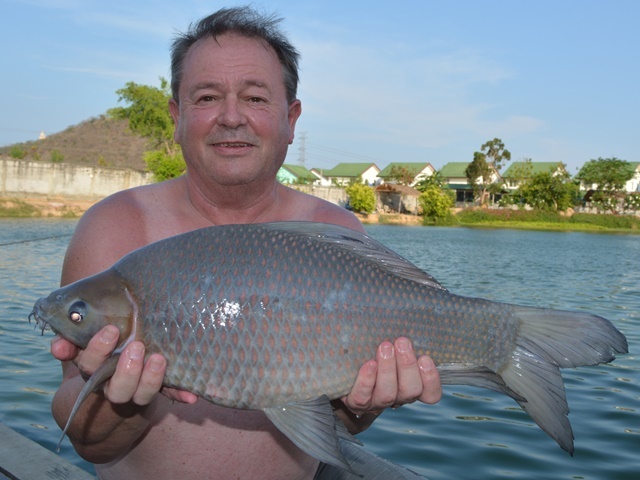 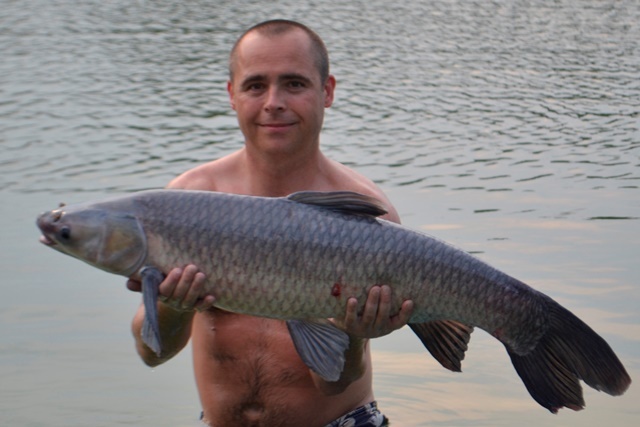 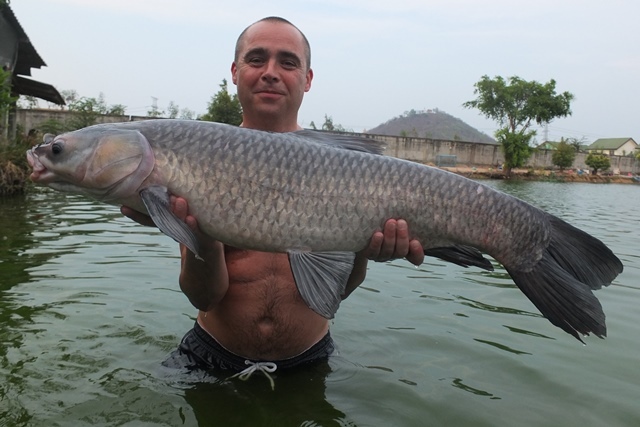 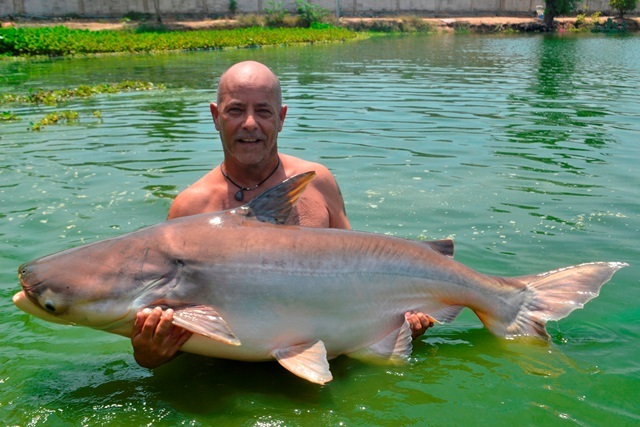 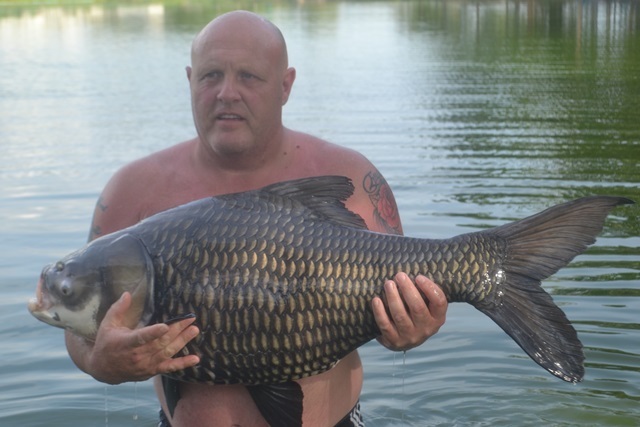 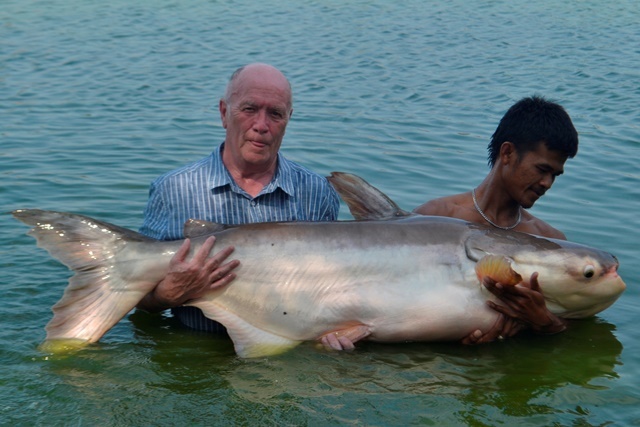 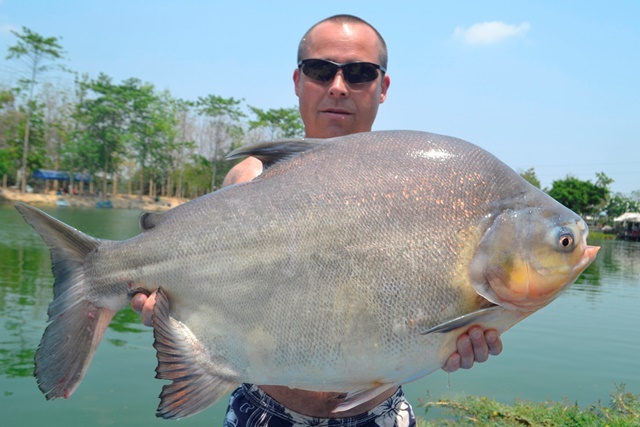 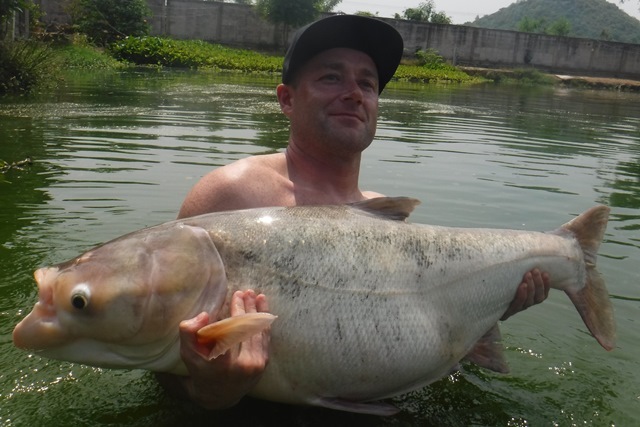 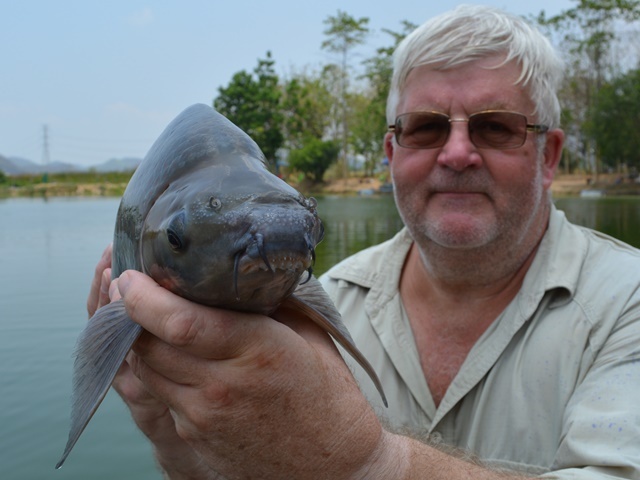 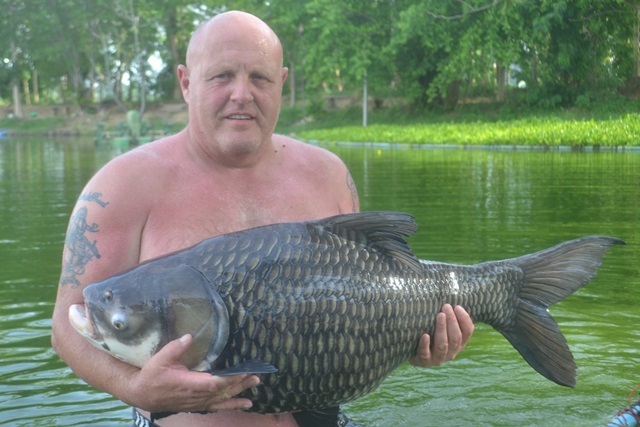 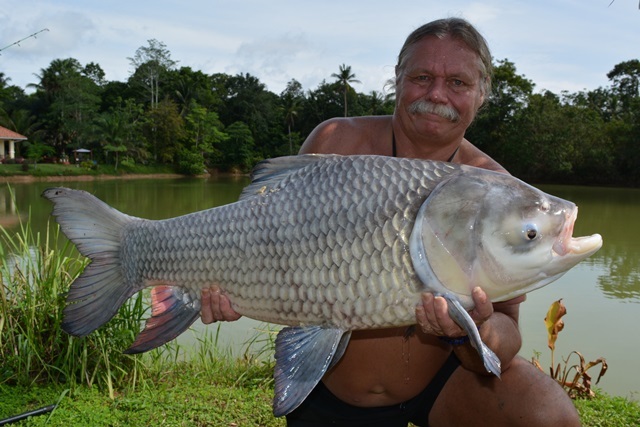 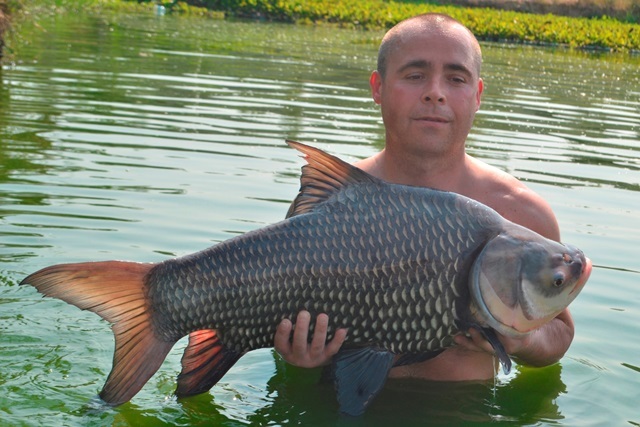 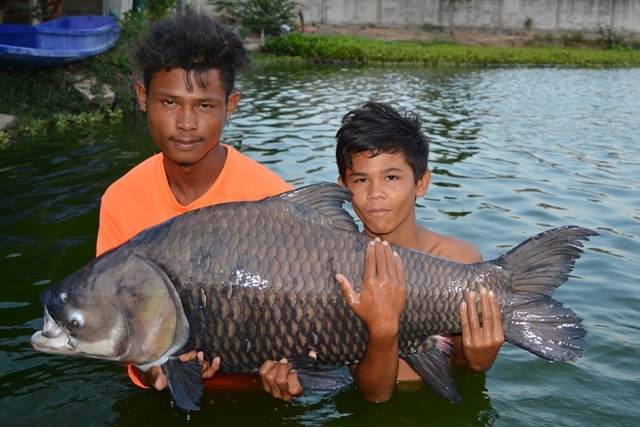 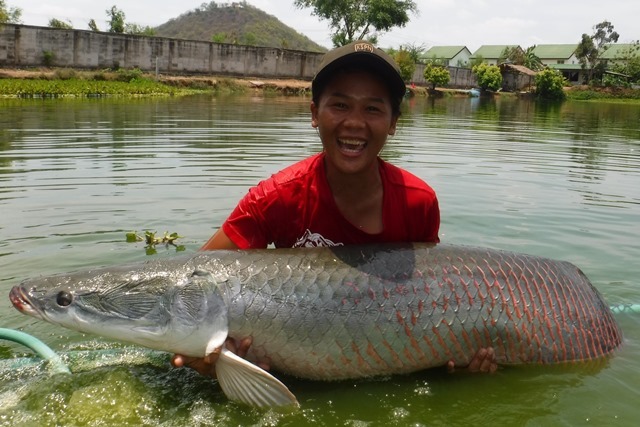 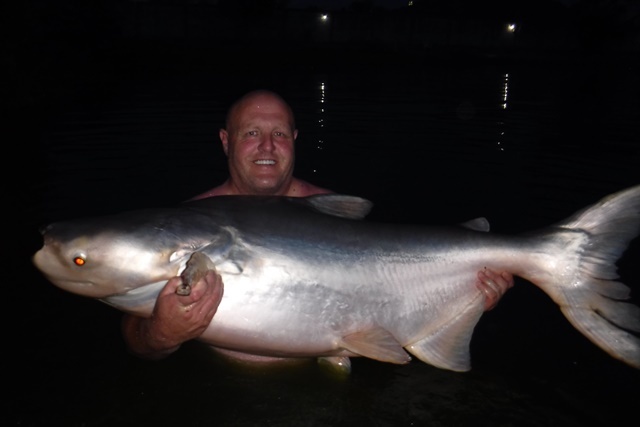 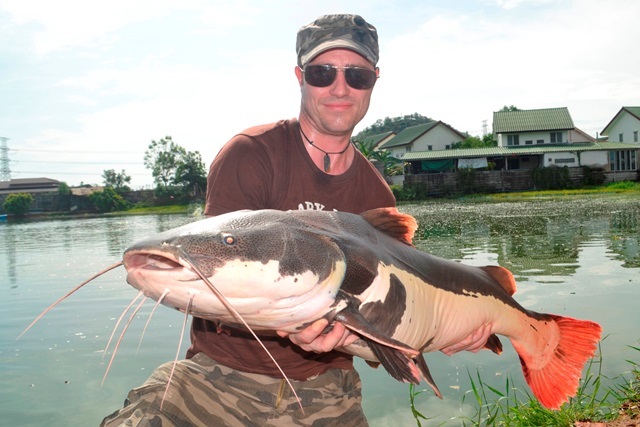 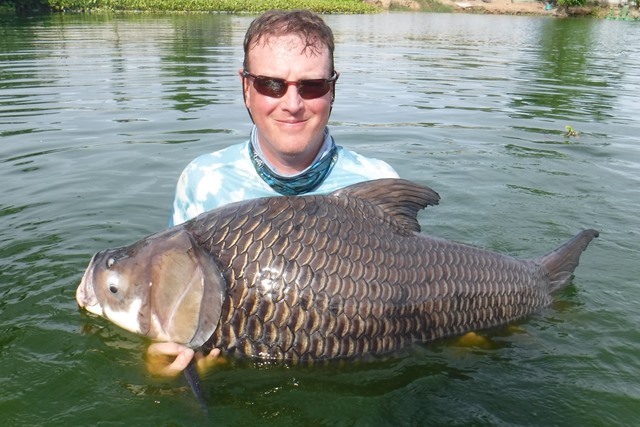 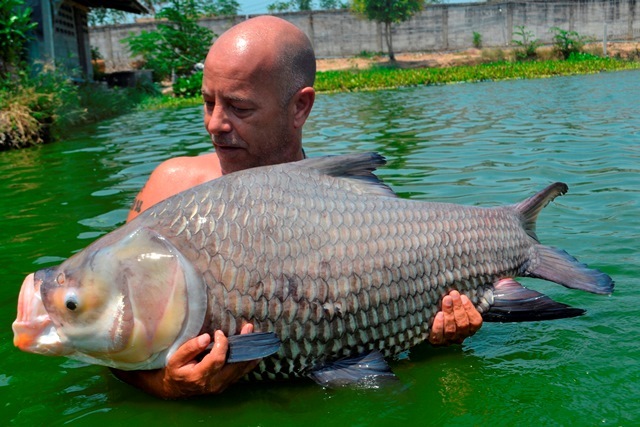 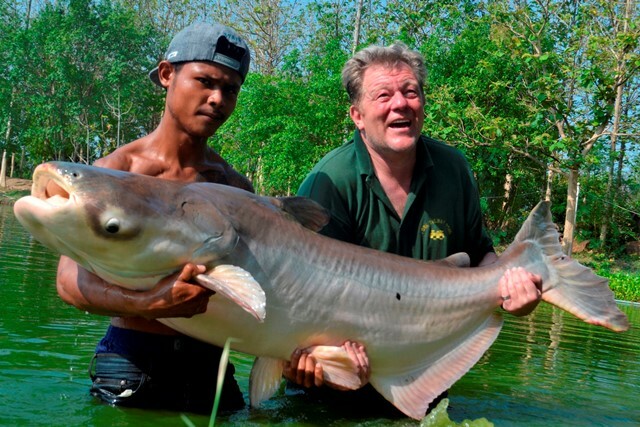 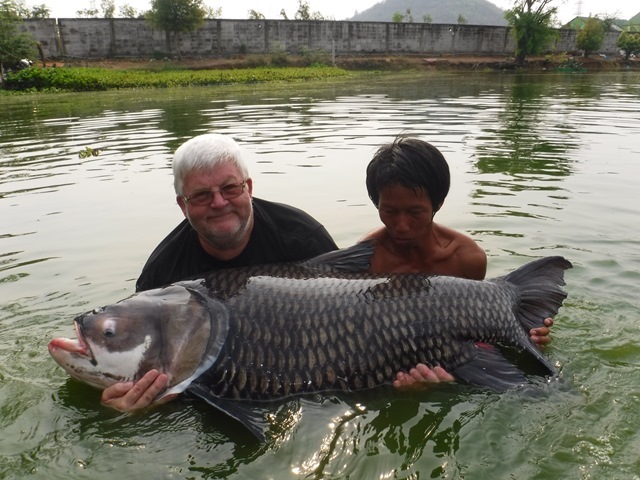 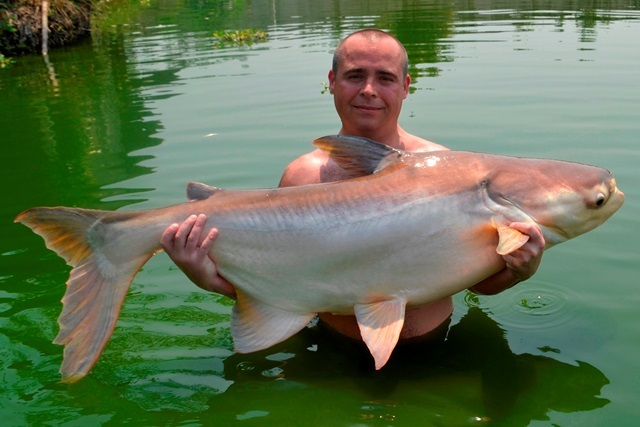 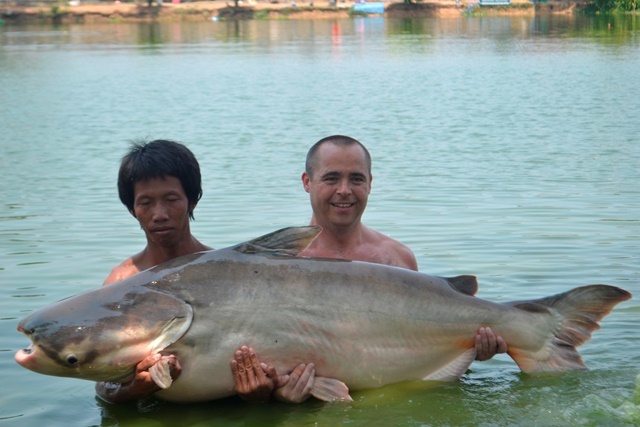 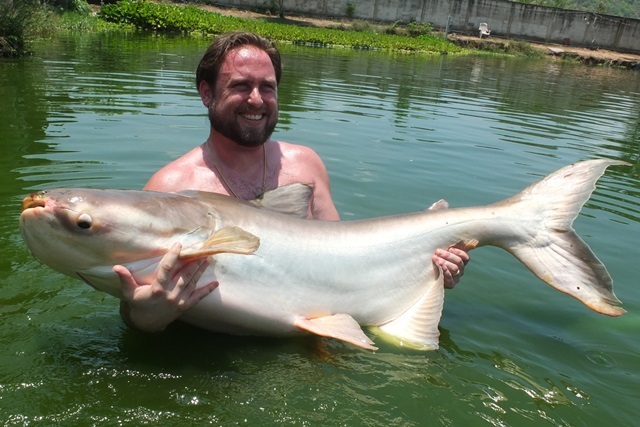 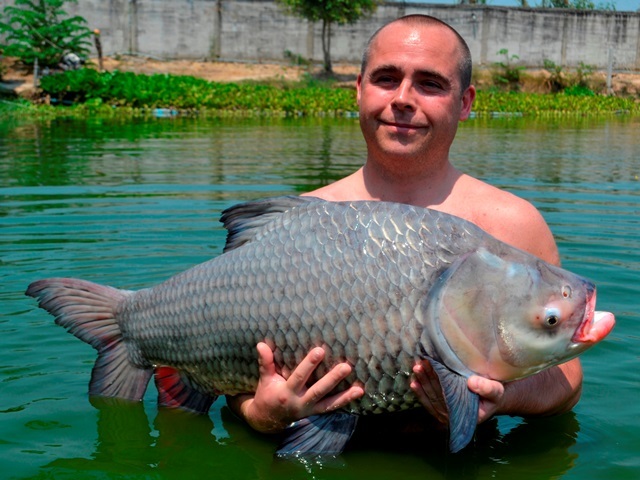 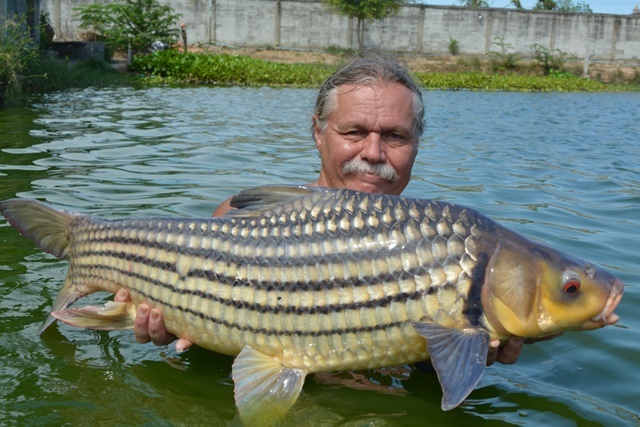 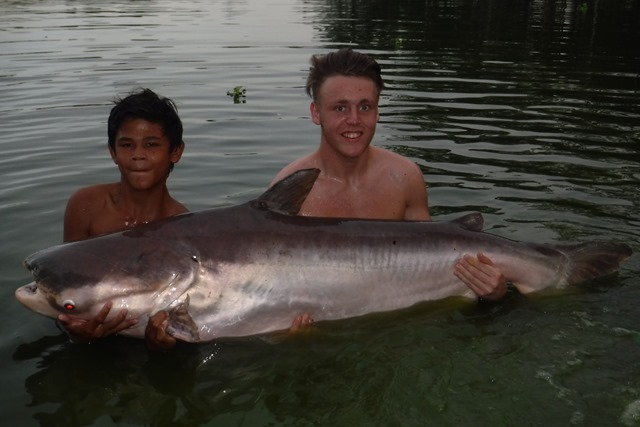 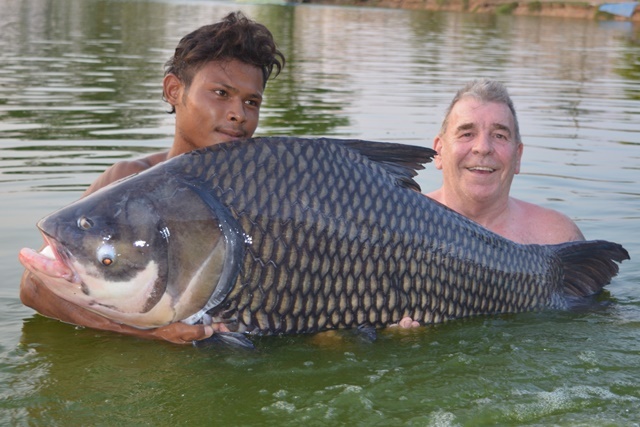 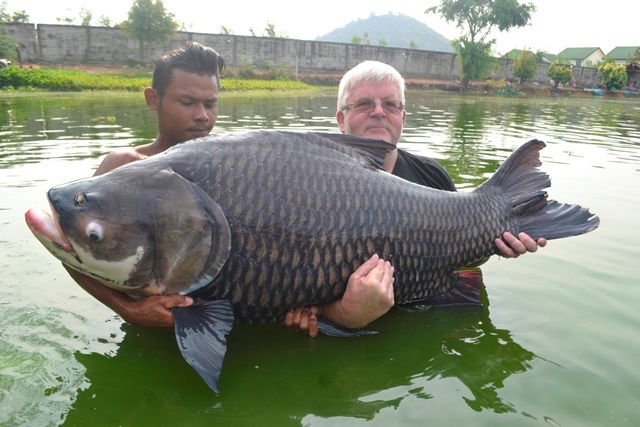 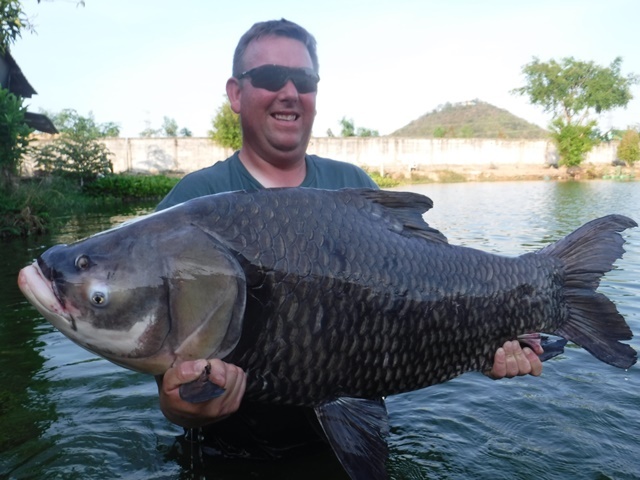 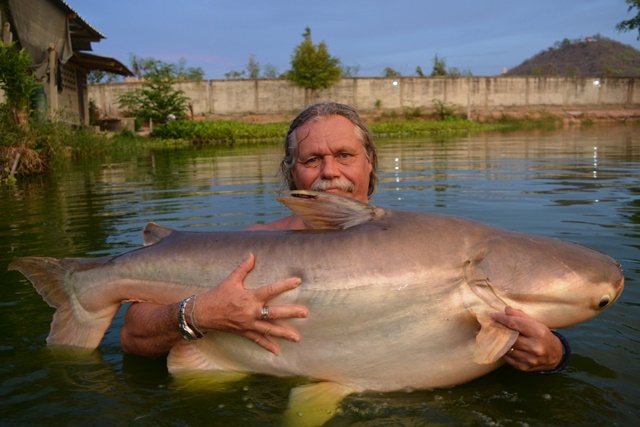 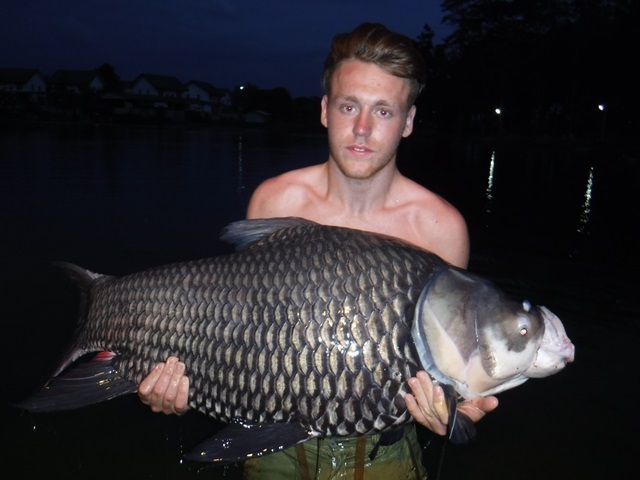 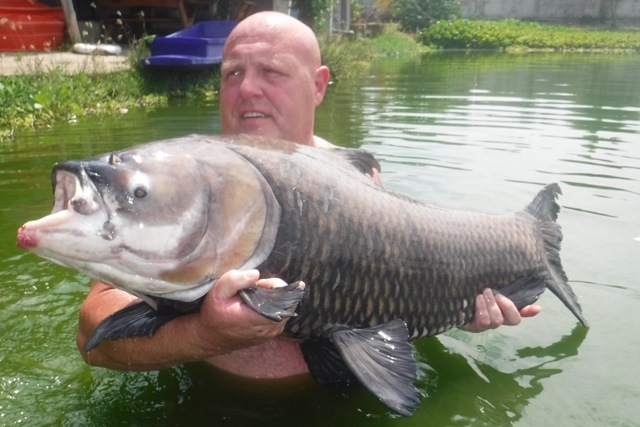 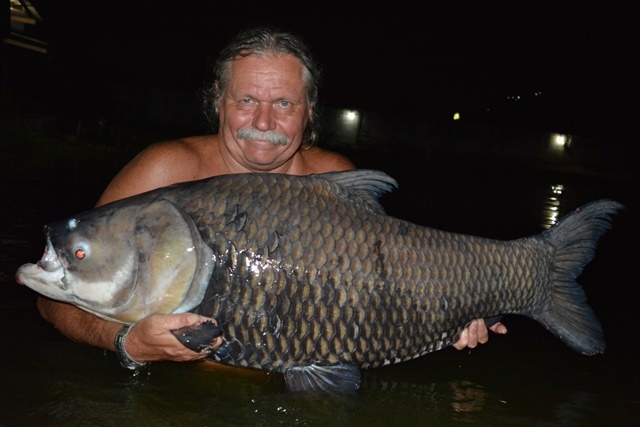 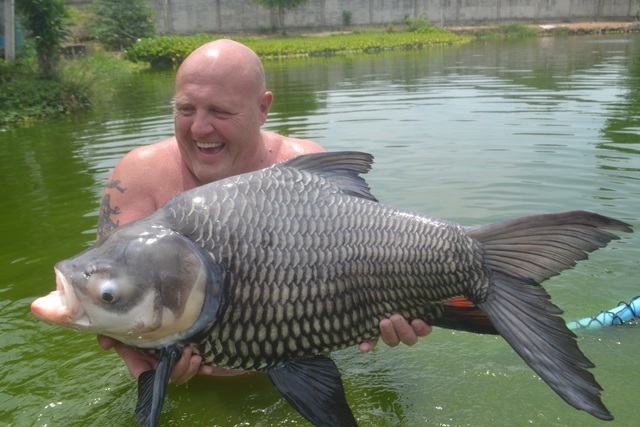 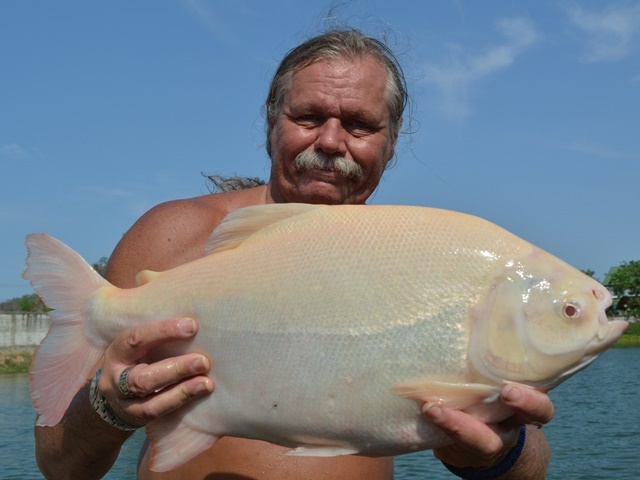 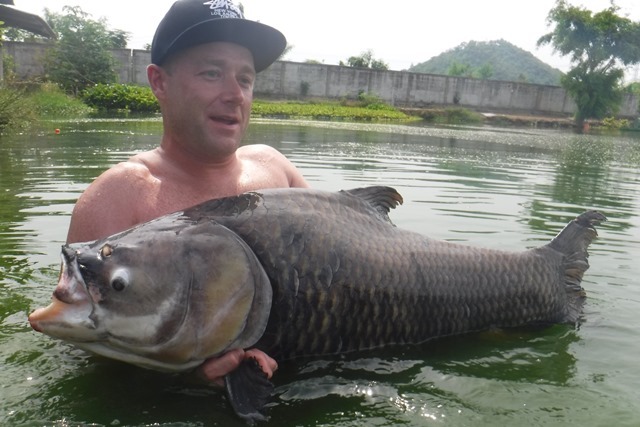 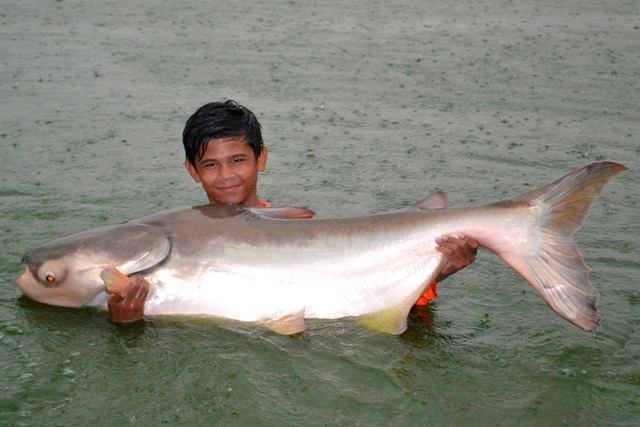 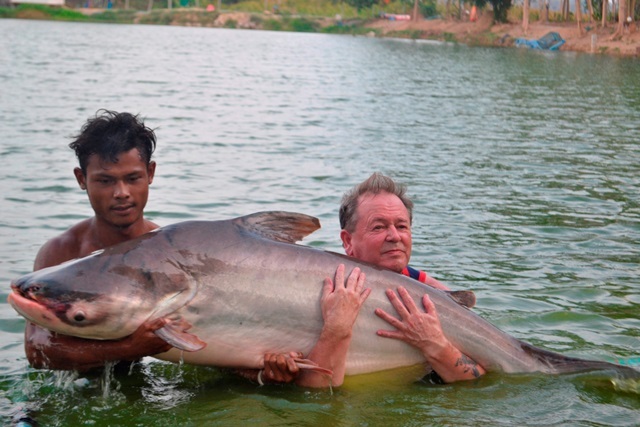 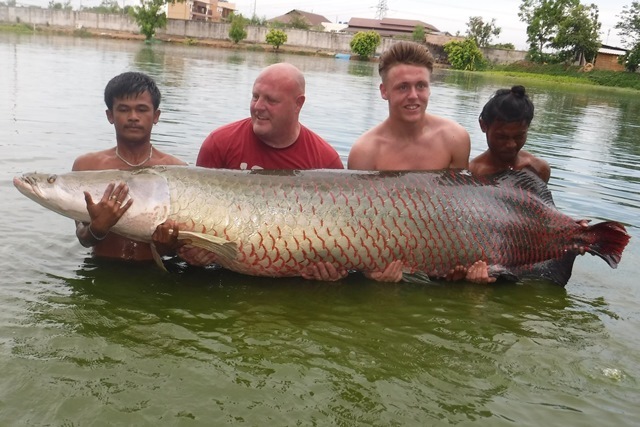 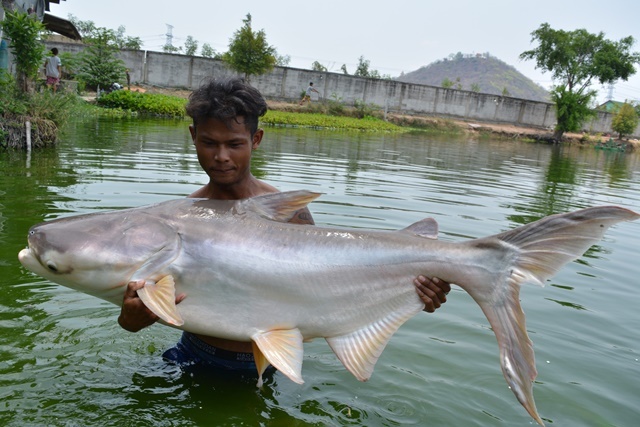 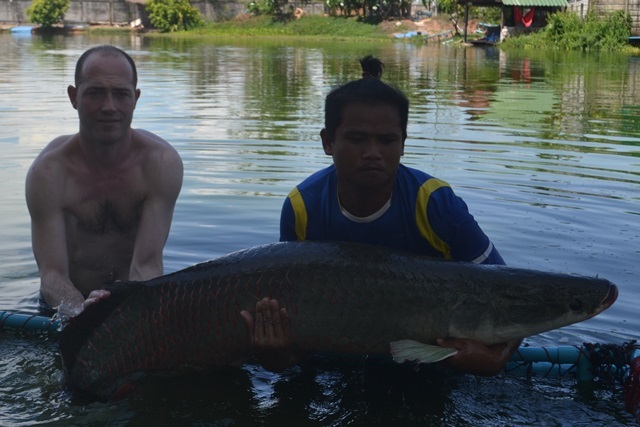 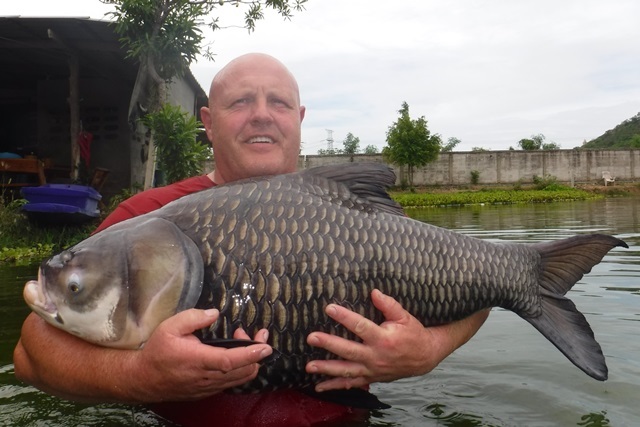 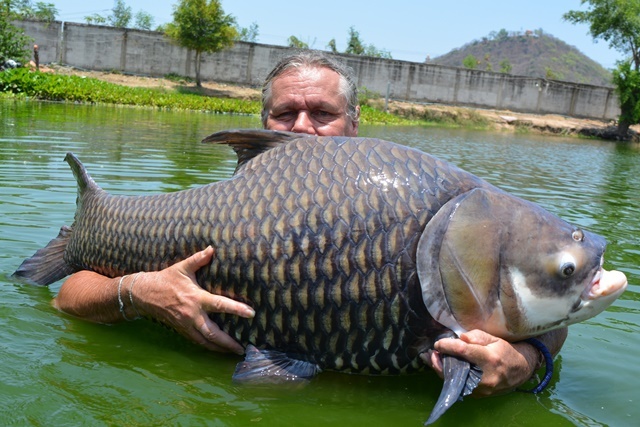 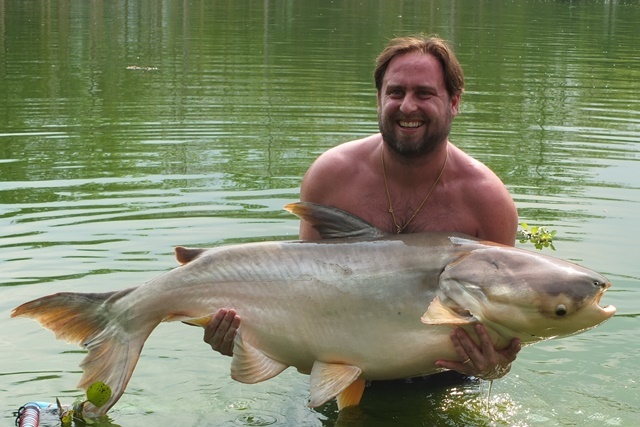 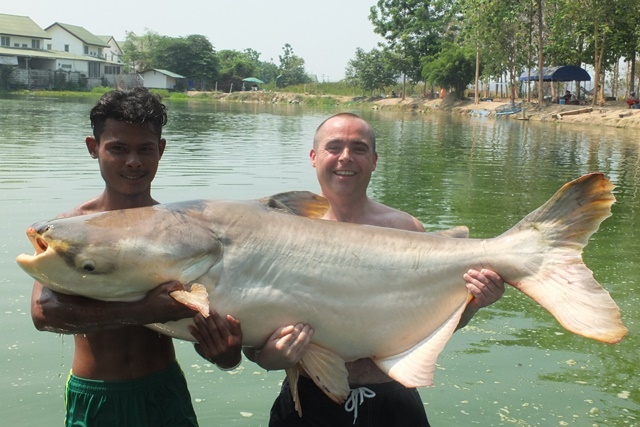 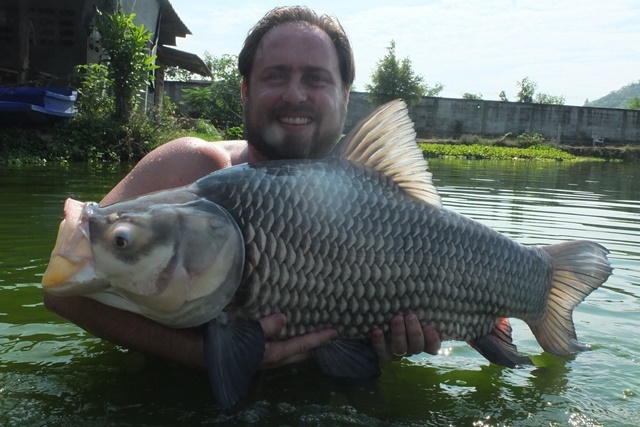 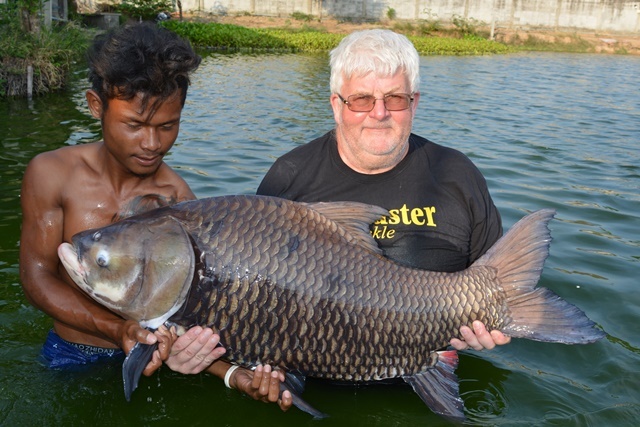 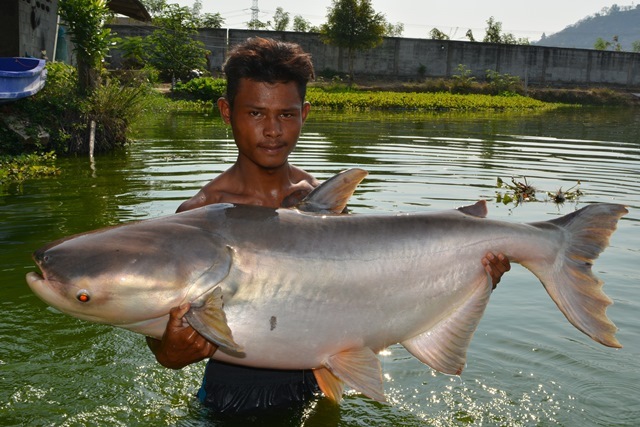 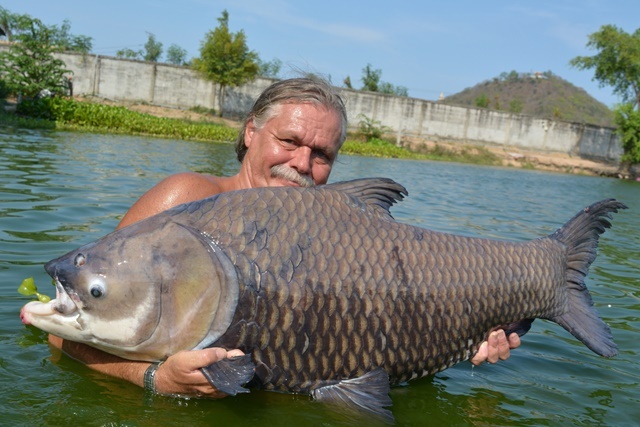 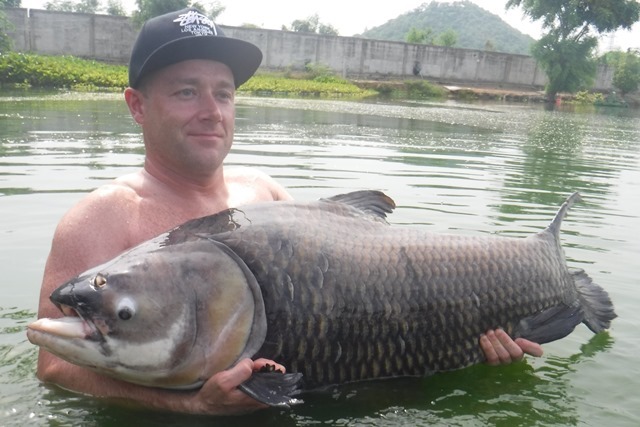 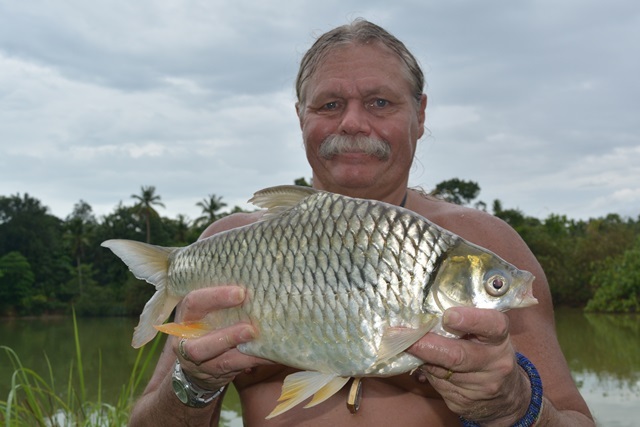 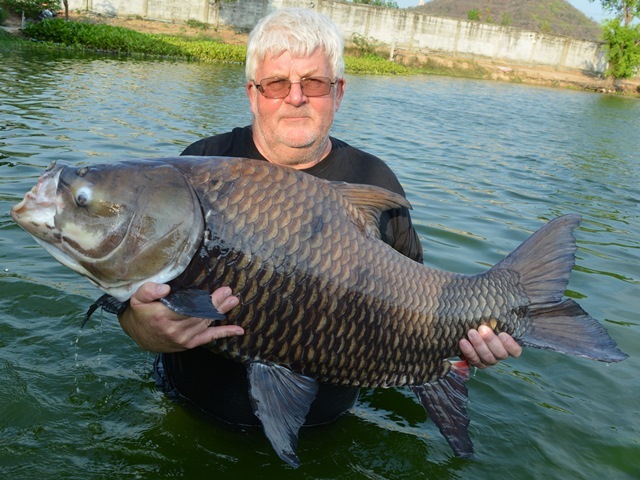 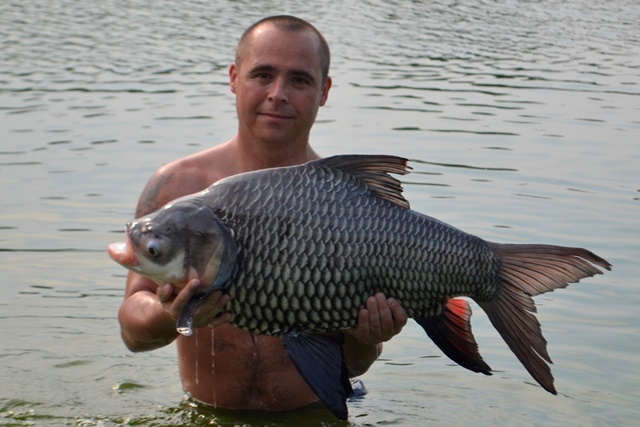 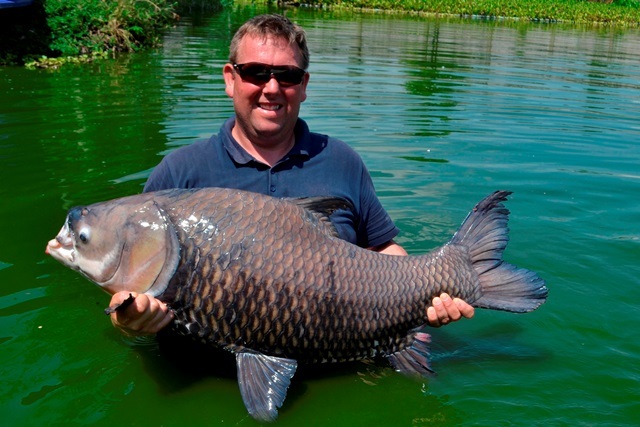 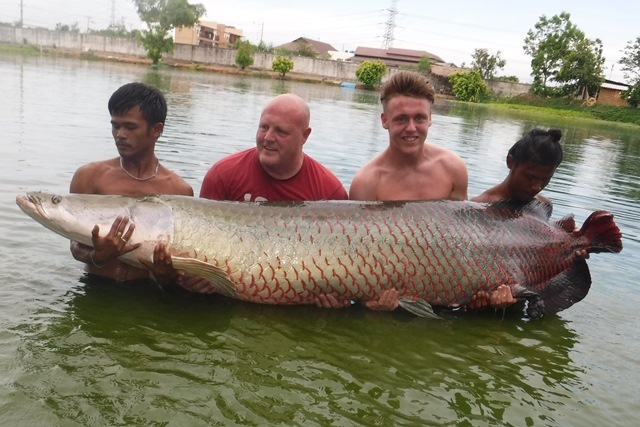 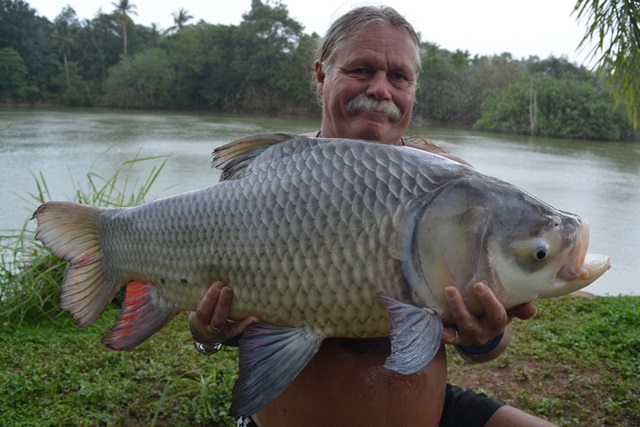 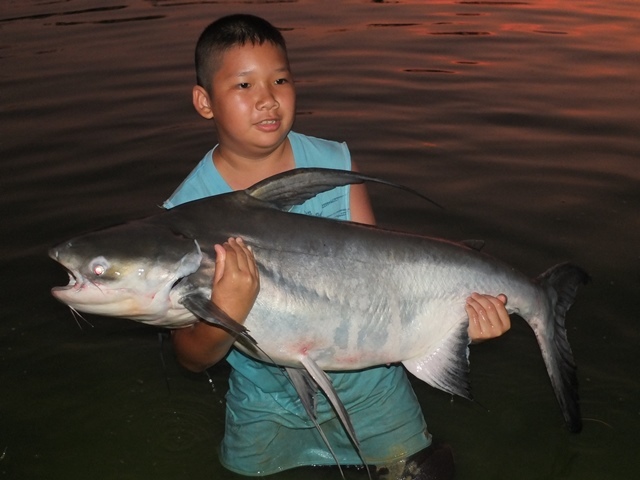 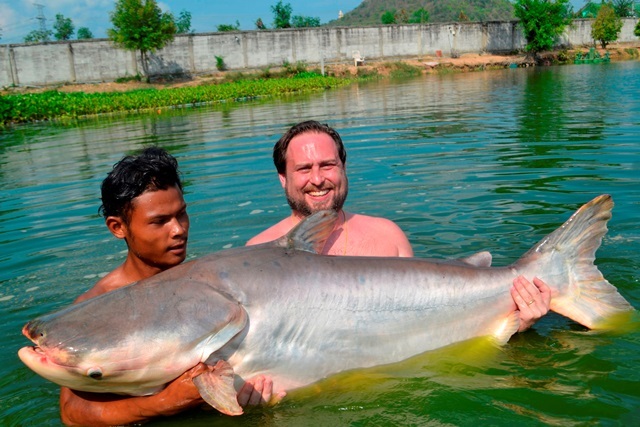 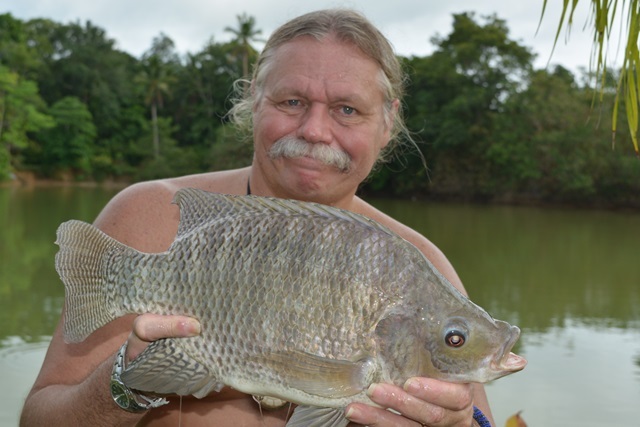 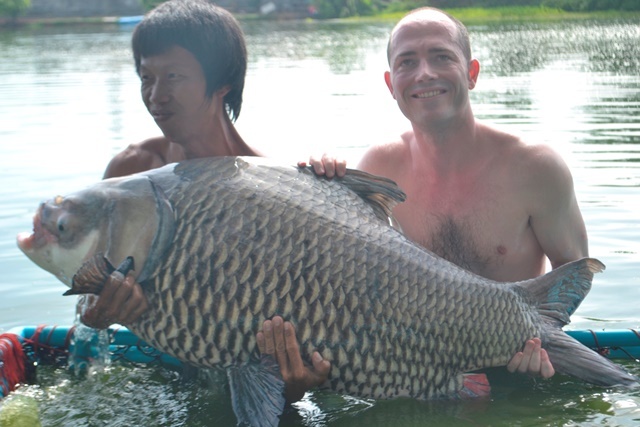 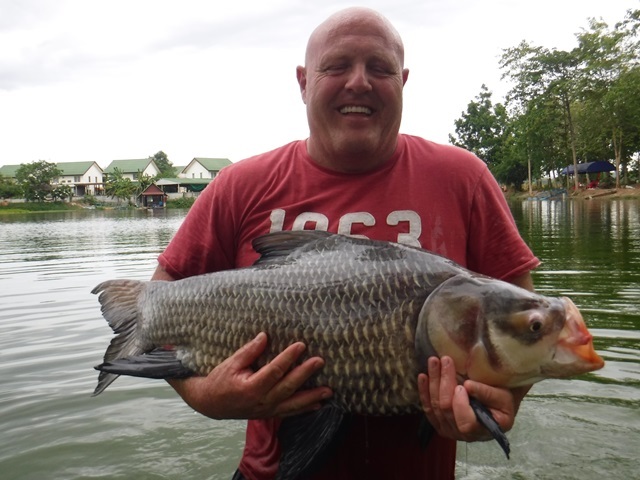 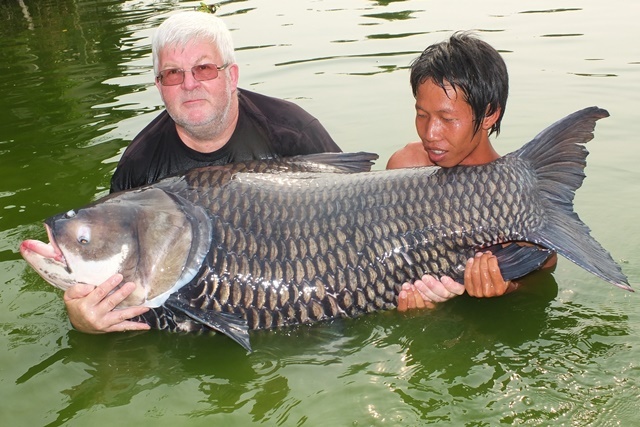 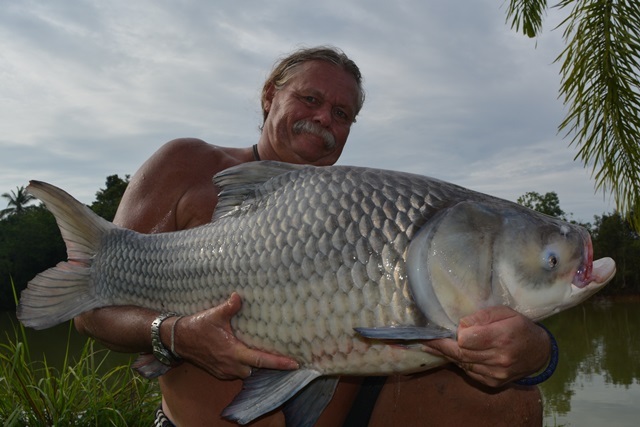 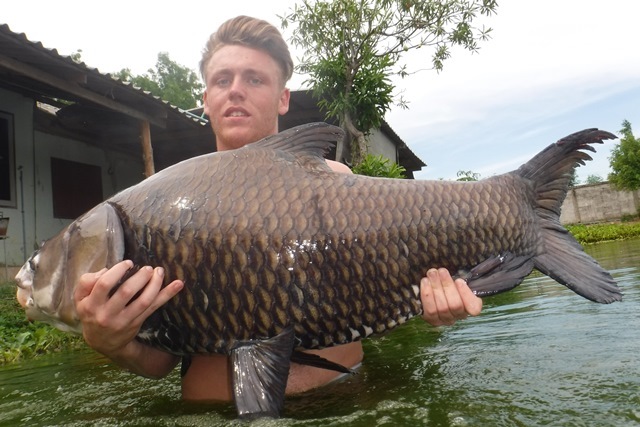 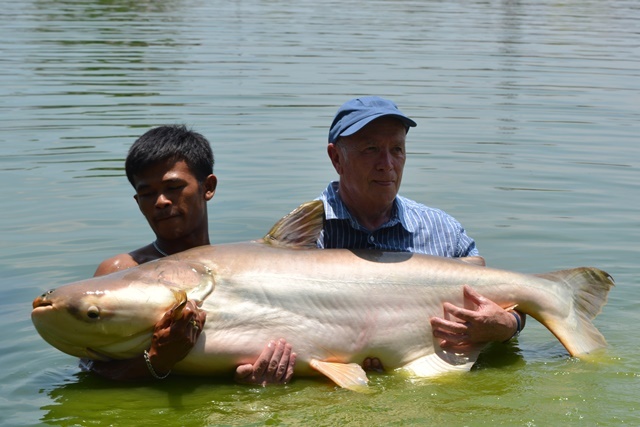 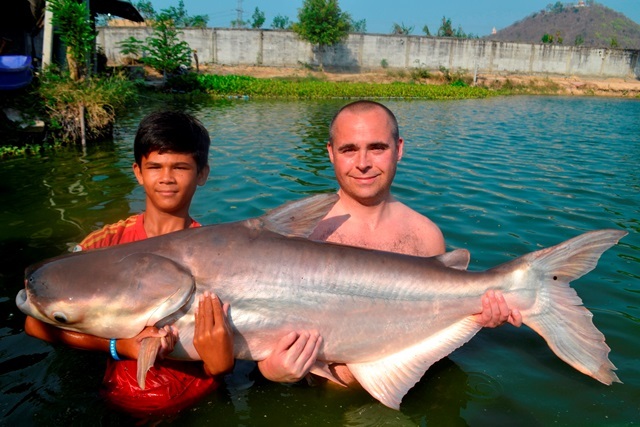 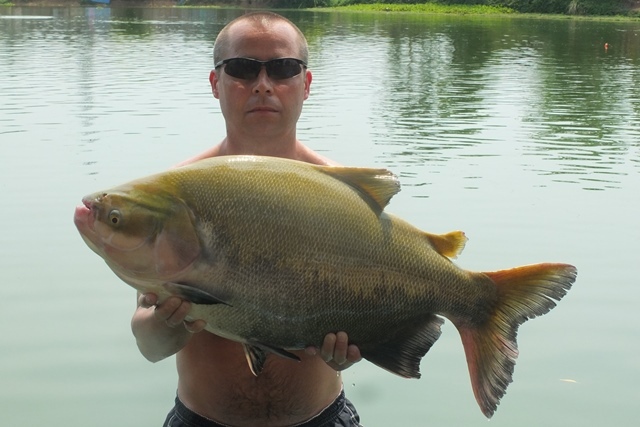 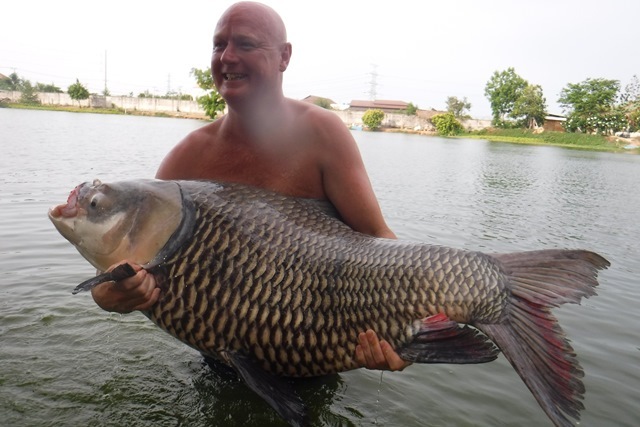 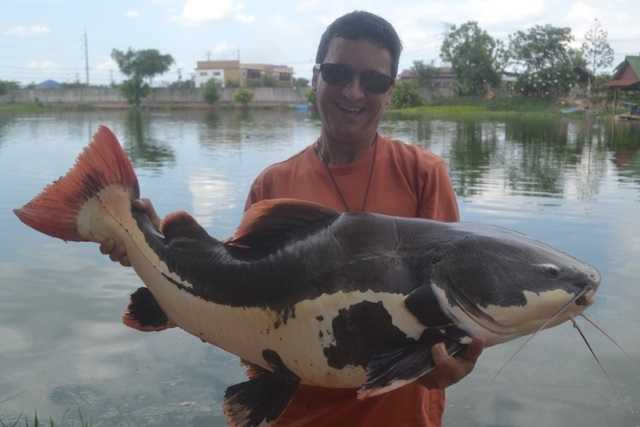 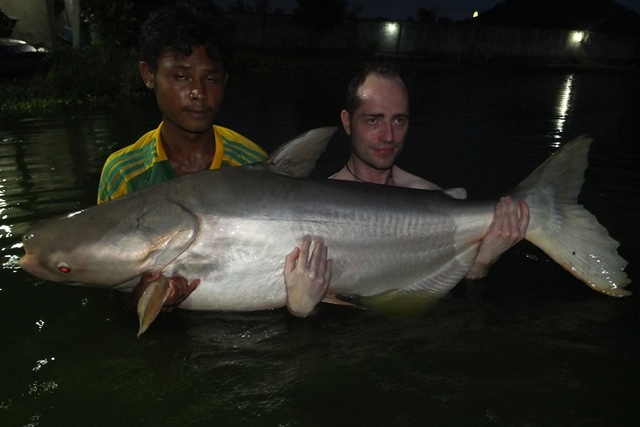 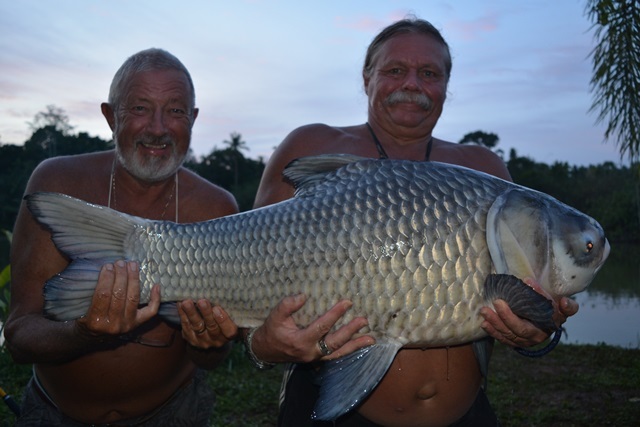 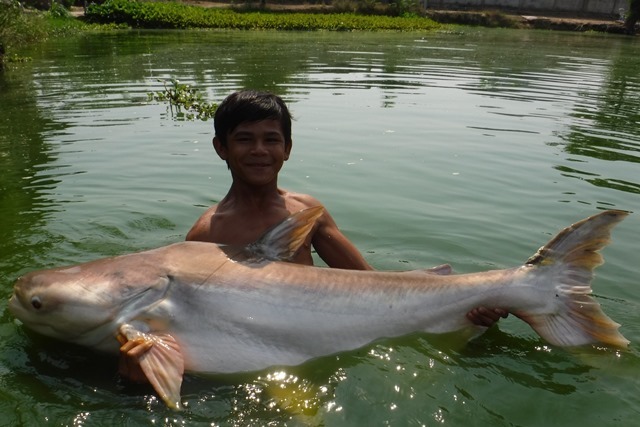 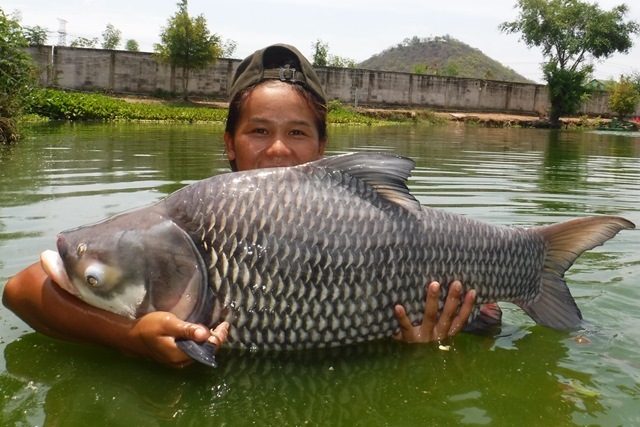 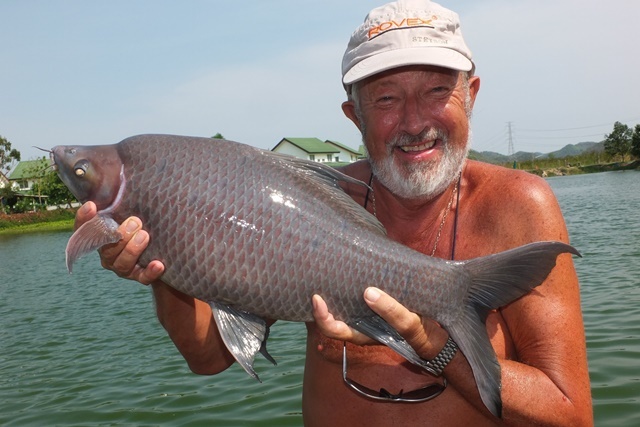 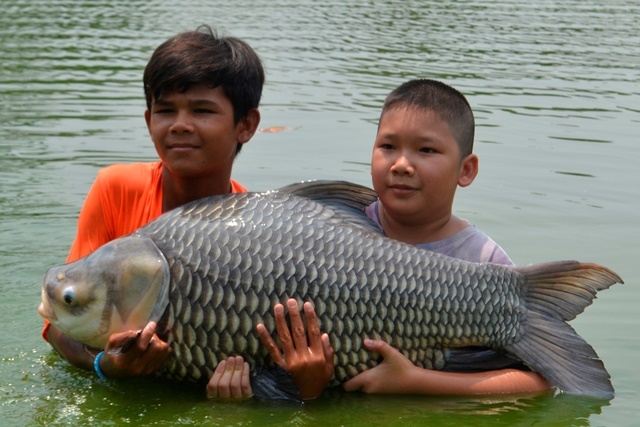 The pick of his catches being a 120lb Siamese carp and a huge vundu catfish. 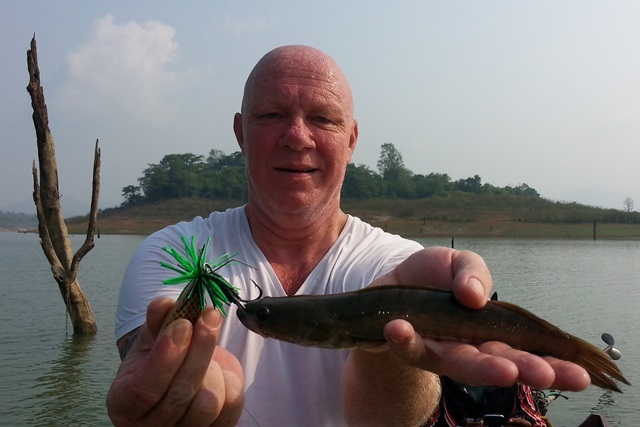 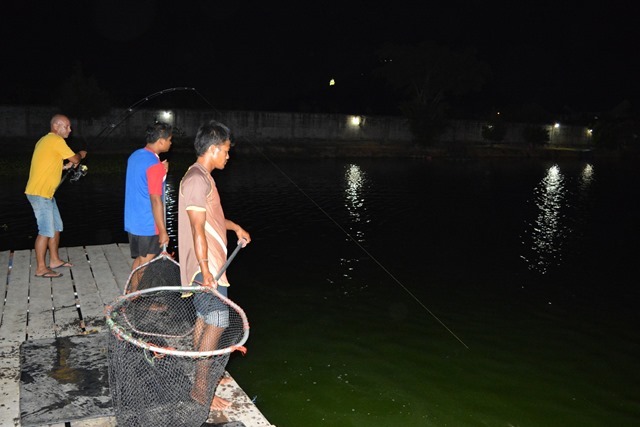 In addition he also caught Mekong catfish, Amazon redtail, arapaima, rohu and pacu. 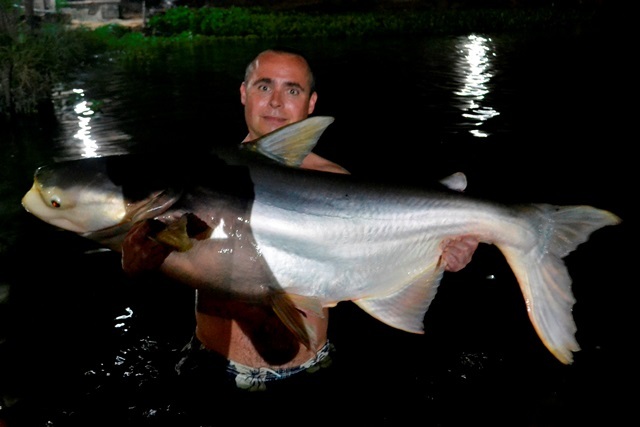 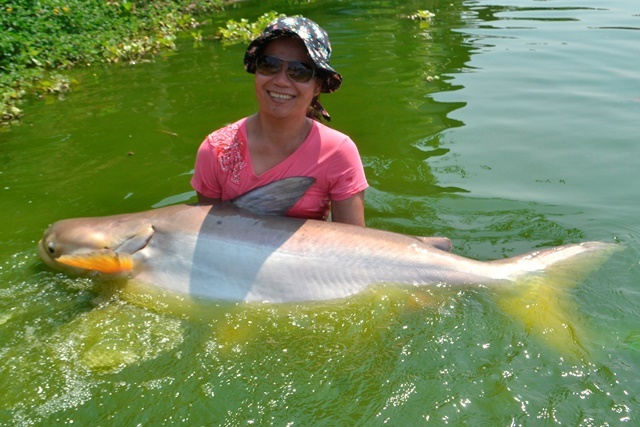 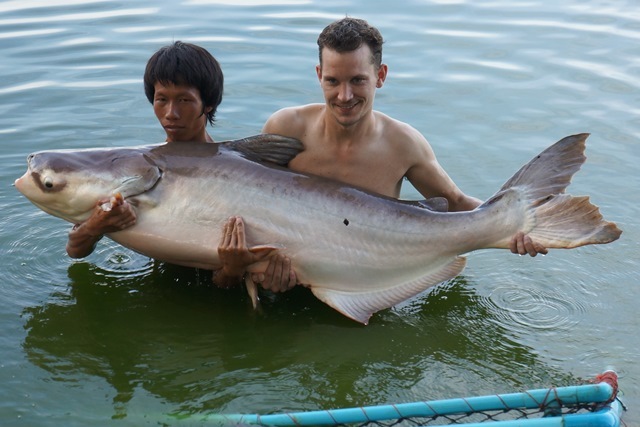 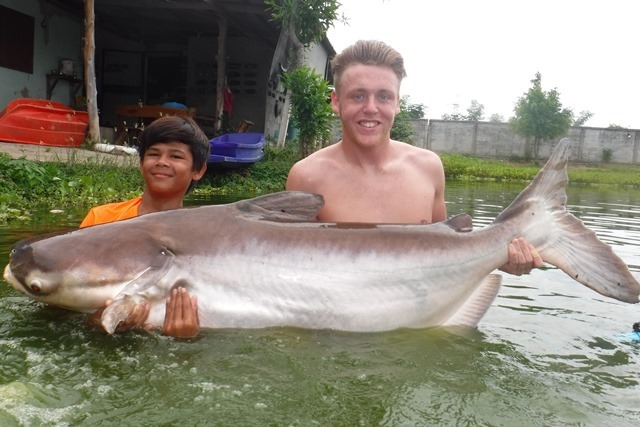 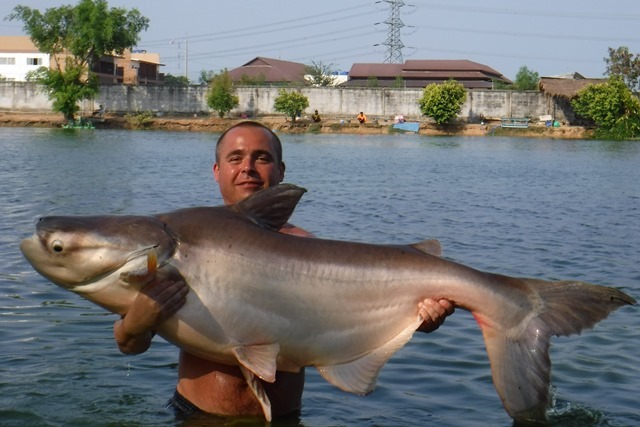 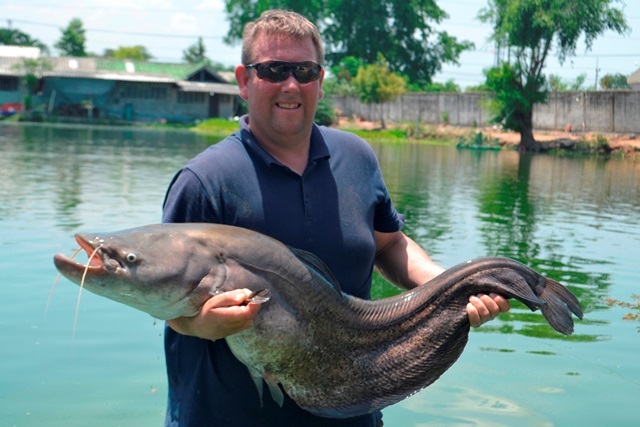 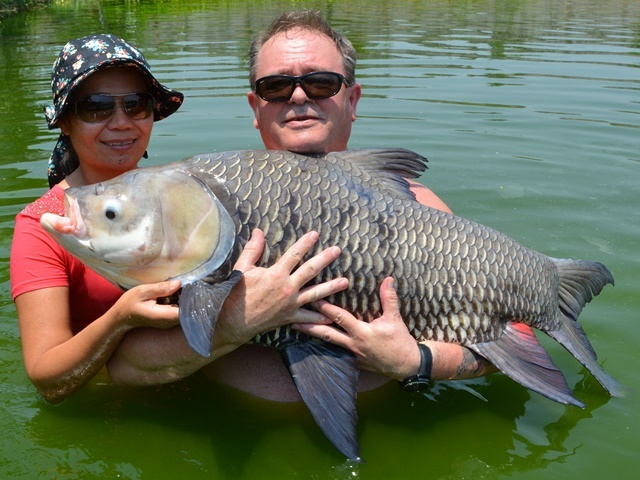 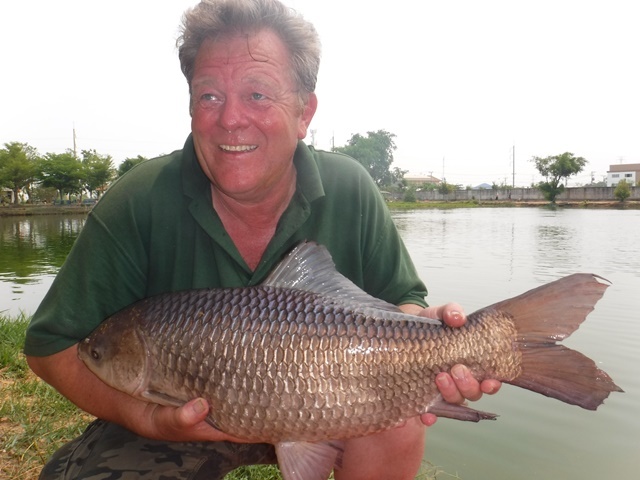 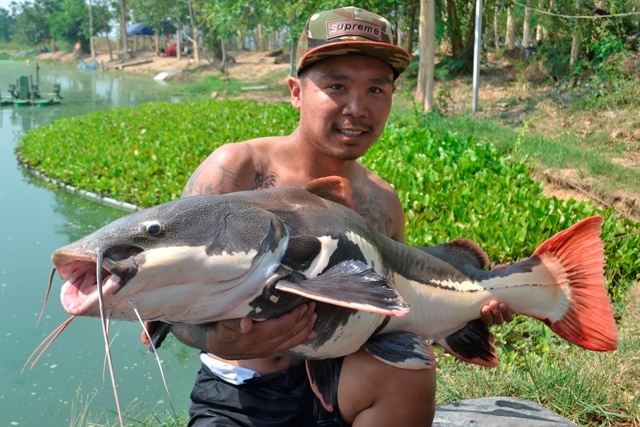 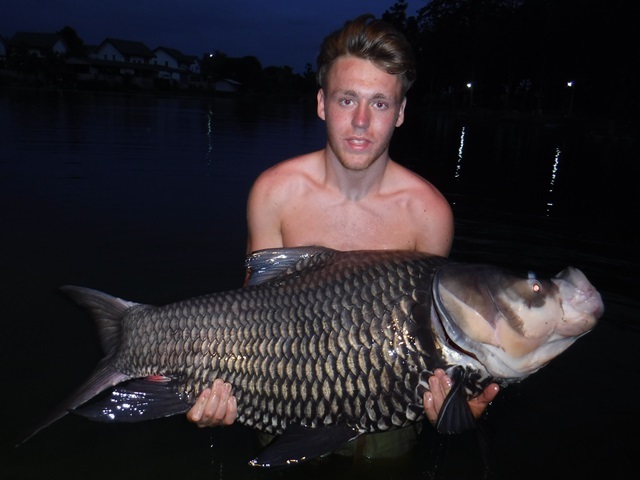 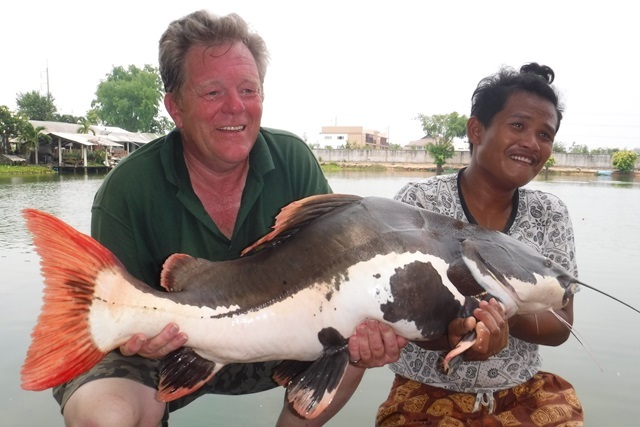 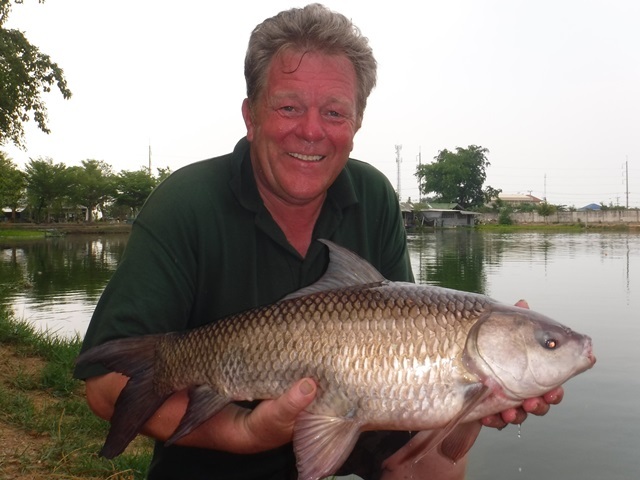 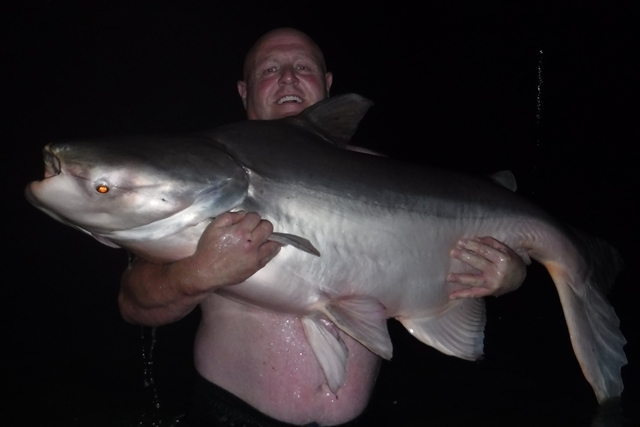 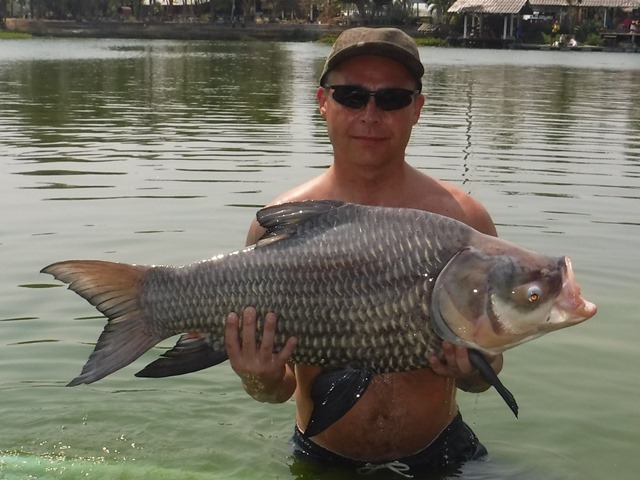 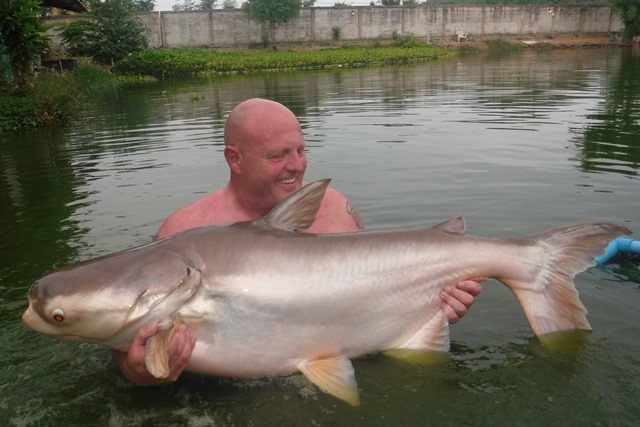 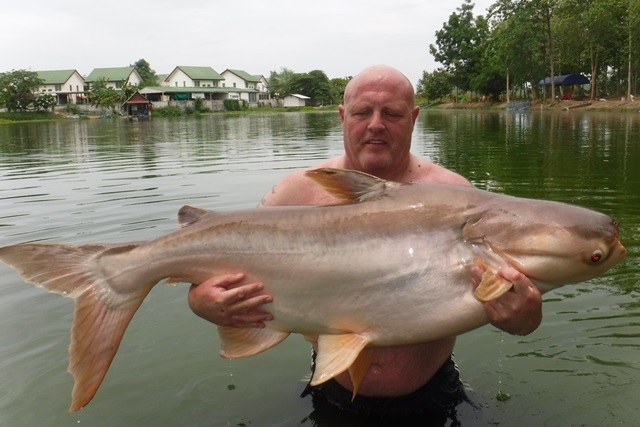 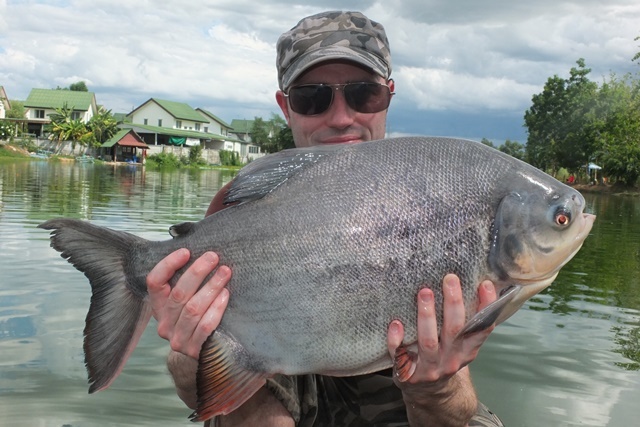 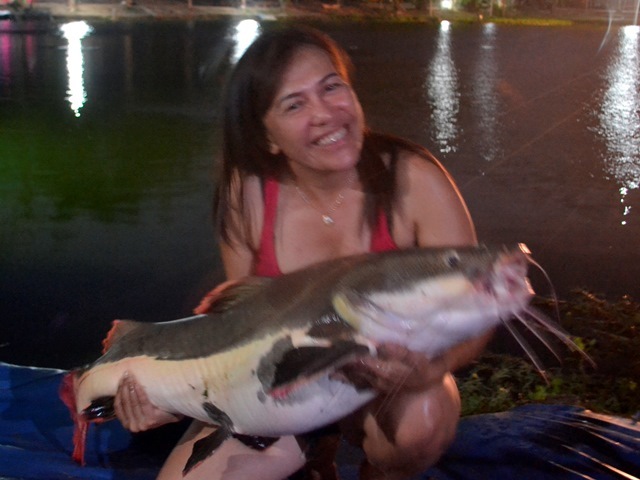 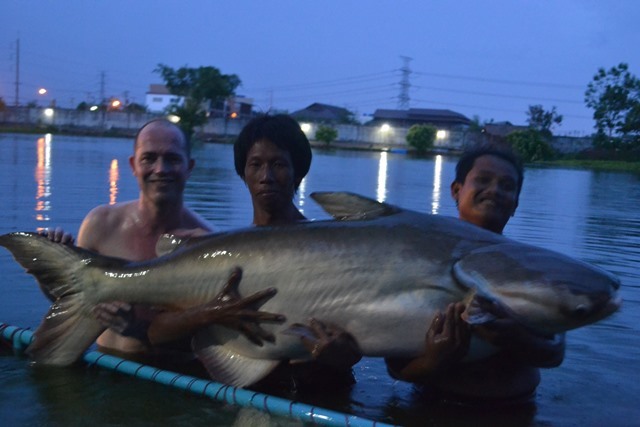 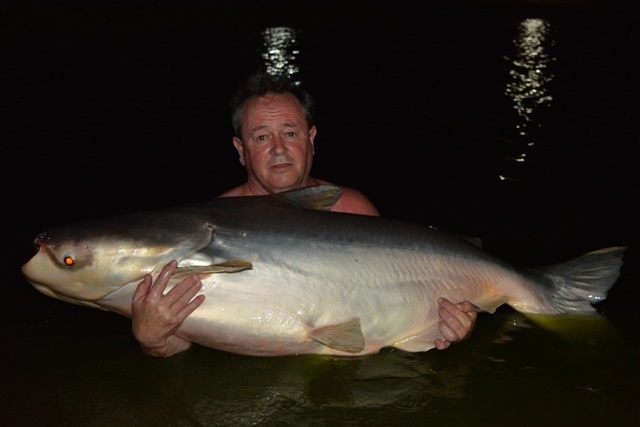 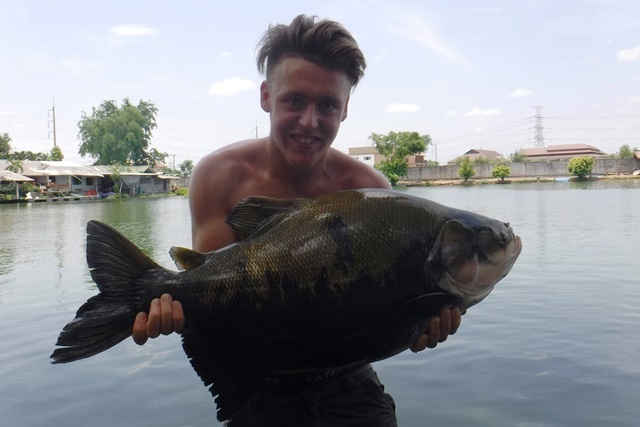 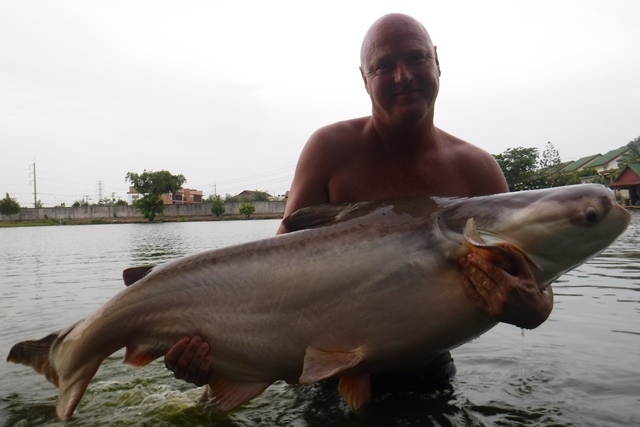 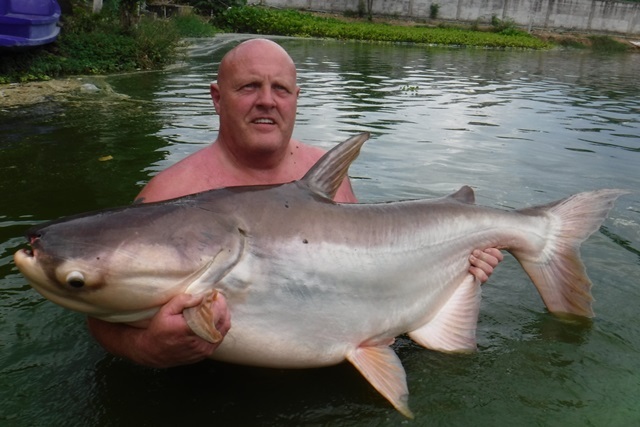 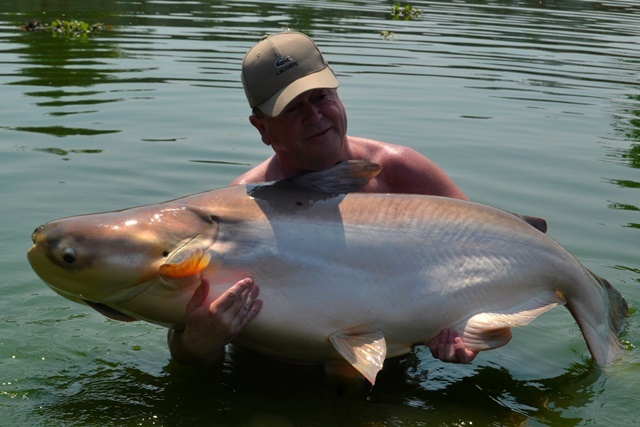 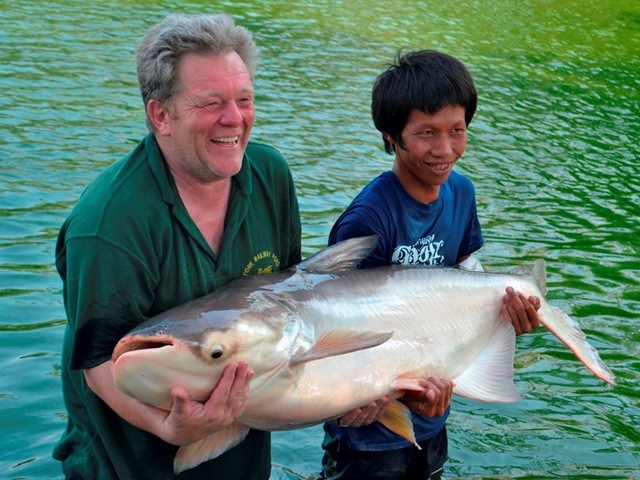 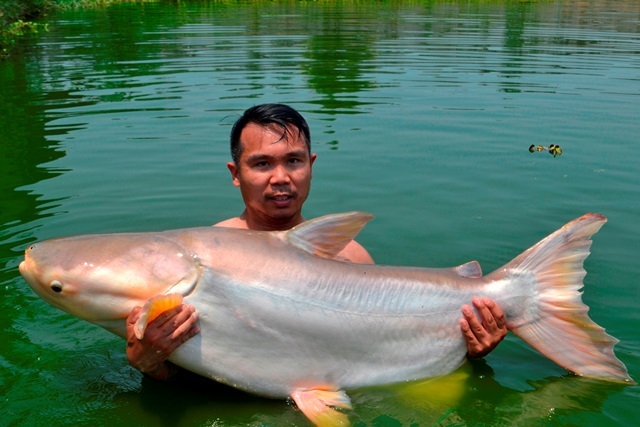 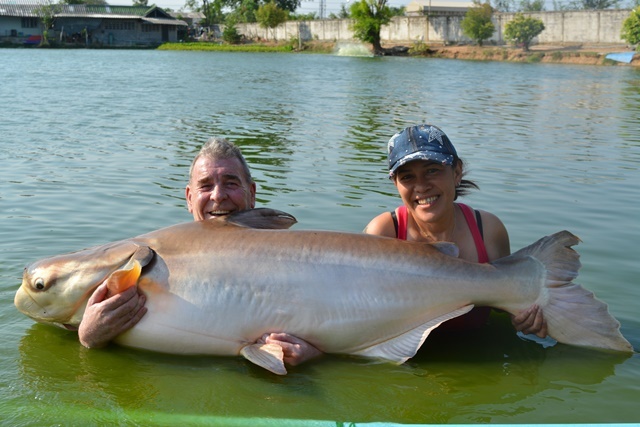 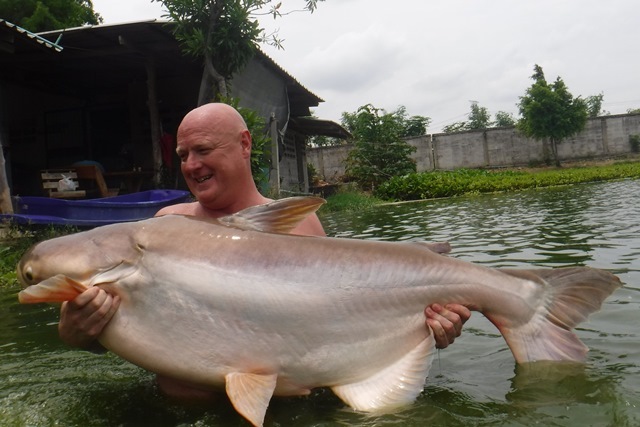 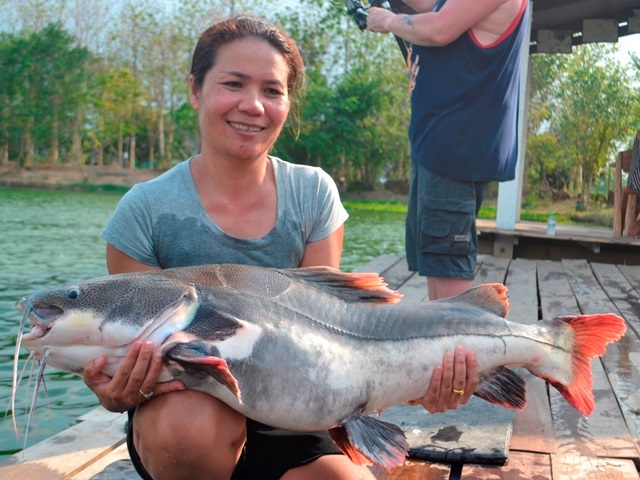 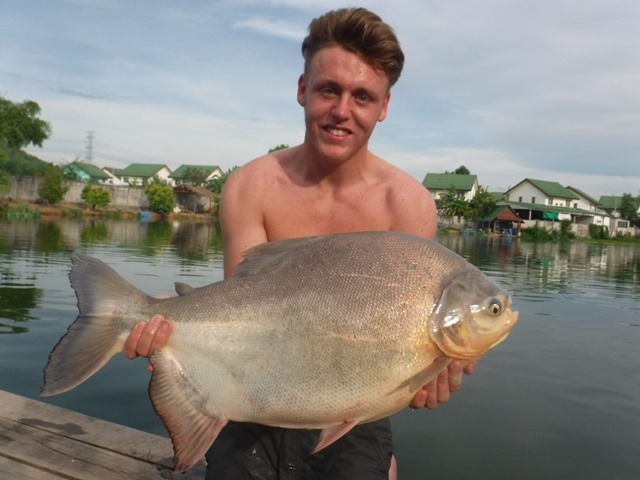 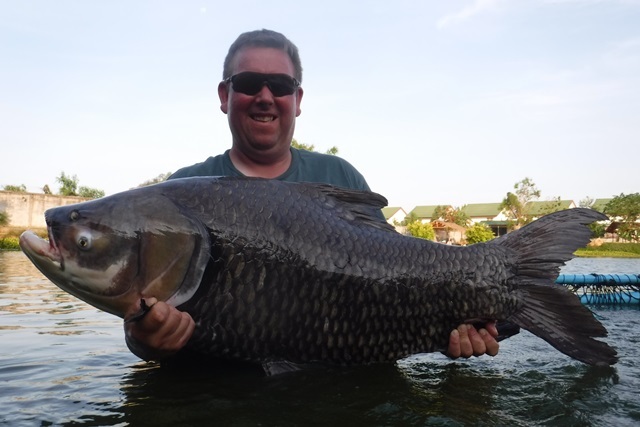 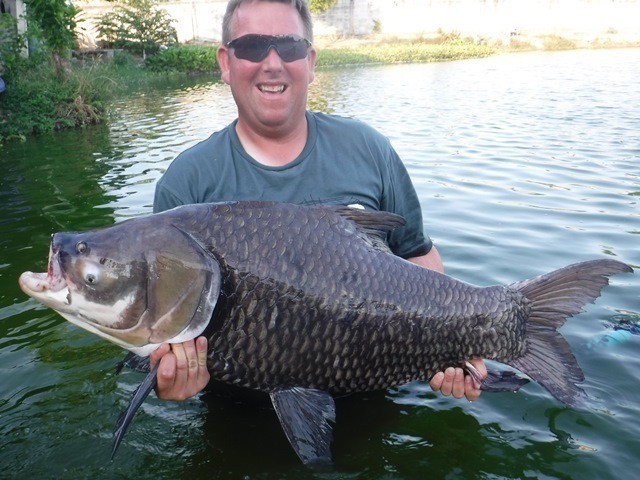 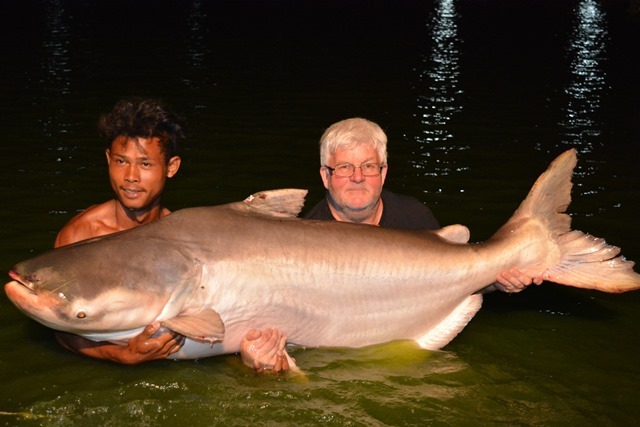 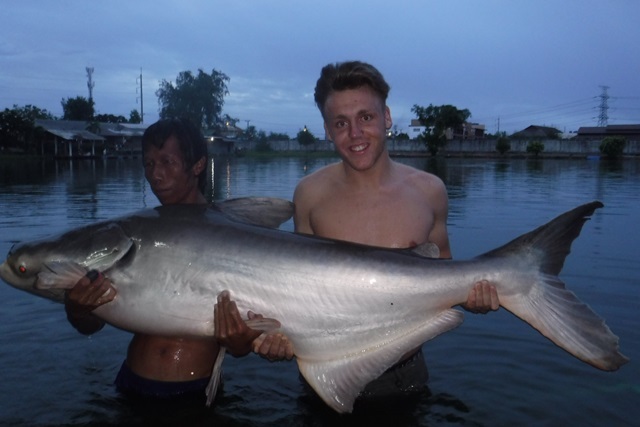 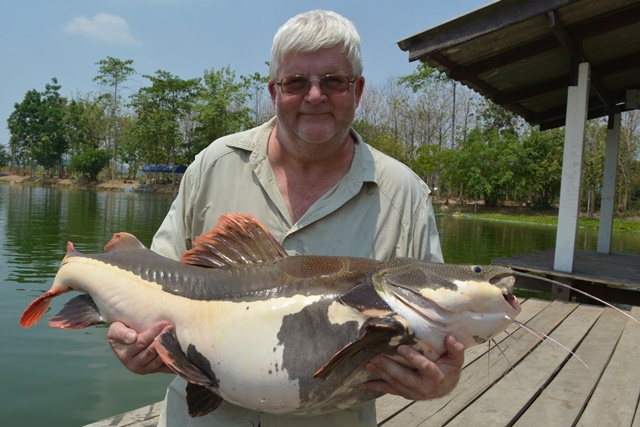 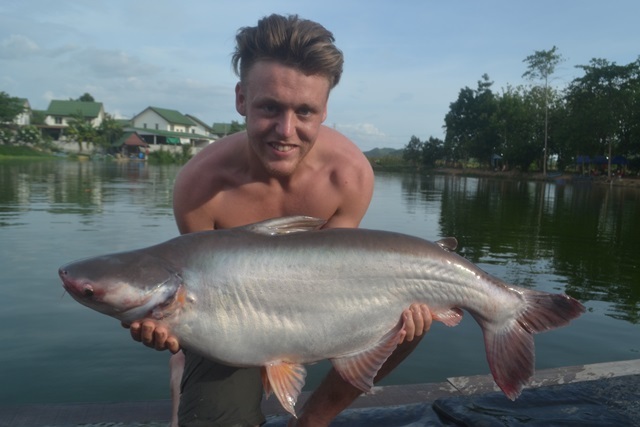 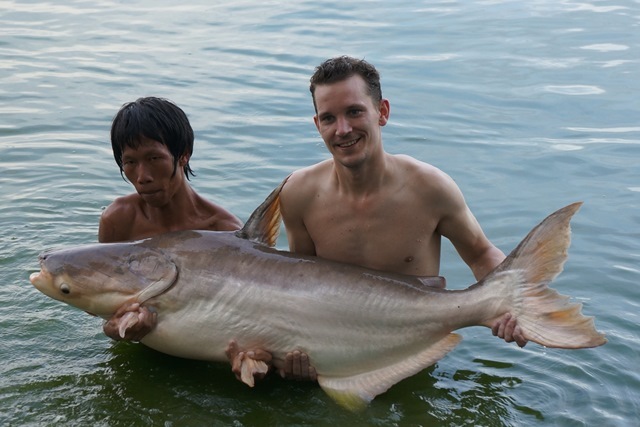 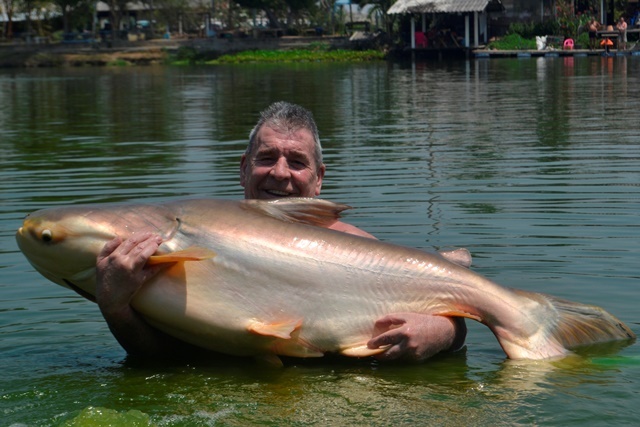 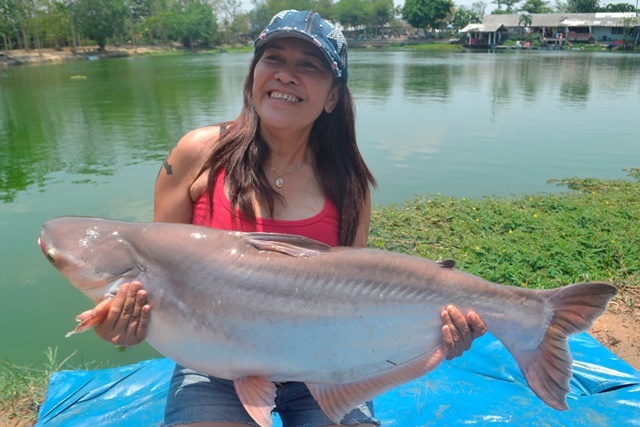 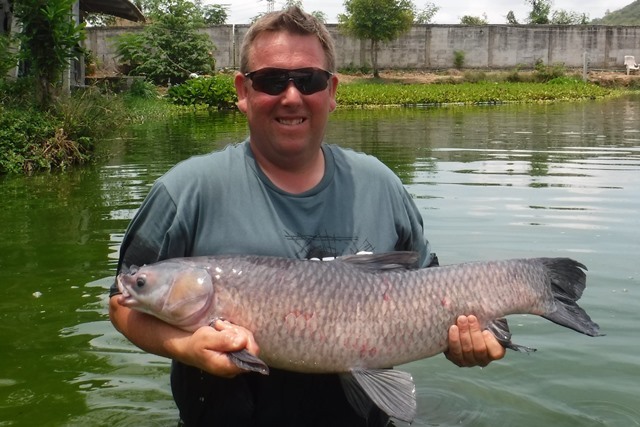 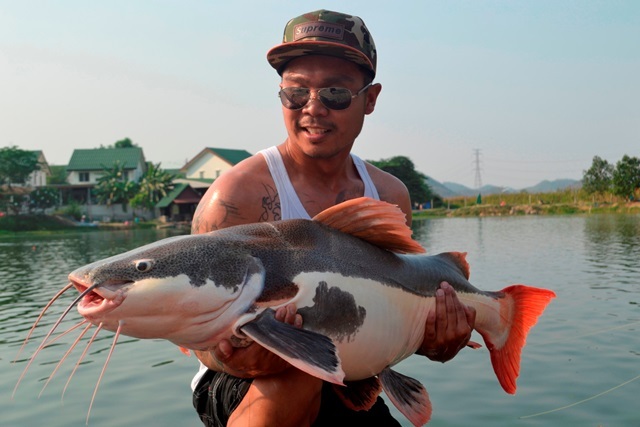 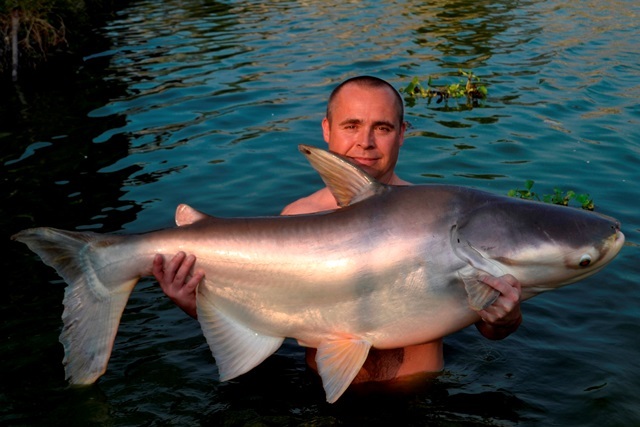 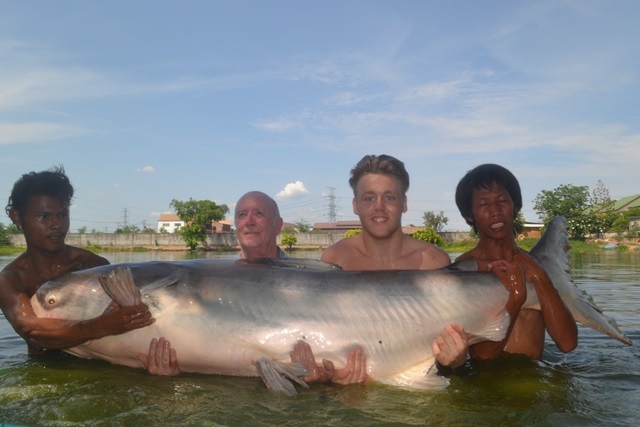 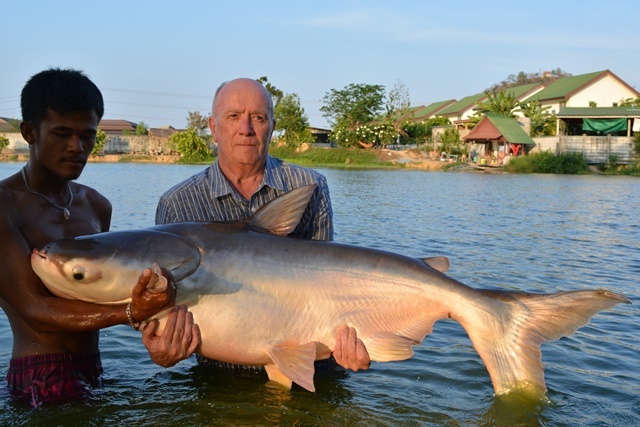 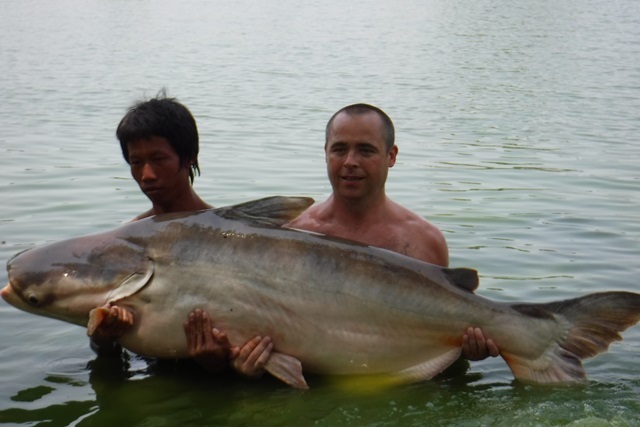 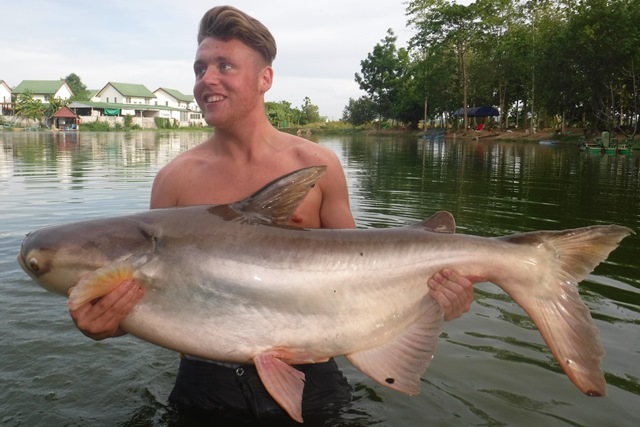 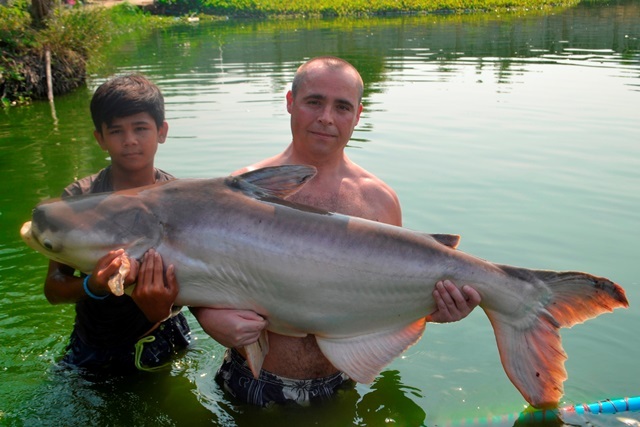 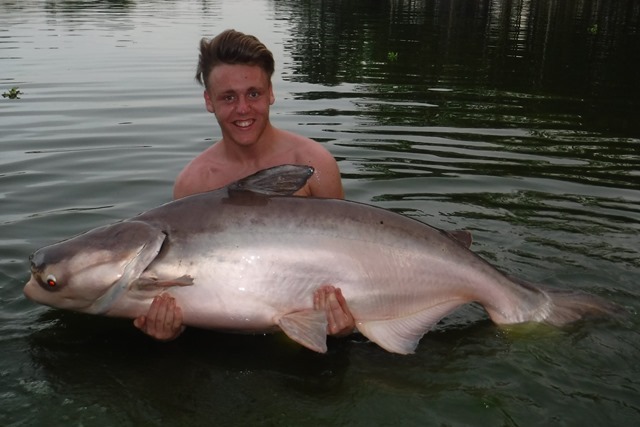 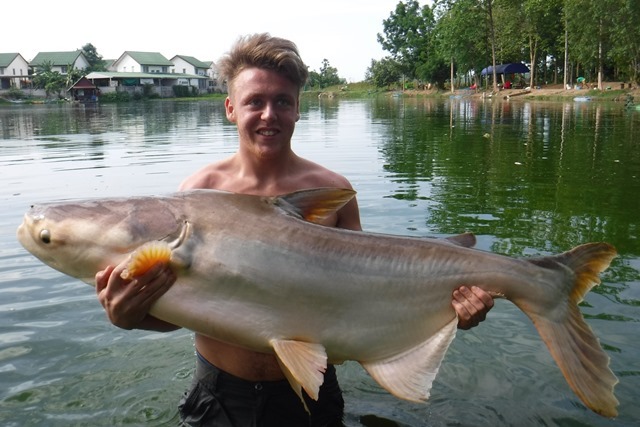 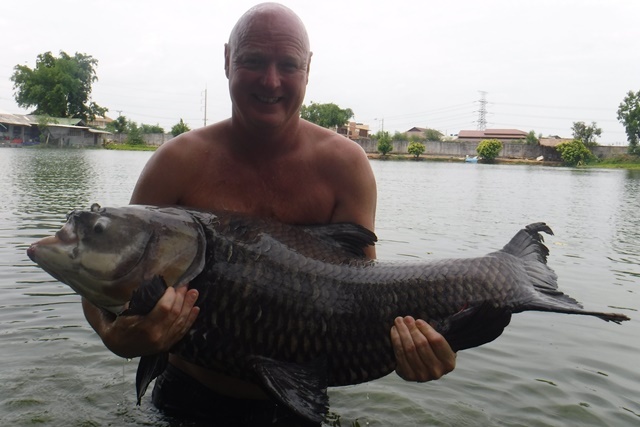 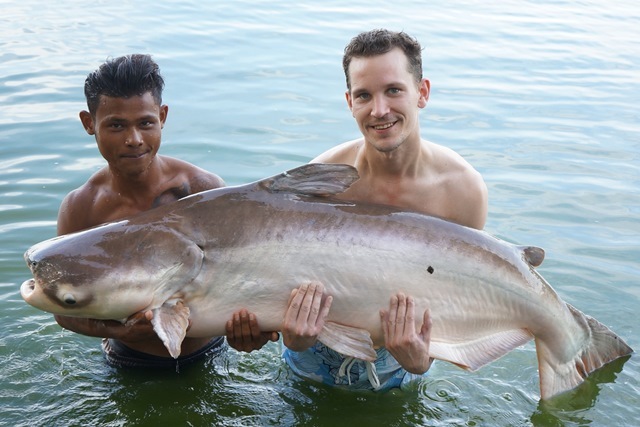 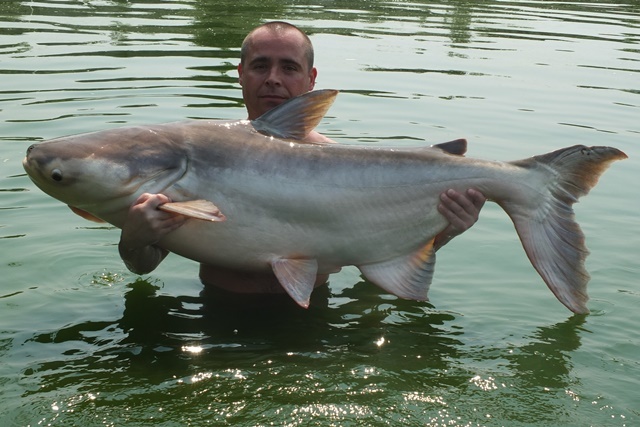 Tap of Bangkok Fishing Guide Service customer from his second visit of the month caught two absolute stunners firstly a colossal Chinese bighead carp and this was followed by an awesome big-Y catfish. 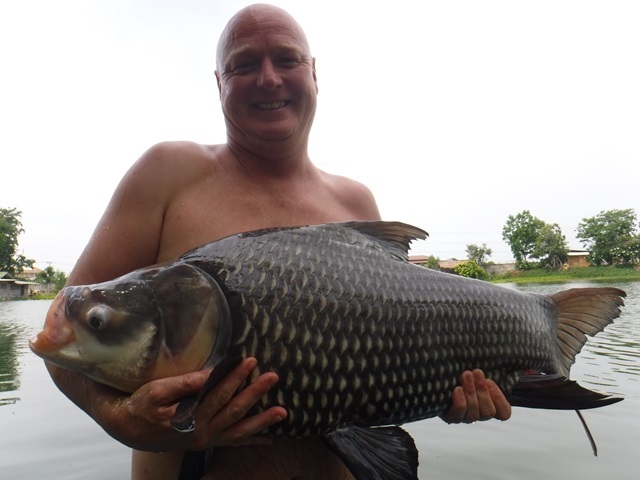 He also caught Amazon redtail, rohu and Siamese carp. 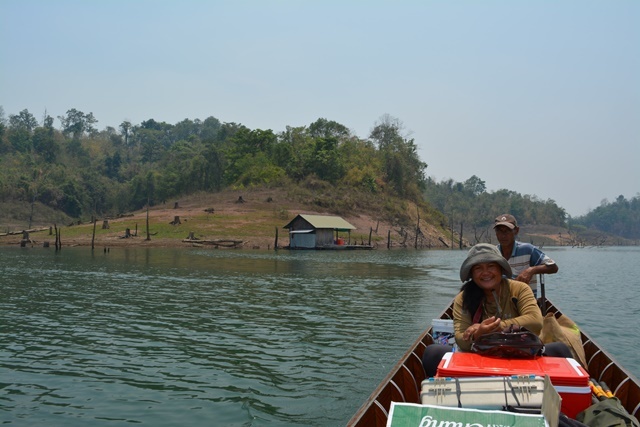 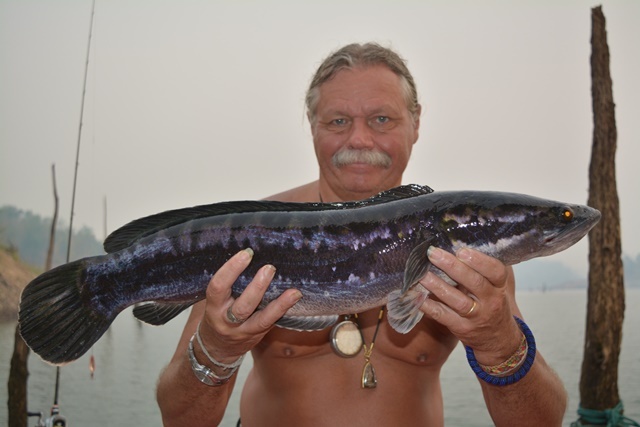 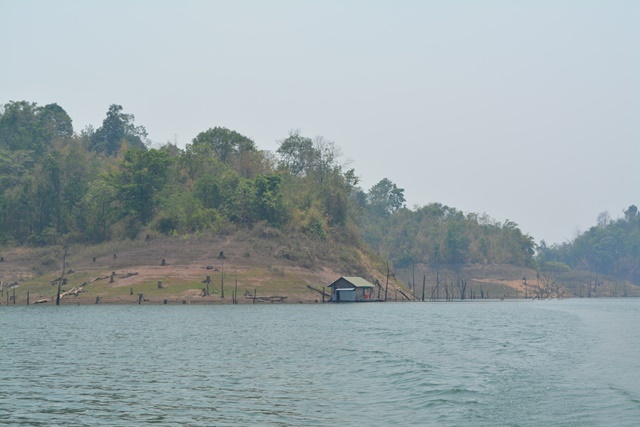 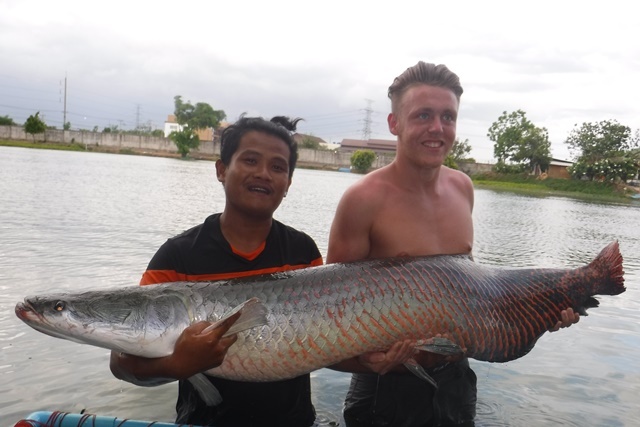 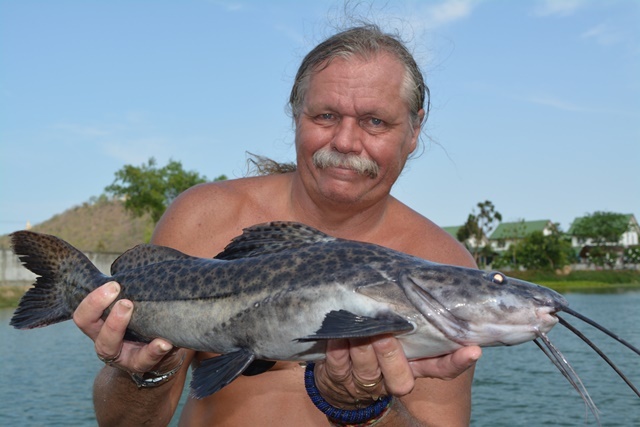 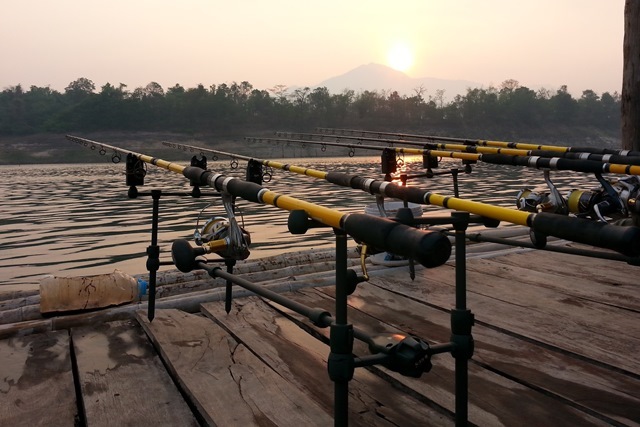 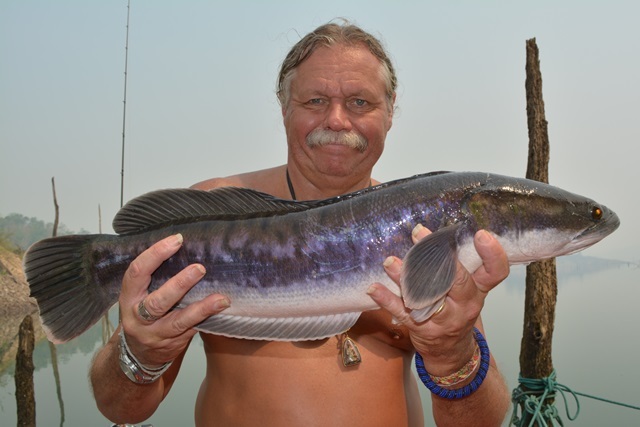 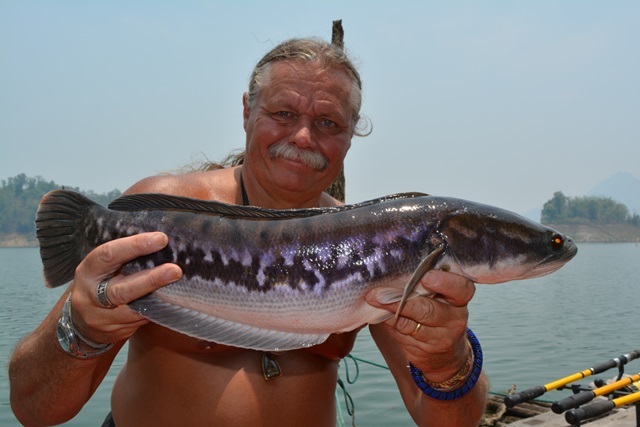 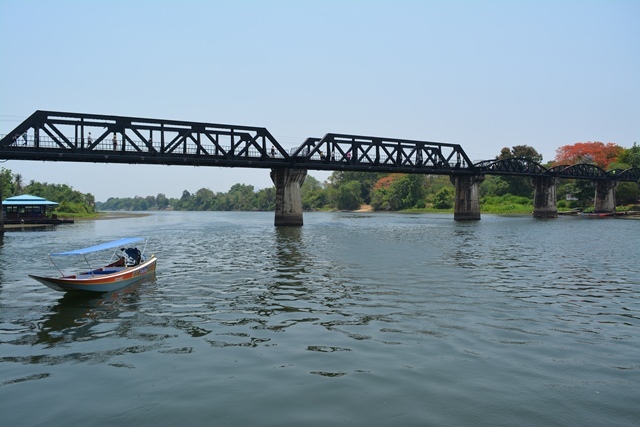 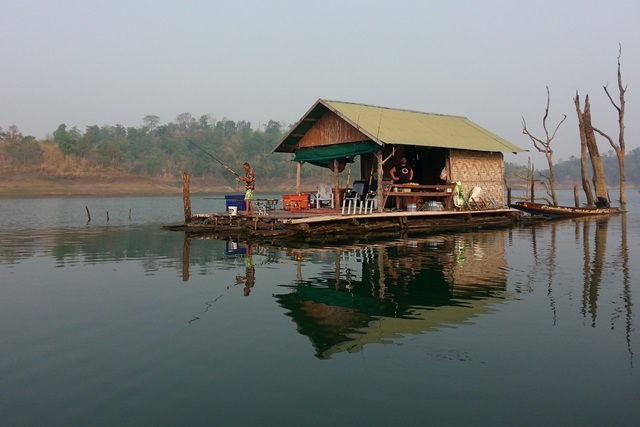 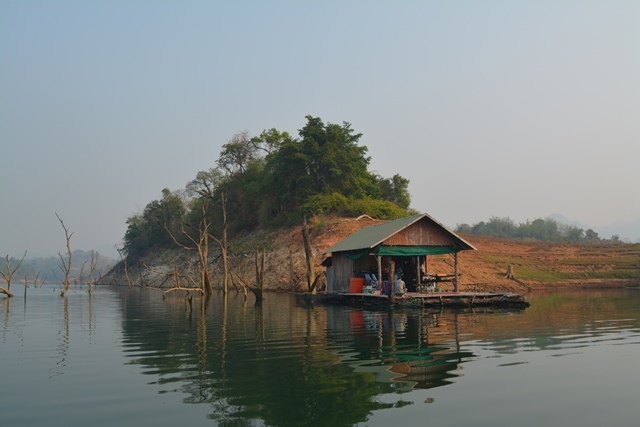 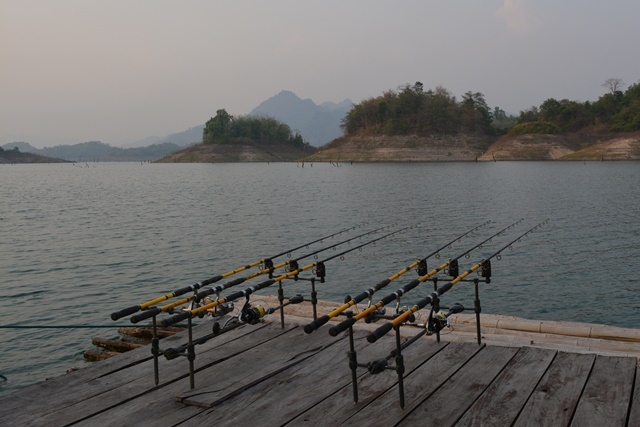 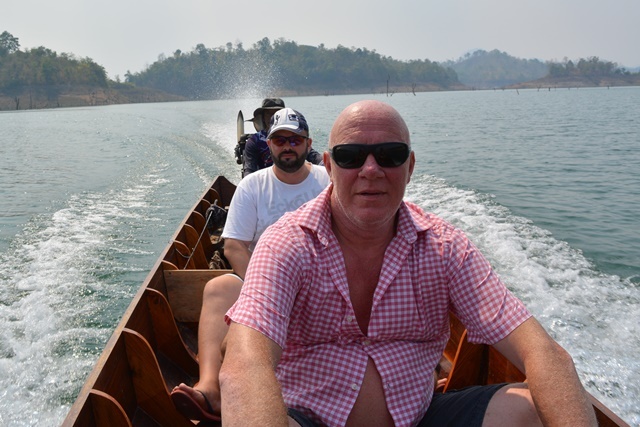 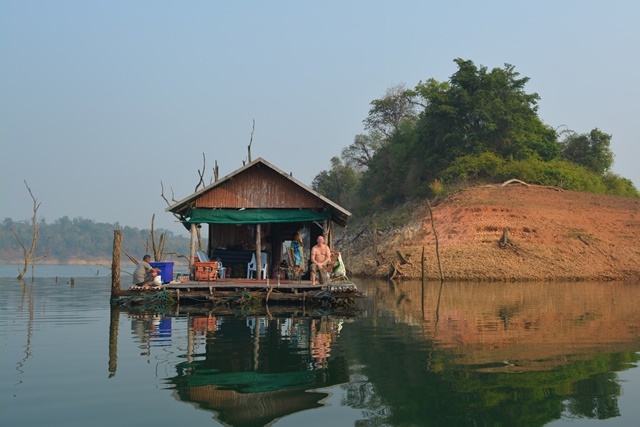 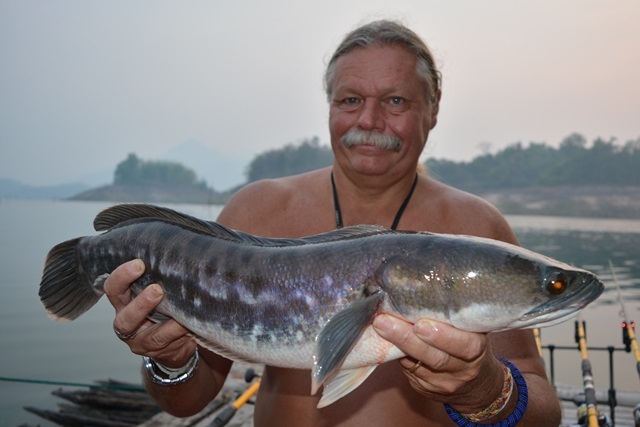 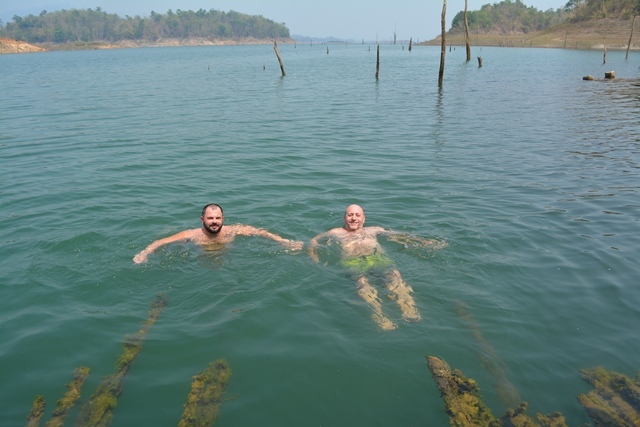 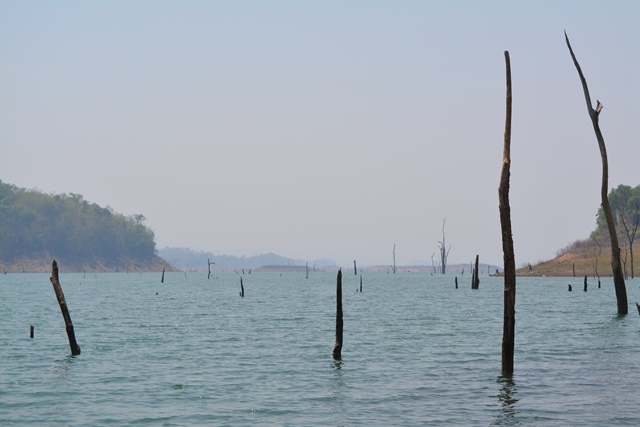 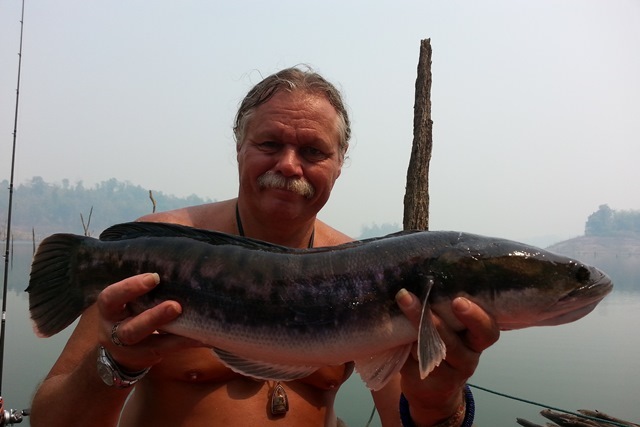 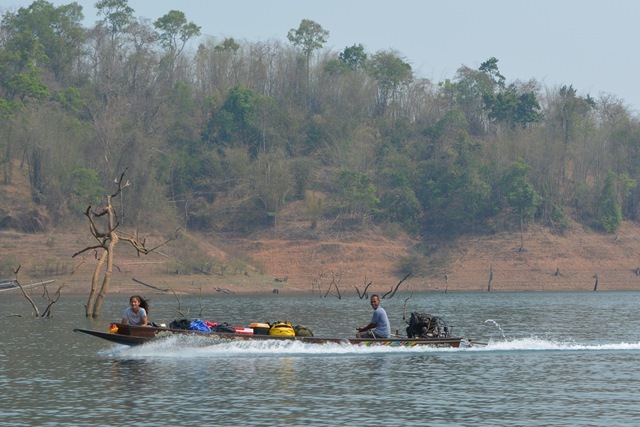 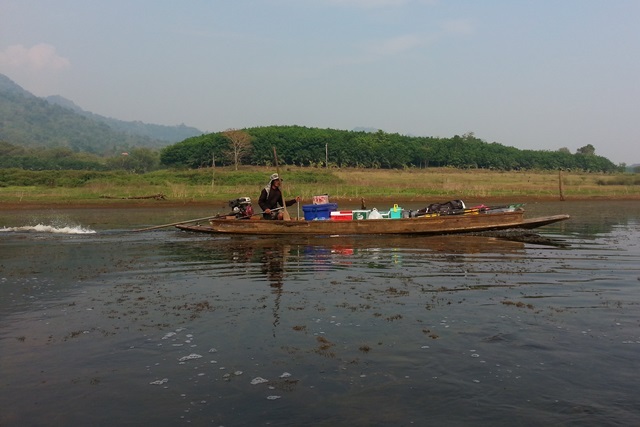 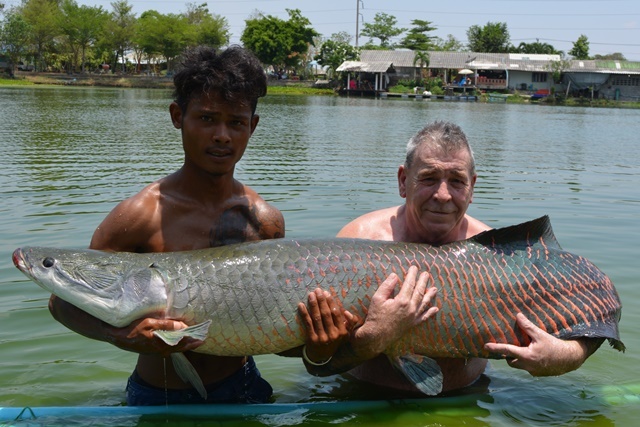 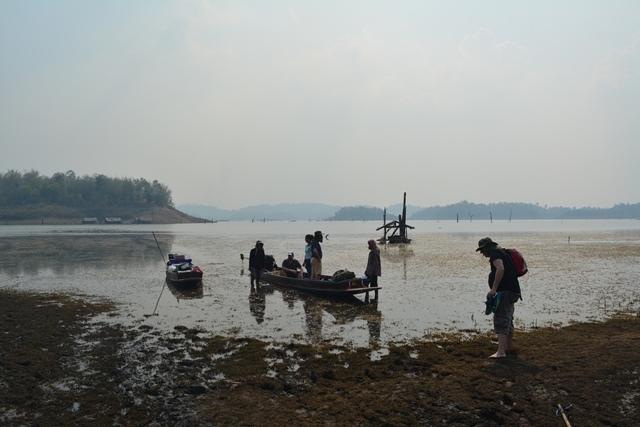 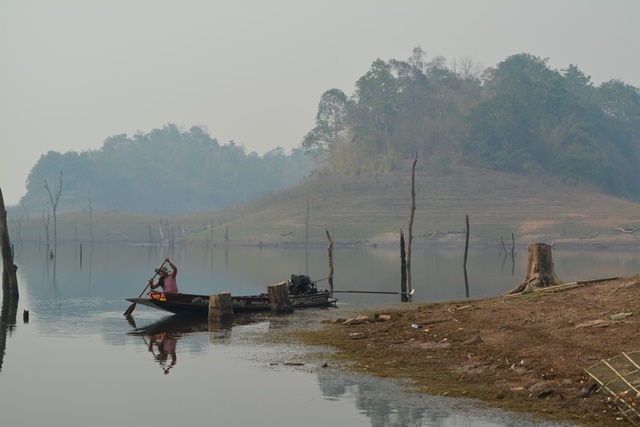 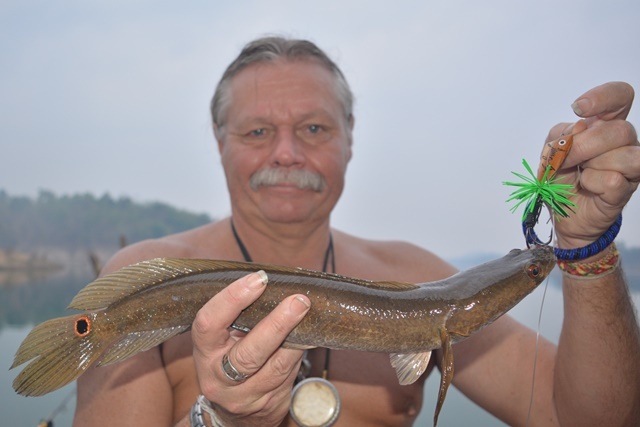 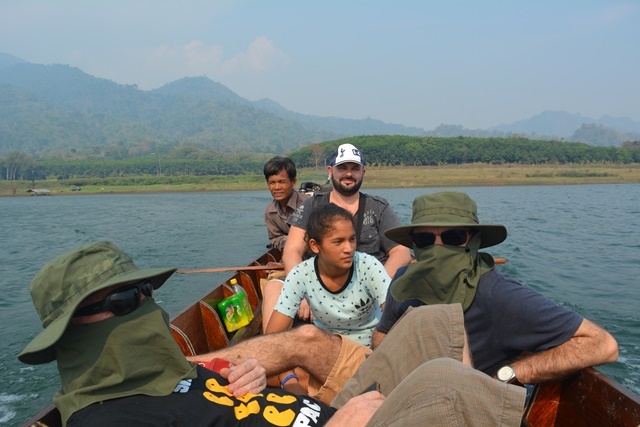 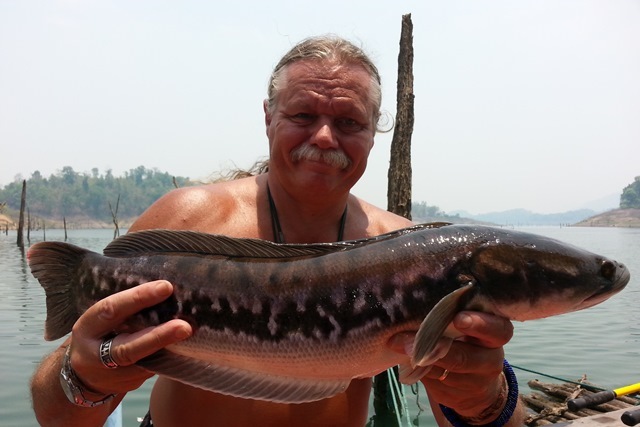 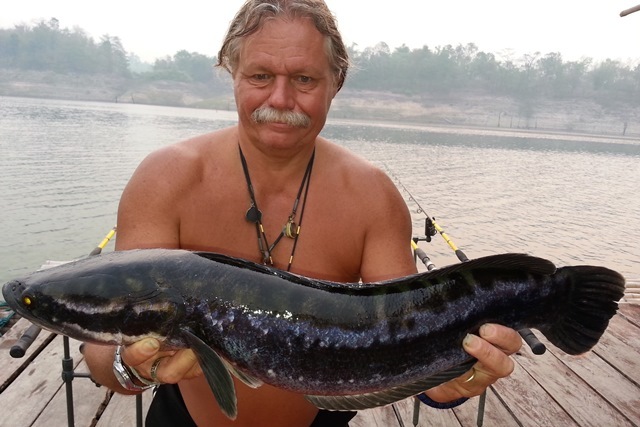 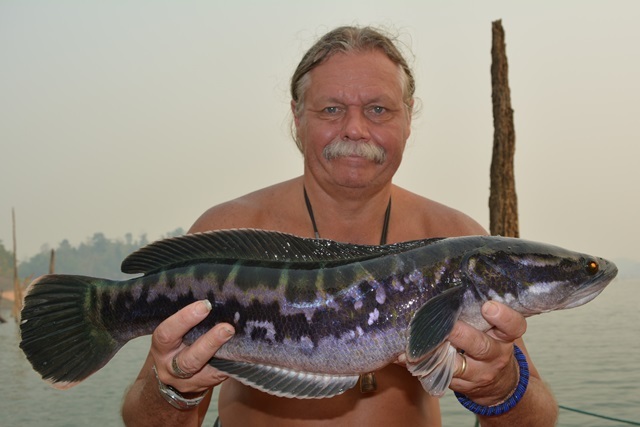 Gavin Rodgers and his two fishing buddies Gary Smock and Chris Wilson went out into the wilds of Khao Laem Dam chasing snakehead and wallago. 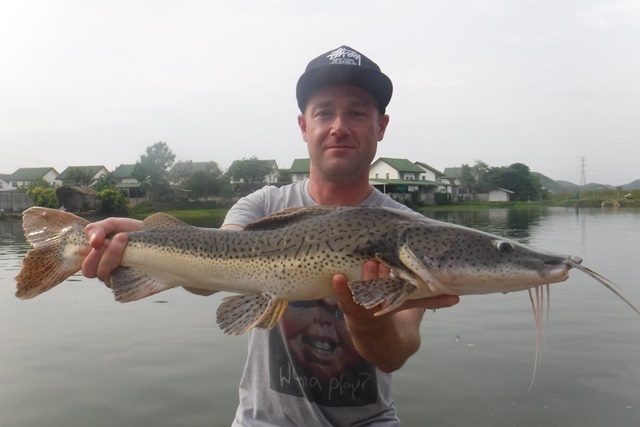 Unfortunately due to the very hot conditions they just weren't having the bottom baits and the couple of fish that were hooked were lost in the submerged trees. 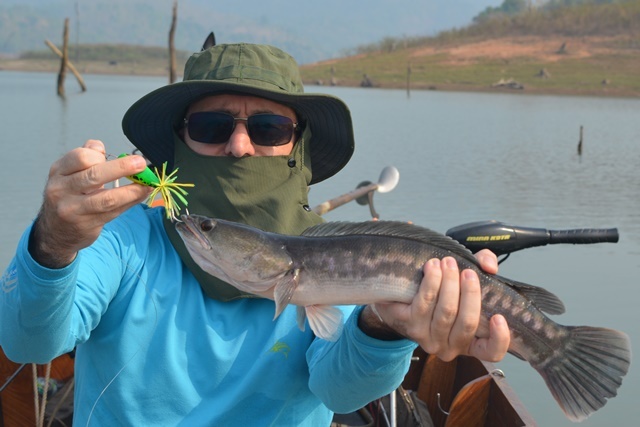 They did manage to catch a few small striped snakehead and giant snakehead on lures but even the usually obliging jungle perch didn't want to know. 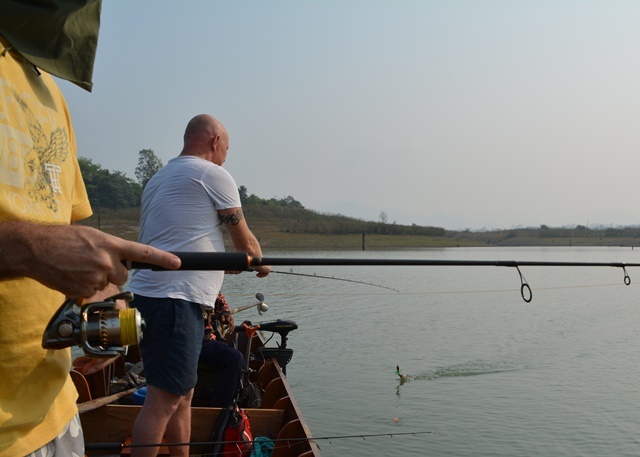 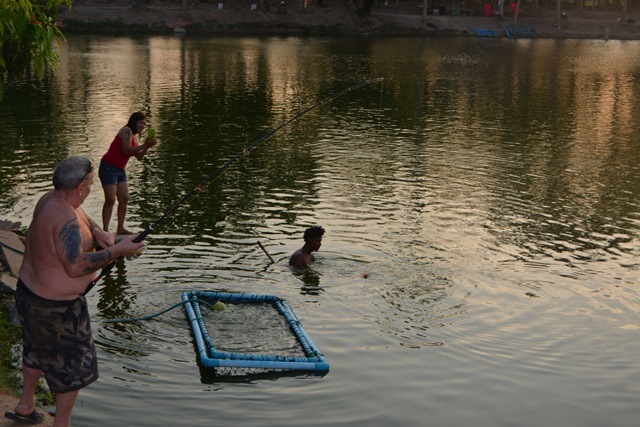 However, they didn't seem to put off as they vowed to be back to the dam later in the year to try their hand at carp fishing. 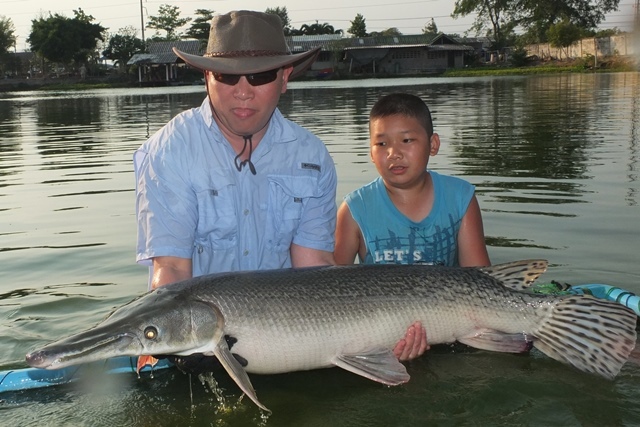 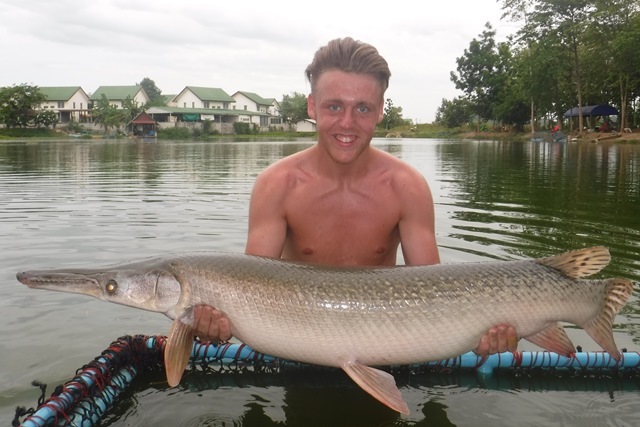 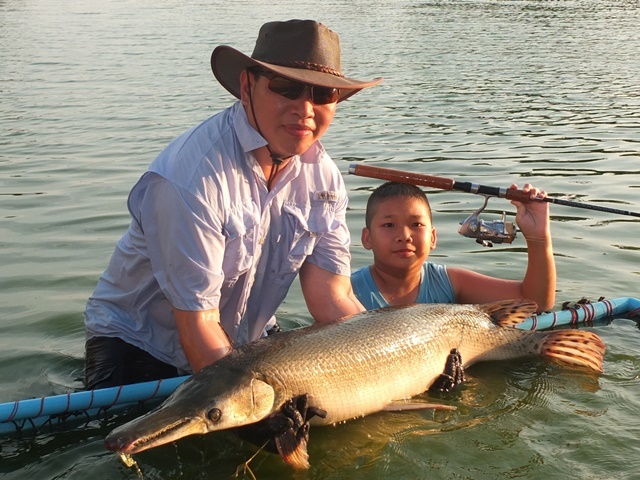 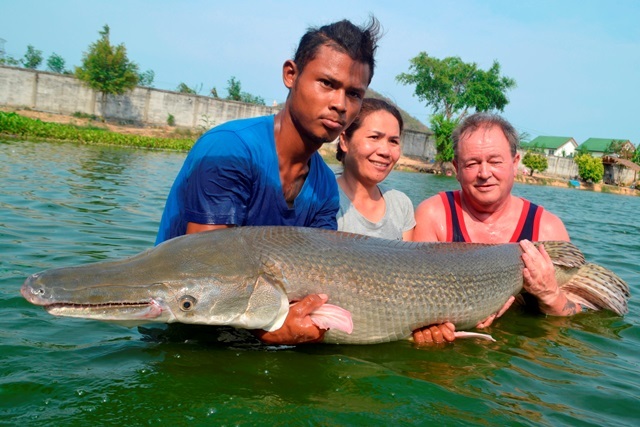 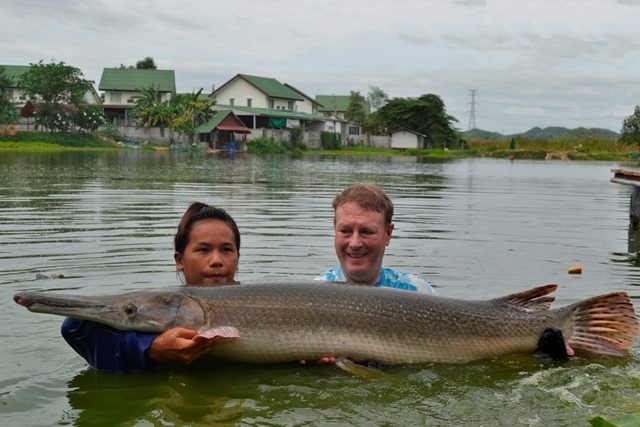 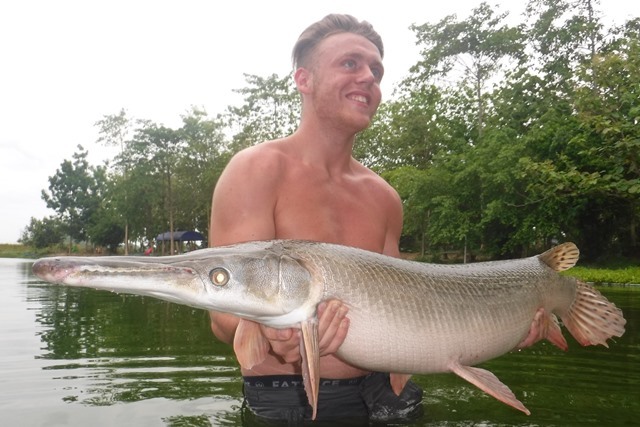 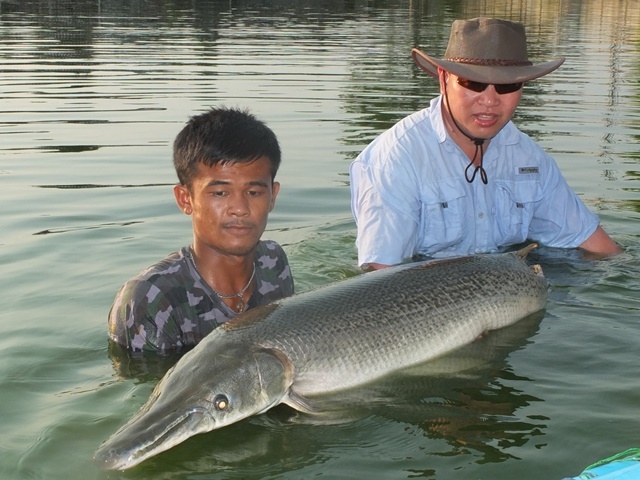 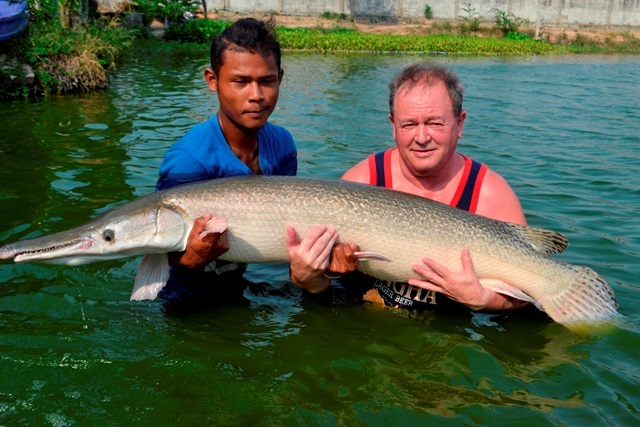 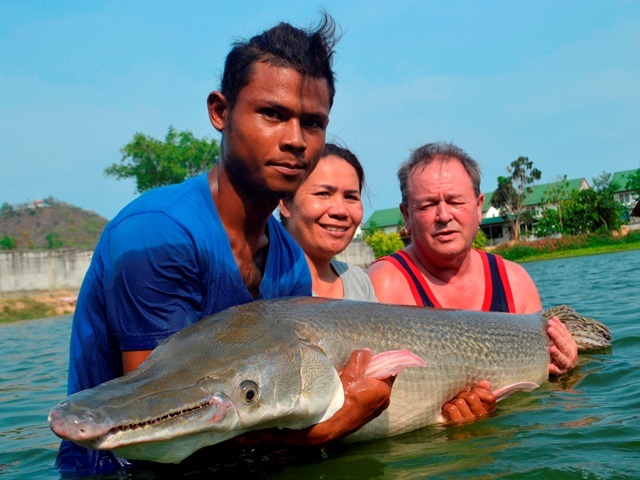 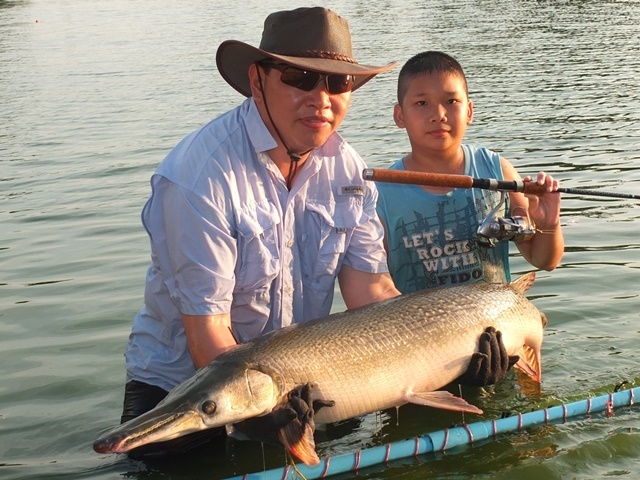 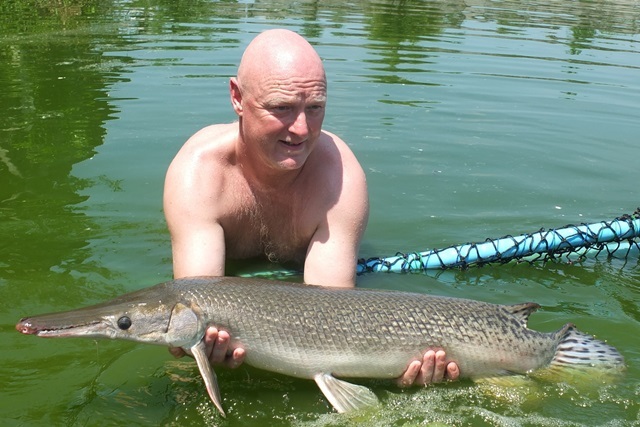 The guides of course had a dabble during the month catching a variety of species that included Mekong catfish, big-Y catfish, rohu, leopard catfish, wallago leeri and a very impressive alligator gar. 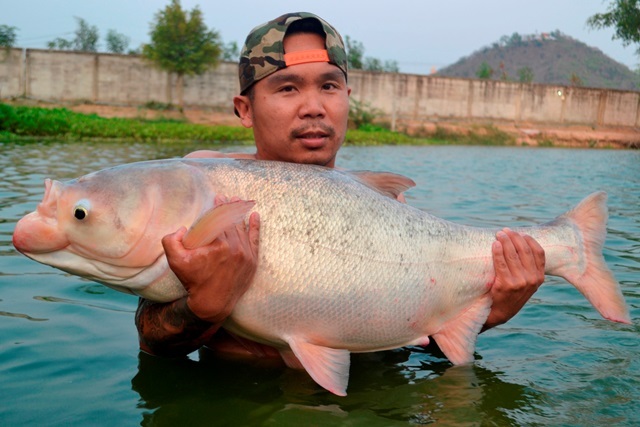 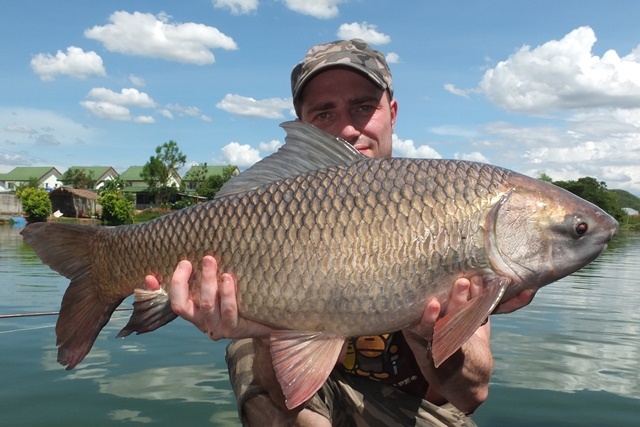 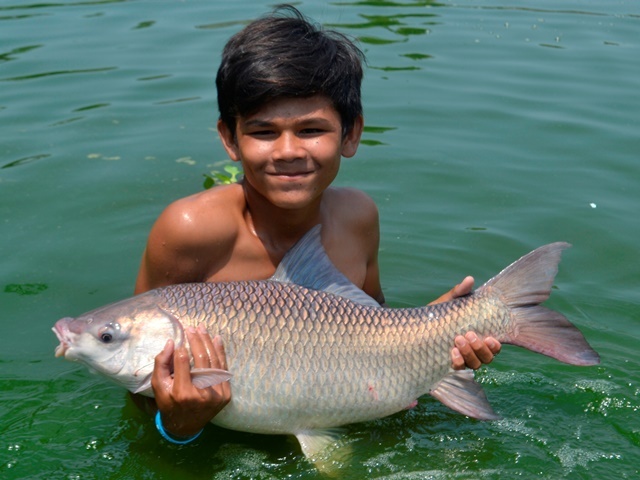 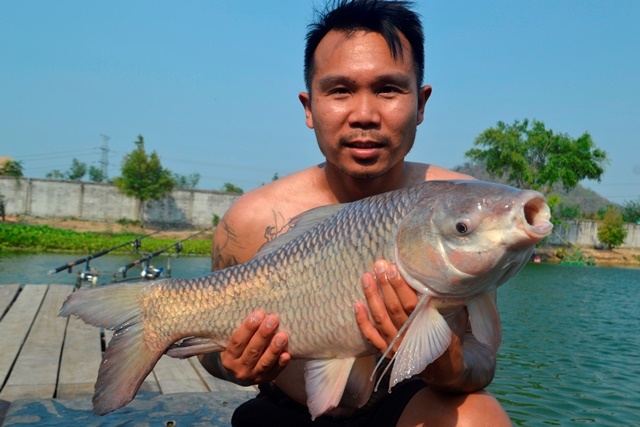 Tap of Bangkok Fishing Guide Service customer Cristofre Martin from his fourth visit of the month seemed more than happy with his Siamese carp plus a number of Amazon redtails. 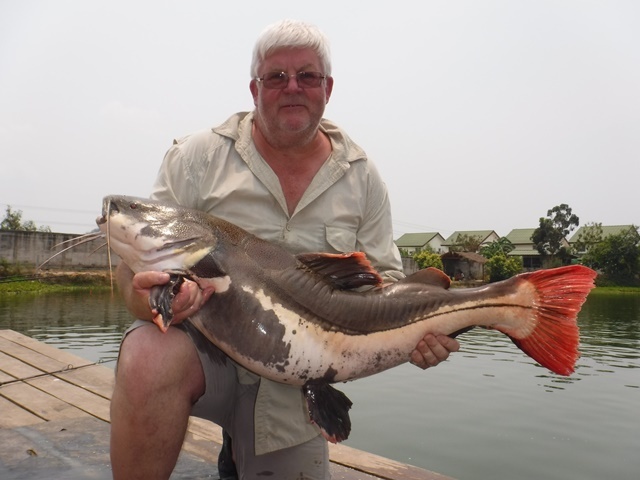 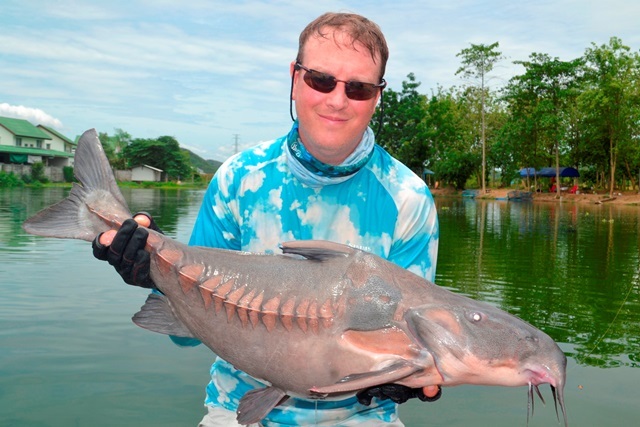 A passing angling enthusiast dropped in for a quick session and successfully caught Mekong catfish and Amazon redtail.